The Tookaidoo Shinkansen (東海道新幹線) is a Japanese high-speed Shinkansen line, opened in 1964 between Tokyo and Shin-Ōsaka. Since 1987 it has been operated by the Central Japan Railway Company (JR Central), prior to that by Japanese National Railways (JNR). It is the most heavily travelled high-speed rail route in the world by far; its cumulative ridership of 5.3 billion passengers dwarfs all other systems and lines worldwide. The line was named a joint Historic Mechanical Engineering Landmark and IEEE Milestone by the American Society of Mechanical Engineers and the Institute of Electrical and Electronics Engineers in 2000. There are three types of trains on the line: from fastest to slowest, they are the Nozomi, Hikari, and Kodama. Many Nozomi and Hikari trains continue onward to the Sanyō Shinkansen, going as far as Fukuoka’s Hakata Station. 700 series and N700 series train sets operate on the line in any of the three service patterns. The Hikari run from Tokyo to Osaka took four hours in 1964; this was shortened to 3 hours 10 minutes in 1965. With the introduction of high-speed Nozomi service in 1992, the travel time was shortened to 2 hours 30 minutes. 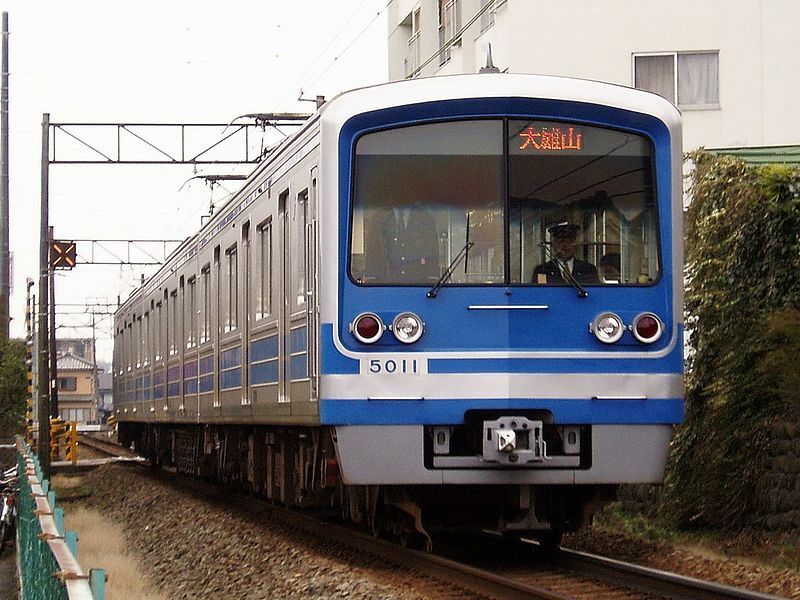 The introduction of N700 series trains in 2007 further reduced the Nozomi travel time to 2 hours 25 minutes. As of 14 March 2015, after a speed increase to 285 km/h (177 mph), the fastest Nozomi service now takes 2 hours 22 minutes from Tokyo to Shin-Osaka. As of August 2008, Hikari services travel from Tokyo to Shin-Osaka in approximately 3 hours, with all-stopping Kodama services making the same run in about 4 hours. Nozomi trains cannot be used by tourists using the Japan Rail Pass. 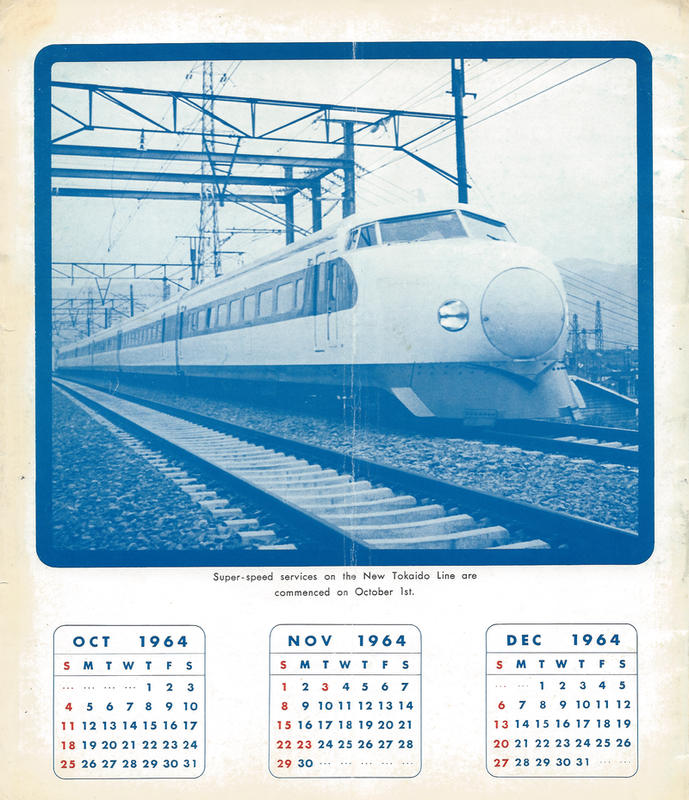 The back cover of the first English-language timetable with the Tokaido Line Shinkansen service which launched on 1 October 1964. The Tookaidoo Shinkansen line was originally conceived in 1940 as a 150 km/h (93 mph) dedicated railway between Tokyo and Shimonoseki, which would have been 50% faster than the fastest express train of the time. The beginning of World War II stalled the project in its early planning stages, although a few tunnels were dug that were later used in the Shinkansen route. Construction of the line began on 20 April 1959 under JNR president Shinji Sogō and chief engineer Hideo Shima. It was completed in 1964, with the first train travelling from Tokyo to Shin-Osaka on 1 October 1964 at 210 km/h (130 mph). The opening was timed to coincide with the 1964 Summer Olympics in Tokyo, which had already brought international attention to the country. Originally, the line was called the New Tookaidoo Line in English. It is named after the Tookaidoo route of Japan, used for centuries. Speeds have been increased to 285 km/h (177 mph), except for lower limits applying between Tokyo and Shin-Yokohama and in densely populated urban areas around Nagoya, Kyoto and Shin-Osaka stations. A new Shinkansen stop at Shinagawa Station opened in October 2003, accompanied by a major timetable change which increased the number of daily Nozomi services. A new station, Minami-Biwako, was planned to open in 2012 between Maibara and Kyoto to allow a transfer to the Kusatsu Line. Construction started in May 2006, but in September 2006, the Ōtsu district court ruled that the ¥4.35 billion bond that Rittō city had issued to fund construction was illegal under the local finance law and had to be cancelled. The project was officially cancelled in October 2007. An ultra-fast (500 km/h (311 mph) plus) maglev system, the Chūō Shinkansen, has been committed to construction, with a target date of 2020 for the line to start partial operation, and 2027 to connect Tokyo with Nagoya. It was announced in June 2010 that a new shinkansen station in Samukawa, Kanagawa Prefecture was under consideration by JR Central. If constructed, the station would open after the new maglev service begins operations. 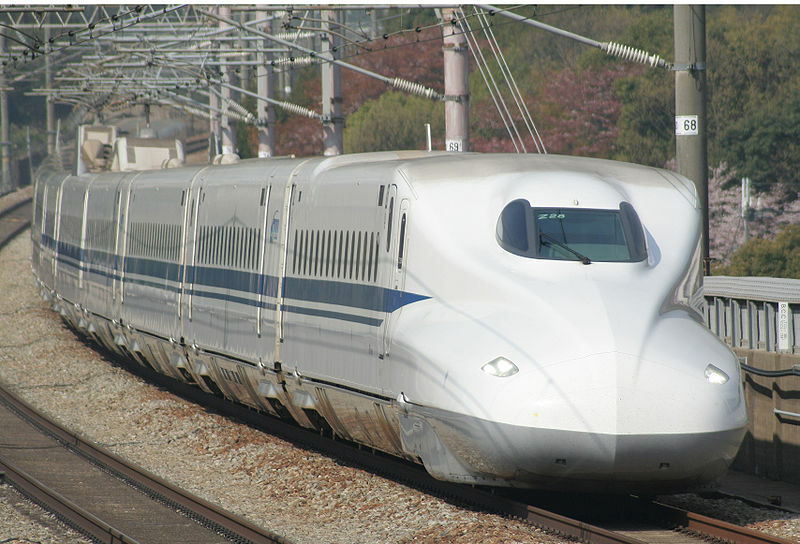 In December 2013, JR Central president Yoshiomi Yamada announced the operating company’s intentions to raise the maximum line speed beyond 270 km/h, with a revised timetable to be introduced in spring 2015. In February 2014, JR Central announced that, from spring 2015, the maximum speed would be increased to 285 km/h (175 mph) for services using N700A or modified N700 series trains. Initially, just one service per hour will run at 285 km/h, with more services gradually added later. 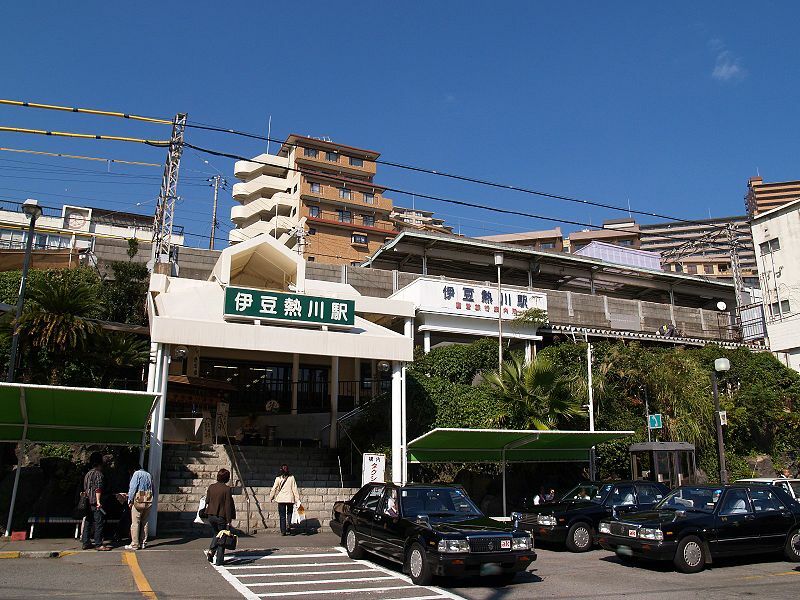 Atami Station opened on March 25, 1925. 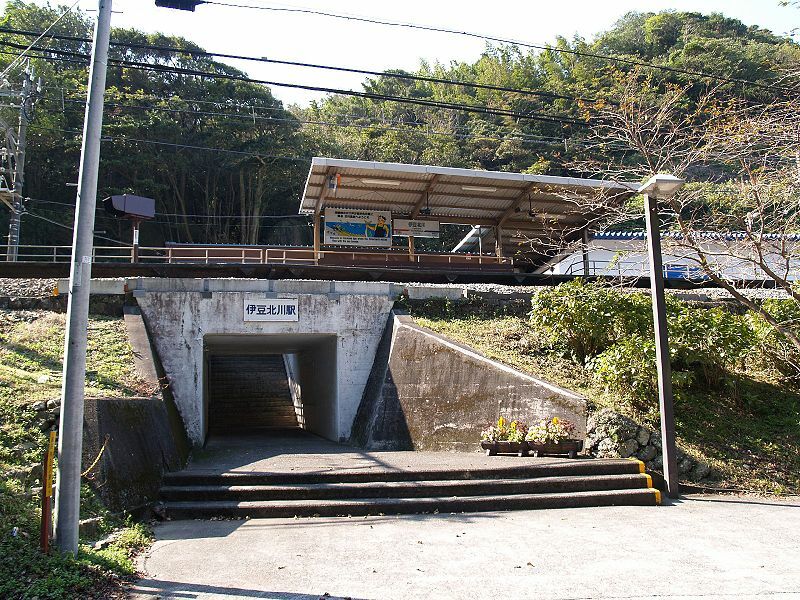 On December 1, 1934 the Tanna Tunnel was completed, and through service to Mishima and Numazu began. The Itō Line began operations at Atami from March 30, 1935. The Tookaidoo Shinkansen began operations at Atami from October 1, 1964. 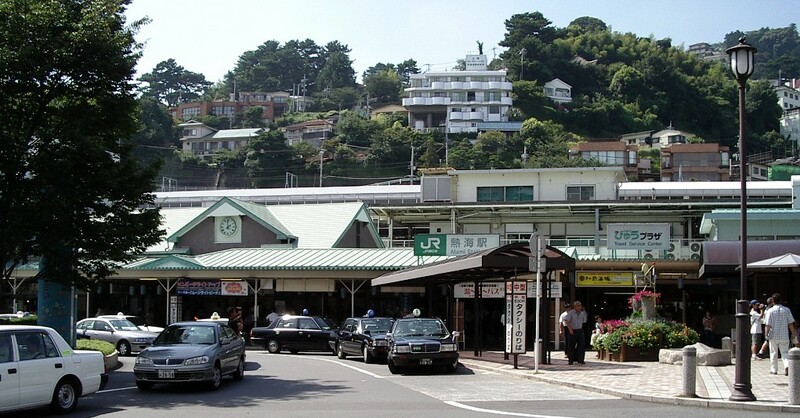 Atami Station is served by the Tookaidoo Main Line, Tookaidō Shinkansen, and Itō Line. The station is 104.6 km from Tokyo Station. 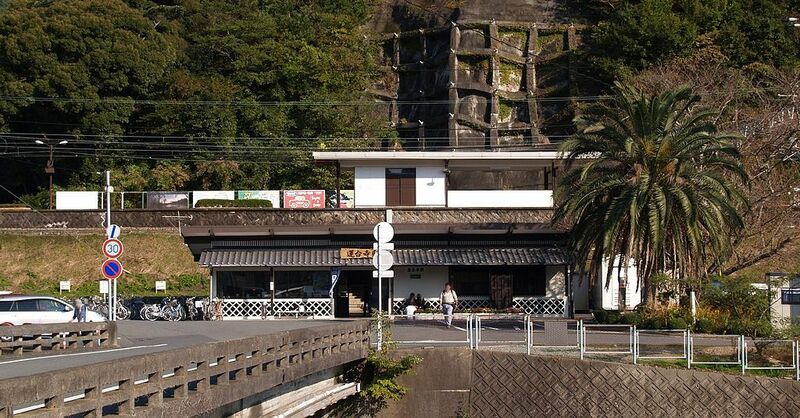 Due to its location on the side of a steep hill, Atami Station is built on several levels. On the lowest level is the station building itself, with automated ticket machines, Suica automated turnstiles and a manned “Green Window” service counter. The Tookaidoo Main Line and Itō Line share one side platform and two island platforms with five tracks connected by an underpass to the station building. The Tookaidoo Shinkansen with two opposing side platforms is one level higher, and is connected to the non-express platforms by an underpass. 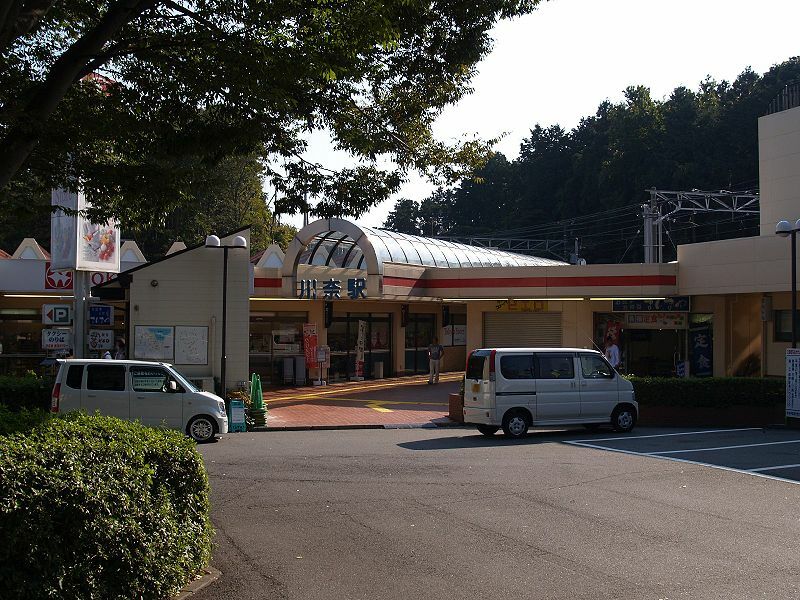 The original Mishima Station was opened on June 15, 1896 in the town of Nagaizumi. However, with the completion of the Tanna Tunnel between Atami and Numazu, this station was renamed Shimo-Togari Station, and a new Mishima Station was opened at its present location on December 1, 1934. The terminus of the Izuhakone Railway was also relocated to Mishima Station at this time. 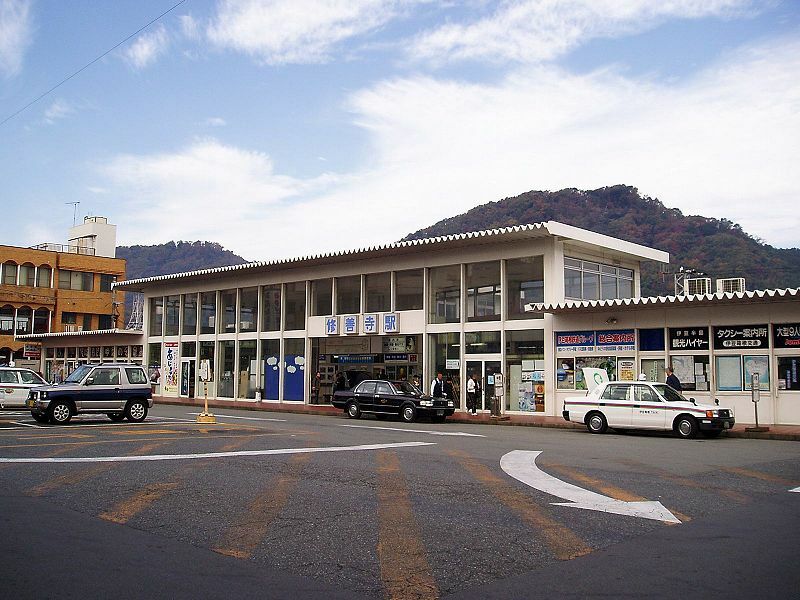 On April 25, 1969, Tokaidoo Shinkansen services began serving Mishima Station. 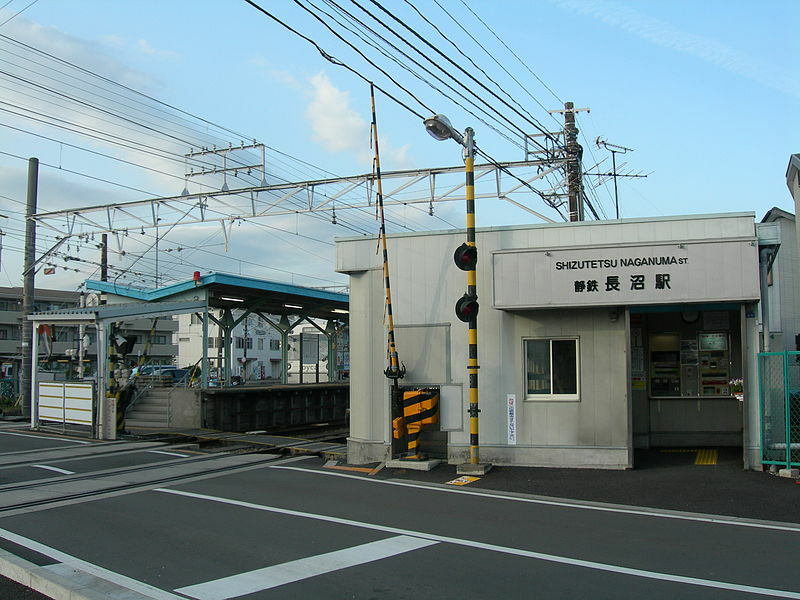 Regularly scheduled freight service was discontinued in 1974, however, private freight services to the Toray Industries Mishima plant continued on a spur line until 2007. 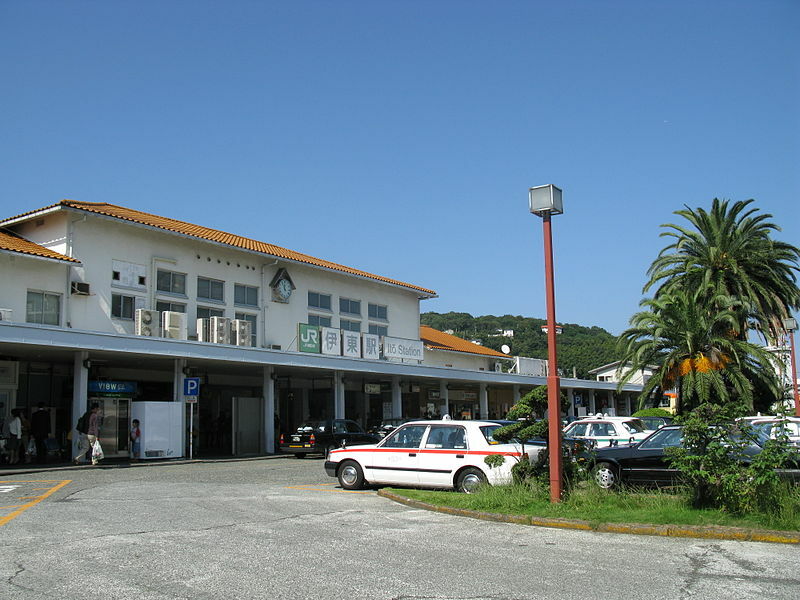 In 2008, Mishima Station was extensively remodeled, and an ASTY shopping complex was opened at the station. JR Mishima Station has two island platforms serving tracks 1 to 4. Track 2 and Track 3 are the primary tracks for the Tokaido Main Line, with Tracks 1 and 4 used for through passage of express trains. The Tokaido Shinkansen uses Tracks 5 and 6, which are served by a separate island platform. 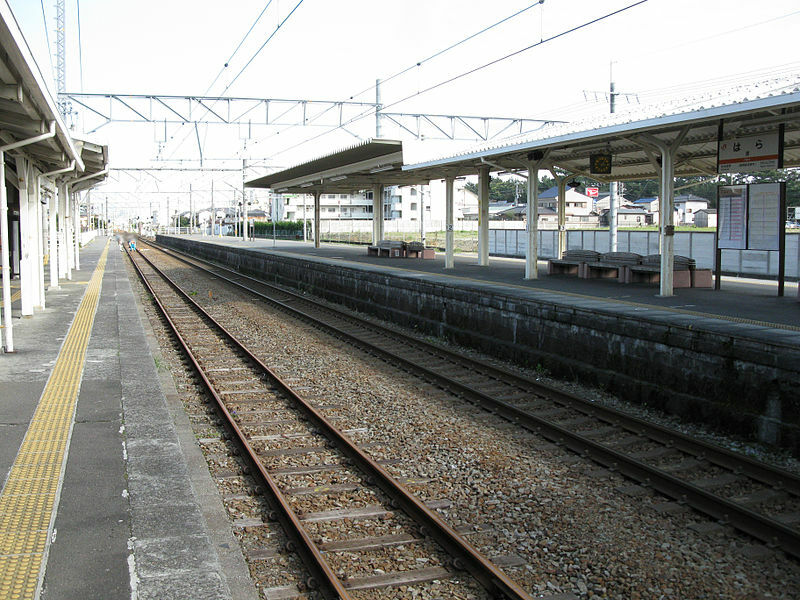 The adjacent Izuhakone Railway has one side platform and two bay platforms serving Tracks 7, 8 and 9. All platforms are connected by an underpass to a central concourse leading to the station building. The station building has automated ticket machines, TOICA automated turnstiles and a staffed Midori no Madoguchi ticket office. Shin-Fuji Station opened on March 13, 1988. 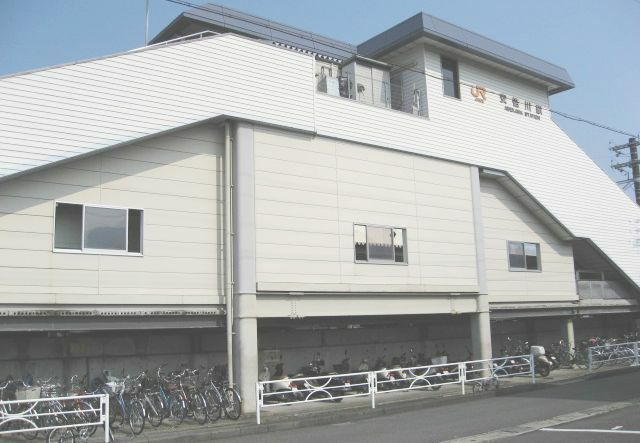 The station is located in an industrial area, initially with few residences, stores, or connecting lines, and was a stop only for the Kodama service on the Tokaido Shinkansen. Shin-Fuji Station is served by the Tokaido Shinkansen, and is located 146.2 km (90.8 mi) from the eastern terminus of the line at Tokyo Station. 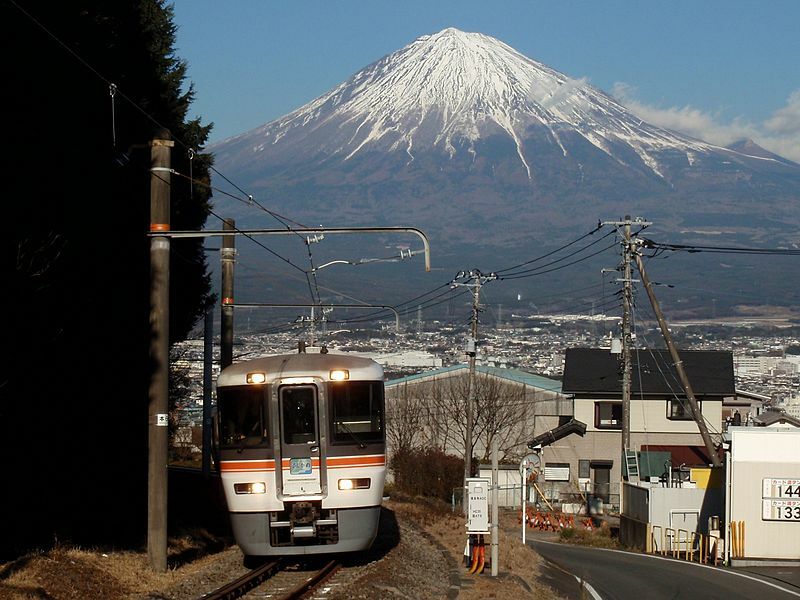 There are no connecting rail lines to Shin-Fuji, with the nearest connecting being located at Fuji Station 2 km (1.2 mi) away. A connecting bus service runs several times an hour taking approximately 7 minutes. Shizuoka station first opened on February 1, 1889, when the section of the Tookaidoo Main Line connecting Shizuoka with Kōzu was completed. A grand opening ceremony had been planned, but on this day a huge fire destroyed over 1,000 buildings in downtown Shizuoka. Railroad Minister Inoue Masaru cancelled his planned visit, and later the same day, the town around Gotemba Station, also in Shizuoka Prefecture, burned down. The initial Shizuoka Station building was rebuilt in 1907 and again in 1935. The Tookaidoo Shinkansen platforms were opened in 1964. In 1967, freight operations were relocated from Shizuoka Station to Higashi-Shizuoka Station (the present-day Shizuoka Freight Terminal). 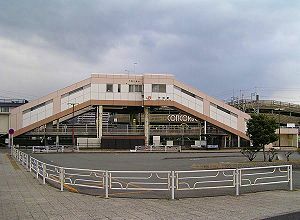 The station underwent a massive rebuilding program from the late 1970s, with the Tōkaidō Main Line tracks elevated in 1979 to the same level as the Tōkaidō Shinkansen tracks, and the Parche shopping center/new station building completed in 1981. From 2006 to 2008, major renovations took place inside and around the station, including the underground walkways to and from the station, and the Asty shopping and dining complexes adjoined to the station. Shizuoka Station has four platforms serving six tracks. Two island platforms with Tracks 1–4 serve the Tookaidoo Main Line trains, and long distance night trains. These platforms are connected with the station concourse via an underpass and are also connected at the same level to the Tookaidoo Shinkansen platforms. The Shinkansen station consists of two opposing side platforms serving two tracks, with two central tracks for non-stop trains. The station building has automated ticket machines, TOICA automated turnstiles, and a manned “Green Window” service counter. Kakegawa Station was first opened on April 16, 1889 when the section of the Tōkaidō Main Line connecting Shizuoka with Hamamatsu was completed. In 1935 the first section of the Tenryū Hamanako Line opened, with Kakegawa Station as its terminus. Regular freight service was discontinued in 1984. On March 13, 1988 the Tōkaidō Shinkansen platforms opened on the south side of the station. JR Kakegawa Station has five platforms serving eight tracks. The Tookaidoo Main Line Track 1 is served by a side platform connected to the main station building’s north exit and the Tenryū Hamanako Line station. It is used for departing both east and west. Track 2 and Track 3 are served by an island platform. Both platforms are connected to the station building by an underpass, which also connects to the two elevated side platforms used by the Shinkansen (Track 4 and Track 5). The north side of the station is a wooden structure dating from 1940. The station building has automated ticket machines, TOICA automated turnstiles and a manned “Green Window” service counter. Transfer is available from the JR line to the Tenryū Hamanako Line, whose terminus bay platform is in a separate building adjacent to the north exit of the JR station. Hamamatsu Station was officially opened on September 1, 1888. The station building was rebuilt in 1926, but this burned down during the Bombing of Hamamatsu in World War II. The station was rebuilt in 1948. On October 1, 1964, the Tōkaidō Shinkansen began operations, serving Hamamatsu. Freight operations were relocated to the Nishi-Hamamatsu Freight Depot to the west in 1971. 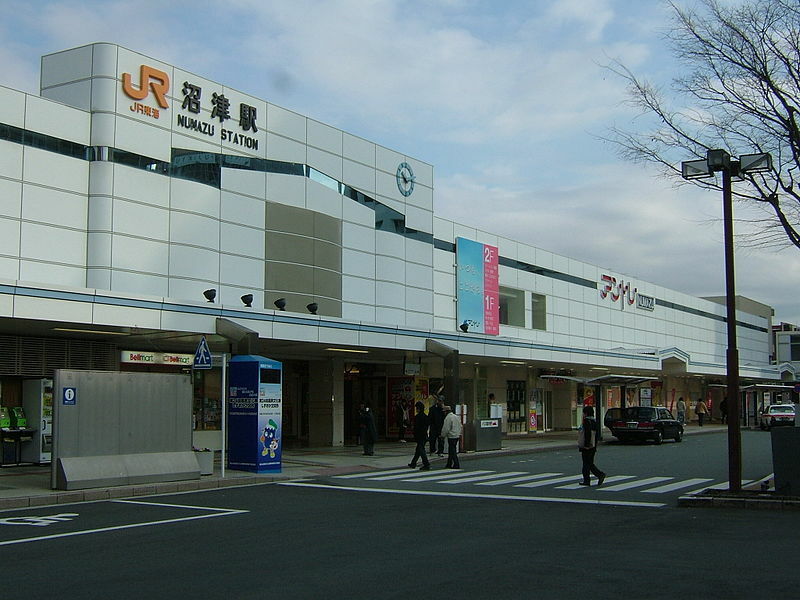 The station underwent a massive rebuilding program from the late 1970s, with the Tōkaidō Main Line tracks elevated in 1979 to the same level as the Tōkaidō Shinkansen tracks, and the “MayOne” shopping centre/new station building completed in 1981. Hamamatsu Station has two island platforms serving Tracks 1-4 for the Tōkaidō Shinkansen, which are connected by an underpass a central concourse. At the same level as the Shinkansen tracks are the two island platforms serving Tracks 5-8 of the Tōkaidō Main Line. The station building has automated ticket machines, TOICA automated turnstiles and a manned “Midori no Madoguchi” ticket counter. The Tookaidoo Main Line (東海道本線 Tookaidoo-honsen) is a major Japanese railway line of the Japan Railways Group (JR Group) network, connecting Tokyo and Kōbe stations. It is 589.5 km (366.3 mi) long, not counting its many freight feeder lines around the major cities. The high-speed Tokaido Shinkansen largely parallels the line. The term “Tōkaidō Main Line” is largely a holdover from pre-Shinkansen days; now various portions of the line have different names which are officially used by JR East, JR Central, and JR West. Today, there are no passenger trains that operate over the entire length of the line (other than certain overnight services; see below), so longer intercity trips require several transfers along the way. The Tokaido Line between Atami and Maibara is operated by JR Central, and covers the Tōkai region – Shizuoka Prefecture, Aichi Prefecture, and Gifu Prefecture. The Tookaidoo route takes its name from the ancient road connecting the Kansai region (Kyoto, Osaka) with the Kantō region (Tokyo, then Edo) through the Tookai region (including Nagoya). Literally, it was the Tookai road, or Road through Tōkai. The Tookaidoo Line does not follow the old road exactly, since the latter diverges at Nagoya toward the Mie Prefecture coastline; to follow it by train, the Kansai Main Line and Kusatsu Line would have to be followed from Nagoya to Kusatsu. The largest population centers in Japan are along this route – Tokyo, Yokohama, Nagoya, Kyoto, Osaka and Kobe. These centers have grown to occupy an ever more dominant role in the country’s government, financial, manufacturing and cultural life. Historically, one of the first priorities of Japanese railway planners was to build a line from Tokyo to the Kansai region, either following the Tokaido route or the northern Nakasendō route. This decision remained unresolved as regional needs were addressed. The first railway in Japan was the line from Shinbashi to Sakuragicho in Yokohama, which opened in 1872; another segment of today’s Tokaido Main Line, between Kyoto and Kobe, opened in 1877. In 1883, the government decided to use the Nakasendo route, and construction of several segments commenced (including the modern-day Takasaki Line). Railways were opened between Ogaki and Nagahama (1884) and between Nagoya and Kisogawa (1886) in line with the Nakasendo plan. However, by 1886, it was clear that the Tokaido route would be more practical, and so the Nakasendo plan was abandoned. The lines between Kisogawa and Ogaki, Yokohama and Kozu, and Hamamatsu and Obu were completed in 1887, and the first line from Tokyo to Kobe was completed in 1889, when Kozu and Hamamatsu were connected through the present-day Gotemba Line corridor, and the final segments were completed between Kasumigahara and Otsu. At the time, there was one Tokyo-Kobe train in each direction per day, taking over 20 hours each way. The “Tokaido Line” name was formally adopted in 1895. In October 1895, following the Sino-Japanese War, through service to the Sanyo Railway (now Sanyo Main Line) began. Express service between Tokyo and Kobe began in 1896, sleeper service in 1900, and dining car service in 1901. In 1906, all privately run main lines were nationalized under the newly created Japan Imperial Railway, which, at the time had a network of just over 7000 km. Automatic couplers were introduced on all freight wagons in 1926. In 1930, the first Tsubame (“swallow”) express was introduced, reducing the Tokyo – Kobe travel-time to nine hours – a significant reduction from the twenty hours required in 1889 and fifteen in 1903. Infrastructure improvements included the completion of double track on this route in 1913, and the opening of the 7.8 km long Tanna Tunnel, which shortened the route by omitting a detour round the mountains between Atami and Numazu. This was the last major change to the alignment of the route. By the early 1950s the Tookaidoo Line had become the main transportation artery of Japan. Although it was only 3 percent of the railway system by length, it carried 24 percent of JNR’s passenger traffic and 23 percent of its freight, and the rate of growth was higher than any other line in the country. By 1956 electrification was completed along the Tokyo-Osaka section and with the introduction of new Kodama trains, travel time was reduced to six and a half hours. The line became so popular that tickets regularly sold out within ten minutes of being put on sale, one month in advance of the travel date. The capacity constraints on the Tookaidoo Main Line had been clear prior to World War II, and work started on a new 1,435 mm (4 ft 8 1⁄2 in) standard gauge “bullet train” line in 1940. Intercity passenger traffic between Tokyo, Nagoya and Osaka largely transferred to the Tookaido Shinkansen after it was completed in 1964. Since then, the Tokaido Main Line has been used as a commuter and freight line, serving a very small number of long-distance passenger trains (mainly overnight and sleeper services). Atami Station: In 1895, a 10 km 610 mm (2 ft) gauge handcar line opened to Yoshihama, and was extended 4 km to Odawara the following year. In 1907, the line was converted to 762 mm (2 ft 6 in) gauge and steam locomotives were introduced. The line closed in 1923 as a result of the Great Kanto earthquake. Numazu Station: The Shuname Railway opened a 7 km line to Mishima-Tamachi on the Izuhakone Railway Sunzu Line in 1906. In 1915, the line was truncated 1 km to connect at Mishima-Hirokoji, and the line was electrified at 600 V DC in 1919. The line closed in 1961 following the destruction of the Kisegawa bridge during a flood. Yoshiwara Station: The Fuji Horse Tramway (富士馬車鉄道 Fuji Basha Tetsudō?) opened a 610 mm (2 ft) gauge line to Ōmiya (presentday Fujinomiya) in 1890. The Fuji Minobu Railway (富士身延鉄道 Fuji Minobu Tetsudō?) purchased the tramway in 1912, converted it to a 1,067 mm gauge steam railway the following year and gradually extended it (eventually becoming the Minobu Line). In 1924, the company built a new alignment which connected to Fuji station on the Tokaido main line, at which time the original section from Omiya to Yoshiwara closed. 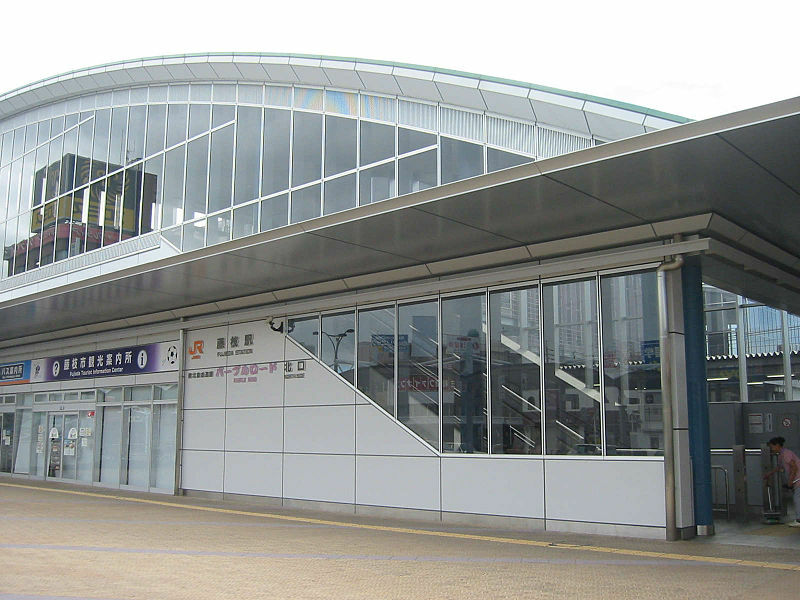 Shimizu Station: The JGR opened a 2 km freight-only line to Shimizu wharf in 1916. In 1944, the line was extended 6 km to Miha and passenger services were introduced. The line closed in 1984. Shizuoka Station: The Abe Railway opened a 9 km 762 mm (2 ft 6 in) gauge line from Inomiya (approximately 2 km from Shizuoka) to Ushizuma in 1914 to haul timber. Plans to extend the line to Shizuoka did not eventuate and the line closed in 1934.
he Shizuoka Electric Railway opened a 2 km line to Anzai, connecting to its Shimizu Line, electrified at 600 V DC, between 1922 and 1926. The line closed in 1962. 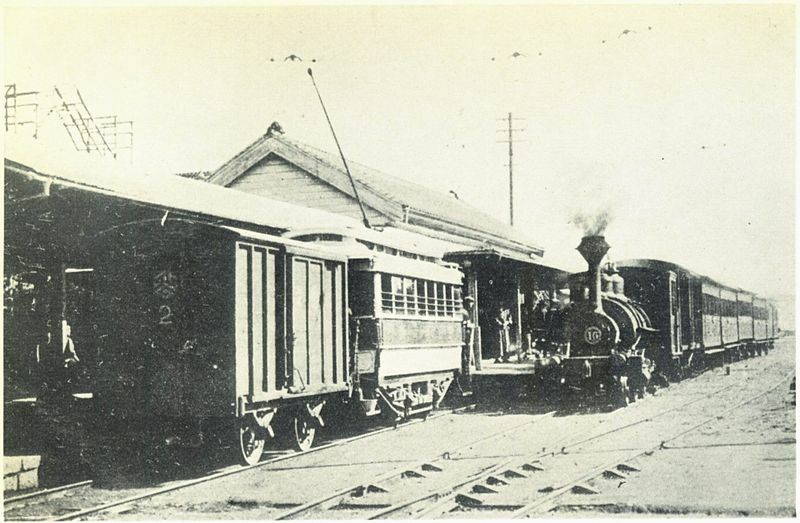 Yaizu Station: A 5 km 610 mm (2 ft) handcar line operated to Fujieda between 1891 and 1900. Fujieda Station: The Fuji-sho Railway opened a 4 km 762 mm (2 ft 6 in) gauge line to Ote in 1913, and by 1926 had extended the line progressively in both directions for a length of 38 km from Jitogata to Suruga-Okabe, although in 1936 the 5 km section from Suruga-Okabe to Ote was closed. 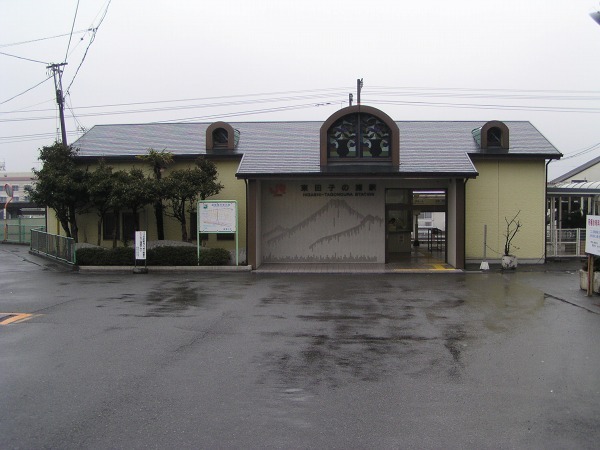 In 1943, the company merged with the Shizuoka Railway (see Fujiroi Station below), and in 1948, a 7 km line between Mitsumata and Jitogata opened, linking the two sections. This section of the combined line closed between 1964 and 1970. Shimada Station: The Fuji Prefectural Government opened a 3 km 610 mm (2 ft) gauge handcar line in 1898 to haul timber. In 1944, following the destruction of the nearby Tokaido Line bridge over the Oigawa, it was proposed to use the alignment of this line as a replacement, including a 930 m wooden bridge over the river. The bridge was about 25% completed when the end of the war resulted in the termination of the proposal. A diesel locomotive was introduced in 1955 to haul construction material for the construction of the adjacent national highway, and the line closed in 1959. Kikukawa Station: The Joto horse-drawn tramway opened a 15 km 2 ft (610 mm) gauge line to Ikeshinden in 1899. In 1923, the line was converted to 762 mm (2 ft 6 in) gauge, and a single-cylinder diesel locomotive introduced. The line closed in 1935. Fukuroi Station: The Akiba horse-drawn tramway opened a 12 km 762 mm (2 ft 6 in) gauge line to Enshumori-Cho in 1902. In 1926, the company renamed itself the Shizuoka Electric Railway, converted the line to 1,067 mm (3 ft 6 in) gauge and electrified it at 600 V DC. The line closed in 1962. The Shizuoka Railway opened a 10 km 762 mm (2 ft 6 in) gauge line to Yokosuka in 1914, extending it 7 km to Mitsumata in 1927. The company merged with the Fuji-sho Railway in 1943 (see Fujieda Station above), and in 1948, a 7 km line between Mitsumata and Jitogata opened, linking the two sections. This section of the combined line closed between 1964 and 1967. Hamamatsu Station: The Dainippon Railway opened a 7 km, 762 mm (2 ft 6 in) gauge line to Kuniyoshi in 1909. In 1919, the line was acquired by the Enshu Railway Line, which closed the first 1 km of the line in 1925, so the new connecting station became Enshu-Magome. The line closed in 1937. Atami Station opened on March 25, 1925. On December 1, 1934 the Tanna Tunnel was completed, and through service to Mishima and Numazu began. The Itō Line began operations at Atami from March 30, 1935. The Tōkaidō Shinkansen began operations at Atami from October 1, 1964. Atami Station is served by the Tōkaidō Main Line, Tōkaidō Shinkansen, and Itō Line. The station is 104.6 km from Tokyo Station. 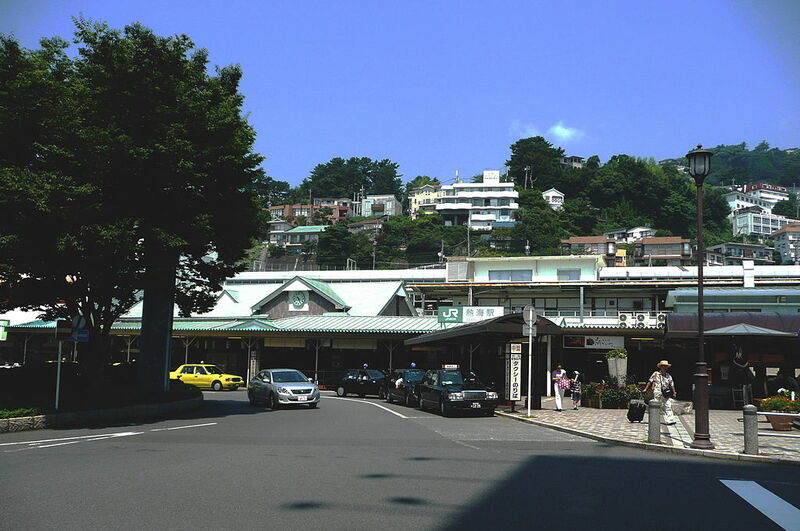 Due to its location on the side of a steep hill, Atami Station is built on several levels. 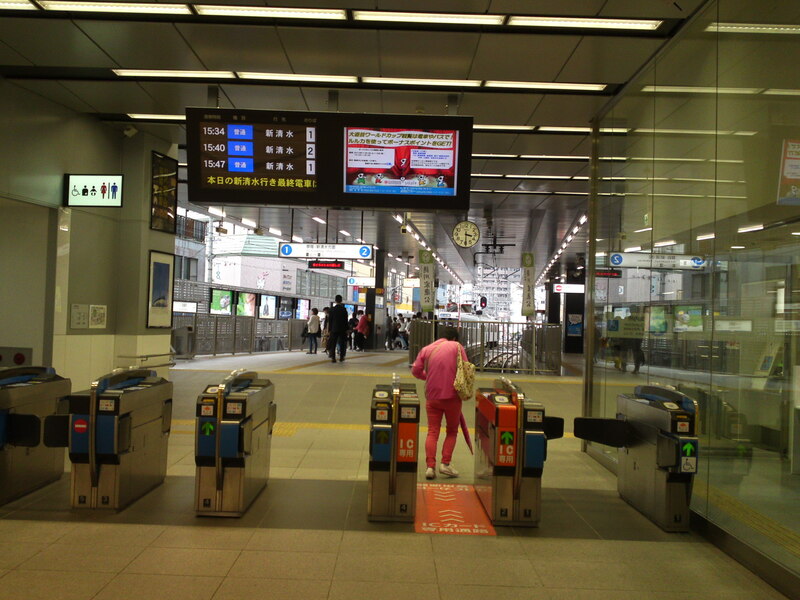 On the lowest level is the station building itself, with automated ticket machines, Suica automated turnstiles and a manned “Green Window” service counter. The Tōkaidō Main Line and Itō Line share one side platform and two island platforms with five tracks connected by an underpass to the station building. The Tōkaidō Shinkansen with two opposing side platforms is one level higher, and is connected to the non-express platforms by an underpass. Kannami Station was opened on December 1, 1934 when the section of the Tōkaidō Main Line connecting Atami with Numazu via the Tanna Tunnel was completed. Regularly scheduled freight service was discontinued in 1971. TOICA automated gates were installed in 2008. It has a single Island platform serving Track 1 and Track 2, which are on passing loops with outside tracks to permit the through transit of express trains. The platform is connected to the station building by an overpass. The station building has automated ticket machines, TOICA automated turnstiles and a manned “Green Window” service counter. 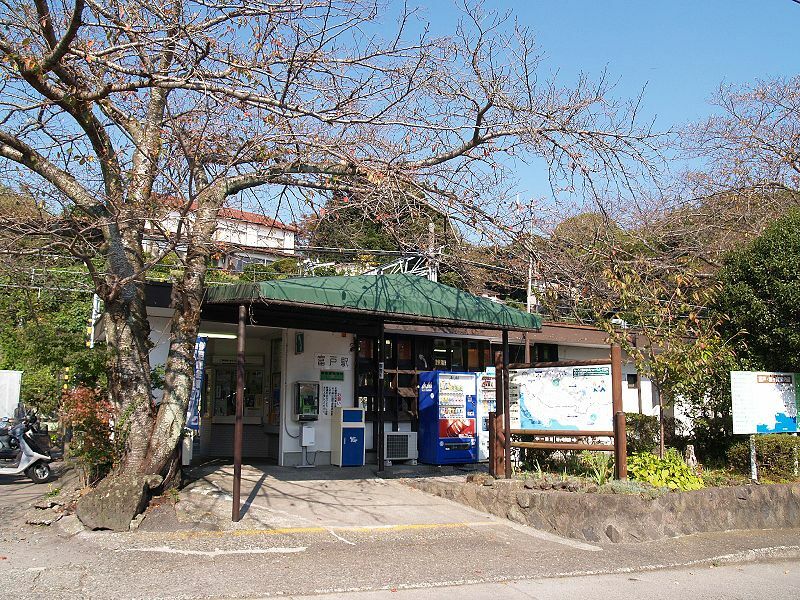 The original Mishima Station was opened on June 15, 1896 in the town of Nagaizumi. However, with the completion of the Tanna Tunnel between Atami and Numazu, this station was renamed Shimo-Togari Station, and a new Mishima Station was opened at its present location on December 1, 1934. 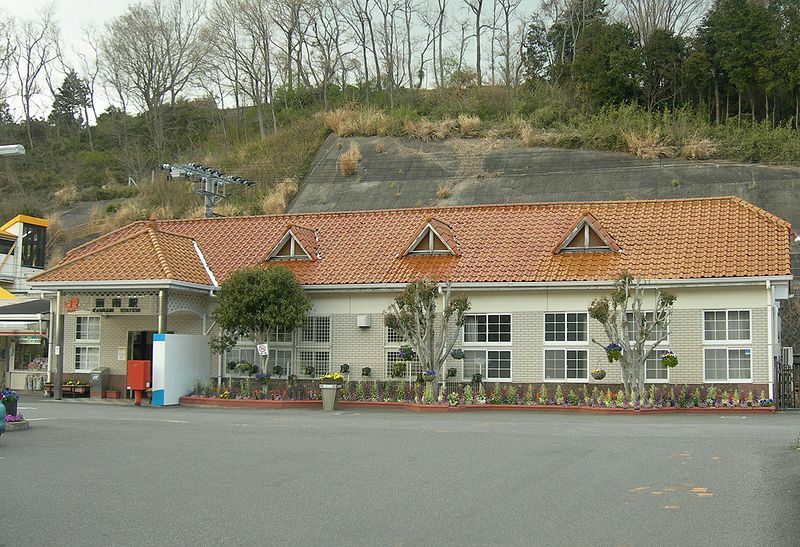 The terminus of the Izuhakone Railway was also relocated to Mishima Station at this time. 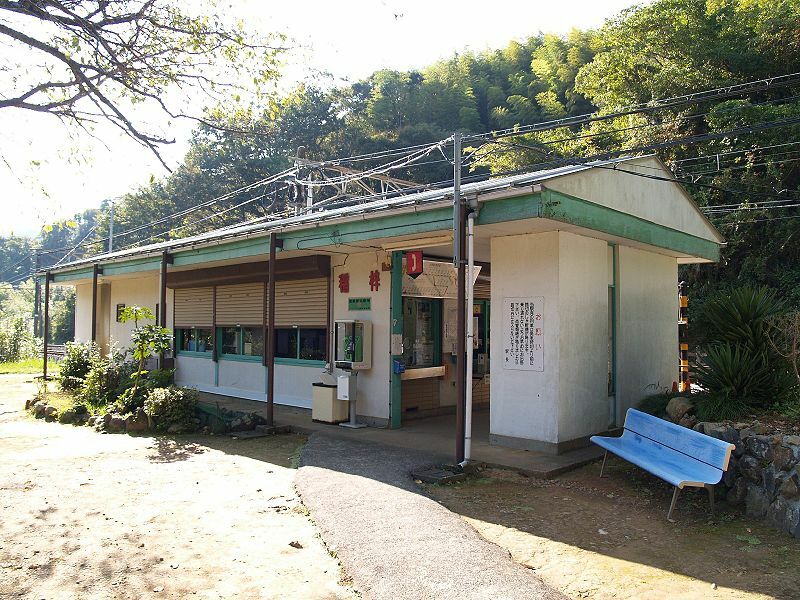 On April 25, 1969, Tokaido Shinkansen services began serving Mishima Station. Regularly scheduled freight service was discontinued in 1974, however, private freight services to the Toray Industries Mishima plant continued on a spur line until 2007. 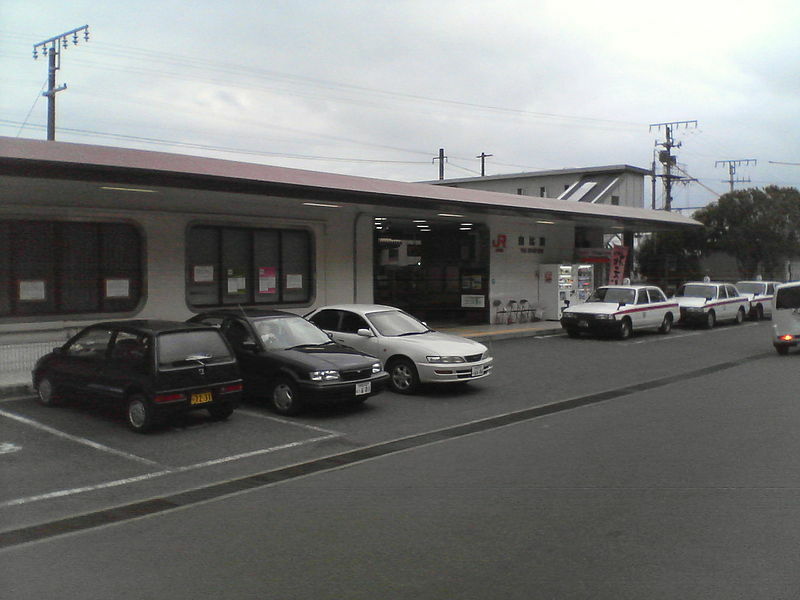 In 2008, Mishima Station was extensively remodeled, and an ASTY shopping complex was opened at the station. Mishima Station is served by the following lines. JR Mishima Station has two island platforms serving tracks 1 to 4. Track 2 and Track 3 are the primary tracks for the Tokaido Main Line, with Tracks 1 and 4 used for through passage of express trains. The Tookaidoo Shinkansen uses Tracks 5 and 6, which are served by a separate island platform. 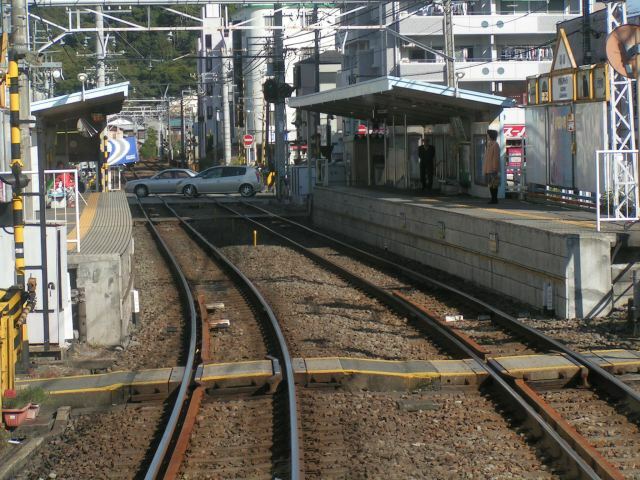 The adjacent Izuhakone Railway has one side platform and two bay platforms serving Tracks 7, 8 and 9. All platforms are connected by an underpass to a central concourse leading to the station building. 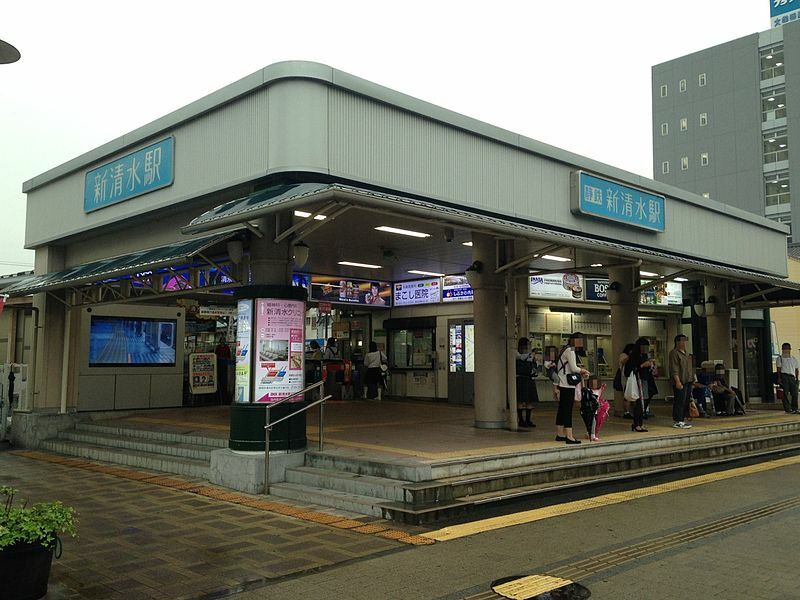 The station building has automated ticket machines, TOICA automated turnstiles and a staffed Midori no Madoguchi ticket office. Numazu Station opened on February 1, 1889 when the section of the Tōkaidō Main Line connecting Shizuoka with Kōzu was completed. A spur line to nearby Numazu Port was established in 1899. The first station building burned down in a fire of 1913 and the second in a fire of 1926. On December 1, 1934, Numazu was connected directly with Atami Station via the Tanna Tunnel, thus eliminating the previous long detour north to Gotemba Station in the section between Tokyo and Shizuoka. Numazu Station was rebuilt in 1937, but was burned down again, this time in the Bombing of Numazu in World War II. The next station building was erected in 1953, and rebuilt in 1973. Numazu Station is served by the Tōkaidō Main Line from Tokyo and also the Gotemba Line. It lies 126.2 km from Tokyo Station. Numazu Station has three ground-level island platforms serving six tracks, connected to each other and to the station building by both an overpass and an underpass. The station building has automated ticket machines, TOICA automated turnstiles and a “Midori no Madoguchi” staffed ticket office. Katahama Station was opened on March 21, 1987, the last train station to be built by the Japanese National Railways (JNR) before its privatization. 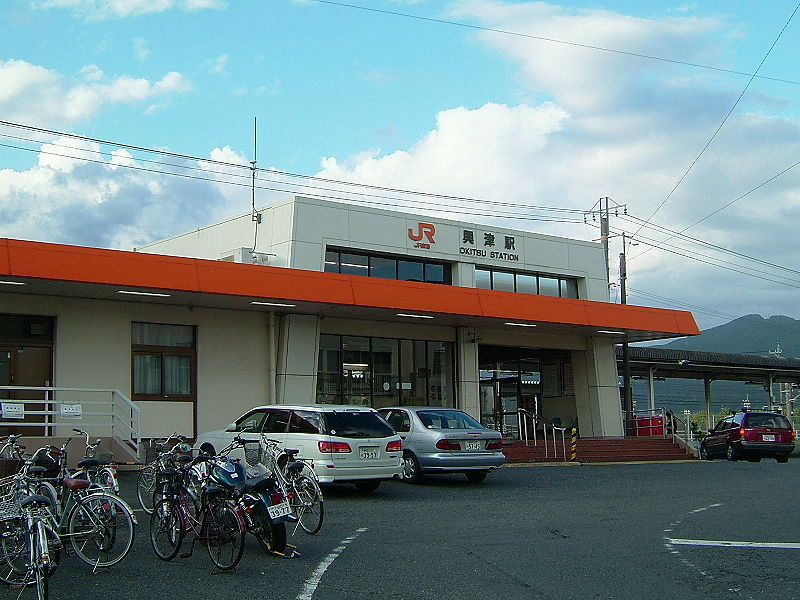 With the privatization of JNR on 1 April 1987, the station came under the control of JR East. The station has two opposing side platforms serving two tracks, with the station building built on the overpass connecting the platforms. The station building has automated ticket machines, TOICA automated turnstiles, and a “Midori no Madoguchi” staffed ticket office. ara Station was opened on February 25, 1900 as part of the expansion of the Tōkaidō Main Line from Numazu Station to Yoshiwara Station. The original station building was rebuilt in 1948. 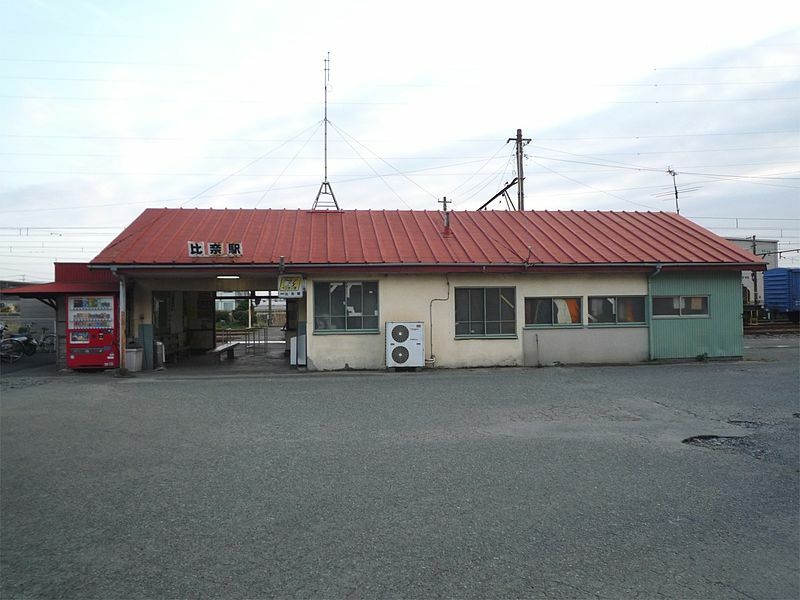 Regularly scheduled freight services were discontinued from 1984, and charter freight from 1997; however, freight services continue along a privately held spur line to a freight terminal owned by Taiheiyo Cement a short distance from Hara Station. Hara Station has a single side platform serving Track 1 and an island platform serving Track 2 and Track 3, connected to the station building by an overpass. Track 1 is not in regular use. The station building has automated ticket machines, TOICA automated turnstiles and a manned “Green Window” service counter. Higashi-Tagonoura Station was opened on September 15, 1949 primarily as a commuter station serving workers for nearby heavy industry. Higashi-Tagonoura Station has a single side platform serving Track 1 and an island platform serving Track 2 and Track 3, connected to the station building by an overpass. Track 2 is used for through transit of express trains, as is Track 4 (without platform) to the outside of Track 3. The station building has automated ticket machines, TOICA automated turnstiles and a manned “Green Window” service counter. Yoshiwara Station (吉原駅 Yoshiwara-eki) is an interchange railway station in Fuji, Shizuoka Prefecture, Japan. The station is 141.3 rail kilometers from Tokyo Station. Yoshiwara is on the Tōkaidō Main Line of Central Japan Railway Company and is a terminal station for the Gakunan Railway Line of the Gakunan Electric Train and a freight terminal of the Japan Freight Railway Company. Yoshiwara Station first opened as Suzukawa Station (鈴川駅 Suzukawa-eki?) on February 1 1889, when the section of the Tookaidoo Main Line connecting Shizuoka with Kōzu was completed. 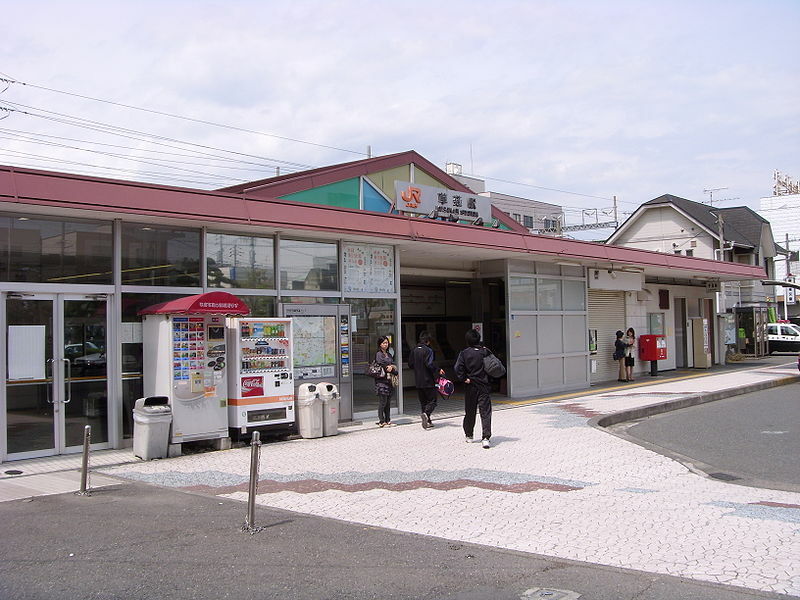 It became a terminus for the Gakunan Railway on November 18, 1949 and was renamed Yoshiwara Station (after Yoshiwara-juku on the old Tōkaidō on April 10, 1956. The present station building dates from 1970. Container freight services began operations from 1994. The Tookaidoo Yoshiwara Station has a single Island platform serving Track 1 and Track 2, which are on passing loops On the outside of either track are tracks to permit the through transit of express trains. The platform is connected to the station building by an overpass. The station building has automated ticket machines, TOICA automated turnstiles and a manned “Green Window” service counter. 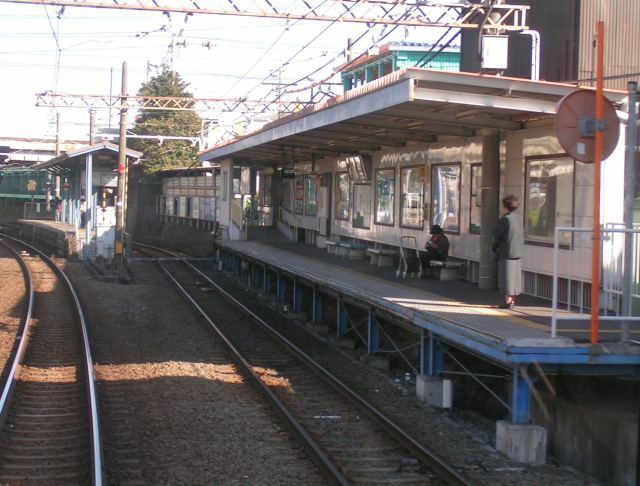 The Gakunan Yoshiwara Station has a bay platform with two tracks, only one of which is in normal daily use. In 1889, when the section of the Tōkaidō Main Line connecting Shizuoka with Kōzu was completed, stations were built at Suzukawa (Yoshiwara) and Iwabuchi (Fujikawa), with Kashima village in between without a train station. 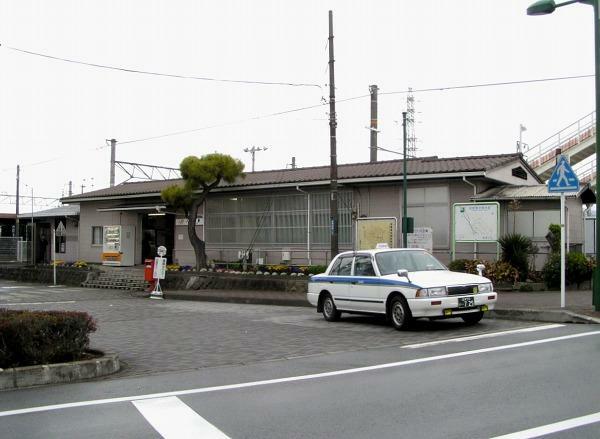 Due to the strong petition of the local residents, and political pressure applied by Oji Paper Company, who had established a paper mill nearby, a station was opened on April 21, 1909 and named “Fuji Station”. The terminus of the Minobu Line was established at Fuji Station on July 13, 1913. The station building was rebuilt in 1964. Container freight services began operations from 1994. 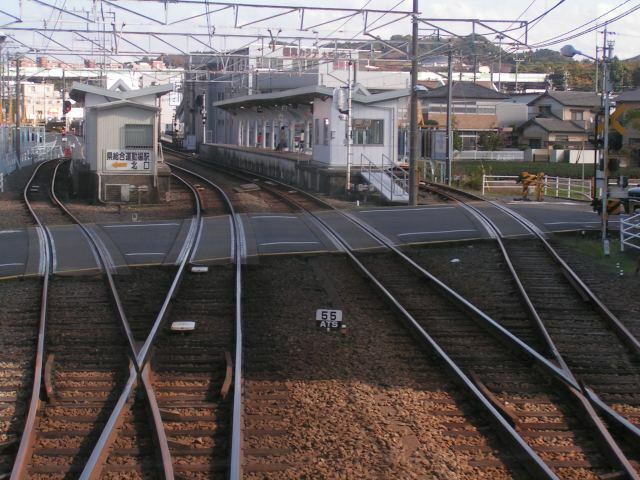 The Fuji Station has three island platforms serving six tracks, which are connected each other an overpass, which leads to station building, which is also constructed over the tracks. The station building has automated ticket machines, TOICA automated turnstiles and a manned “Green Window” service counter. Fujikawa Station first opened as Iwabuchi Station (岩淵駅 Iwabuchi-eki) on February 1 1889, when the section of the Tookaidoo Main Line connecting Shizuoka with Kōzu was completed. The initial plan for the Tōkaidō Main Line was to construct stations in accord with the traditional 53 stages of the Tōkaidō road. However, in between Fujikawa-juku and Kanbara-juku there was a traditionally unnumbered intermediary post station where a branch road led to the pilgrimage location of Mount Minobu. It was decided to build a railroad station at this location, and to bypass nearby Kambara Town instead. This led to a predictable uproar from Kambara, so Kambara Station was built a year later, but at an inconvenient distance outside of town, so as to keep the spacing between stations fairly even. A station in the center of Kambara was not actually built until Shin-Kambara Station in 1968. 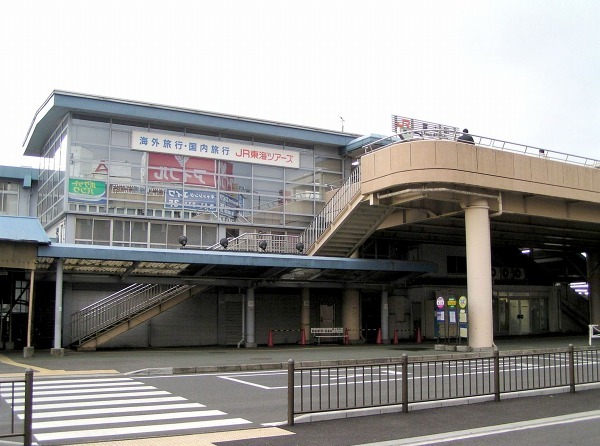 Iwabuchi Station was renamed “Fujikawa” in 1970. Regularly scheduled freight services were discontinued in 1972, and all freight services by 1985. Fujikawa Station has a single side platform serving Track 1 and an island platform serving Track 2 and Track 3, connected to the station building by an overpass. Track 2 is used for through transit of express trains. The station building has automated ticket machines, TOICA automated turnstiles and a manned “Green Window” service counter. Shin-Kambara Station was opened on October 1, 1968, in response to a request by local citizens for a station closer to the center of town than the existing Kambara Station. Shin-Kambara Station has two opposing side platform serving Track 1 and Track 2 The platforms are connected to the station building by an overpass. The station building has automated ticket machines, TOICA automated turnstiles and a manned “Green Window” service counter. 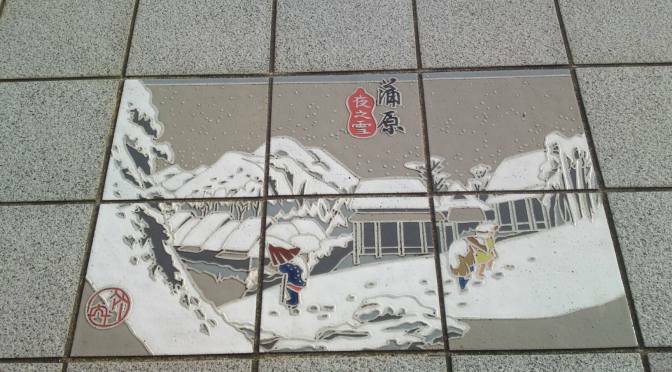 ALONG THE OLD TOKAIDO ROAD: THE 53 STATIONS UKIYOE BY UTAGAWA HIROSHIGE ON PAVEMENT TILES IN FRONT OF Shin KAMBARA STATION, SHIMIZU KU, SHIZUOKA CITY! When the section of the Tookaidoo Main Line connecting Shizuoka with Kōzu was completed in 1889, the initial plan was to construct stations in accord with the traditional 53 stages of the Tokaido road. However, in between Yoshiwara-juku and Kanbara-juku there was a traditionally unnumbered intermediary post station where a branch road led to the pilgrimage location of Mount Minobu. It was decided to build a railroad station at this location, and to bypass nearby Kambara Town instead. This led to a predictable uproar from Kambara, so Kambara Station was built a year later, but at an inconvenient distance outside of town, so as to keep the spacing between stations fairly even. A station in the middle of Kambara Town was not actually built until Shin-Kambara Station in 1968. Regularly scheduled freight services were discontinued in 1972, and all freight services by 1985. Kambara Station has a single side platform serving Track 1 and an island platform serving Track 2 and Track 3, connected to the station building by an overpass. Track 2 is used for through transit of express trains, as is Track 4 (without platform) to the outside of Track 3. The station building has automated ticket machines, TOICA automated turnstiles and a manned “Green Window” service counter. Although local residents had petitioned for a station when the section of the Tōkaidō Main Line connecting Shizuoka with Hamamatsu was completed. Yui Station was opened in 1889, the low population and proximity to Kambara Station led to the petition being rejected. 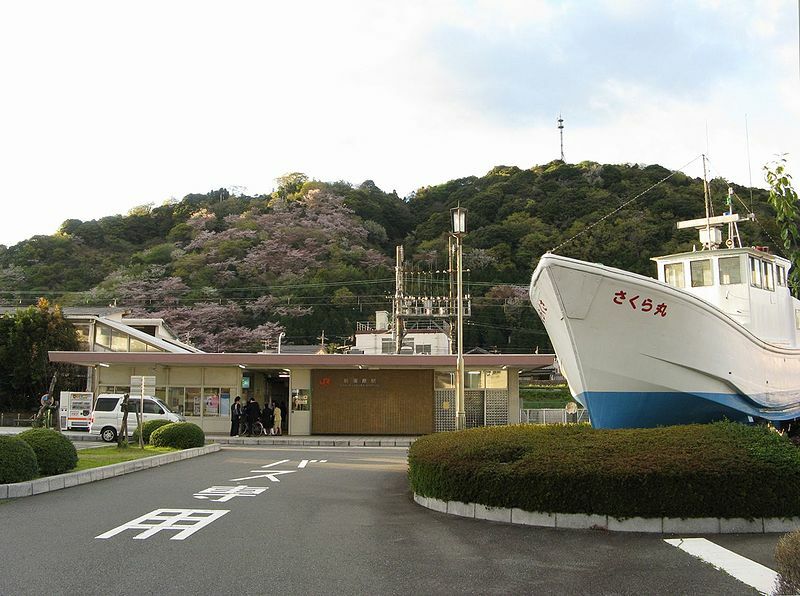 However, with the growing importance of agricultural products (green tea, mikan) and Yui’s importance as a fishing port, the request for a station was finally granted on April 15, 1916. Regularly scheduled freight service was discontinued in 1971. Okitsu Station was opened on February 1, 1889 when the section of the Tookaidoo Main Line connecting Shizuoka with Kōzu was completed. It is located near the site of Okitsu-juku on the old Tōkaidō. The area quickly developed into a summer seaside resort for the aristocracy, politicians and noted literary figures in the Meiji and Taisho periods. A noted resident of Okitsu was the genrō Saionji Kinmochi, whose practice was to order express trains to make a special unscheduled stop at Okitsu Station whenever he wanted to travel. The station building was rebuilt in 1930 and in 1981. Between 1926 and 1964 Sodeshi Station was situated 2.4 km towards Shimizu Station, operating in the summer months to cater for beach goers. Sodeshi Station closed in 1971. Okitsu Station has a single side platform serving Track 1 and an island platform serving Track 2 and Track 3, connected to the station building by an overpass. Track 3 is used for terminating services arriving from east and west, and also for services departing in both directions. The station building has automated ticket machines, TOICA automated turnstiles and a manned “Green Window” service counter. Shimizu Station first opened as Ejiri Station (江尻駅 Ejiri-eki) on February 1, 1889, when the section of the Tōkaidō Main Line connecting Shizuoka with Kōzu was completed. It was named after Ejiri-juku, the 18th station of the historical Tōkaidō. In 1934 it was renamed Shimizu Station. From 1916 the Shimizukoo Line ran as a branch line from Shimizu Station through the industrial port area of the town before terminating in Miho. In 1984 this line was torn up and replaced by a bus service. Regularly scheduled freight services were discontinued in 1984, and all freight services by 2001. 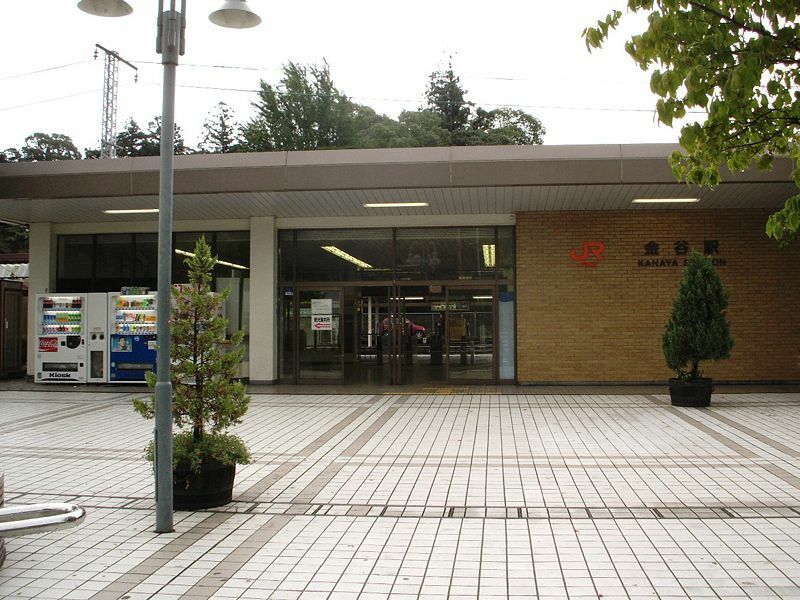 Transfer to the Shizuoka-Shimizu Railway is available via Shin-Shimizu Station, a ten-minute walk from the east exit. The current station building was completed in June 2003. Shimizu Station has a single island platform serving Track 1 and Track 2, connected to the station building by an overpass. The station building has automated ticket machines, TOICA automated turnstiles and a manned “Green Window” service counter. 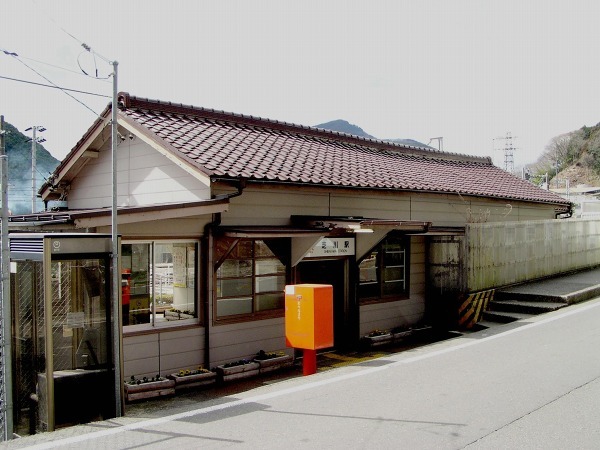 A signal box was established on the site of the present Kusanagi Station on April 10, 1911. 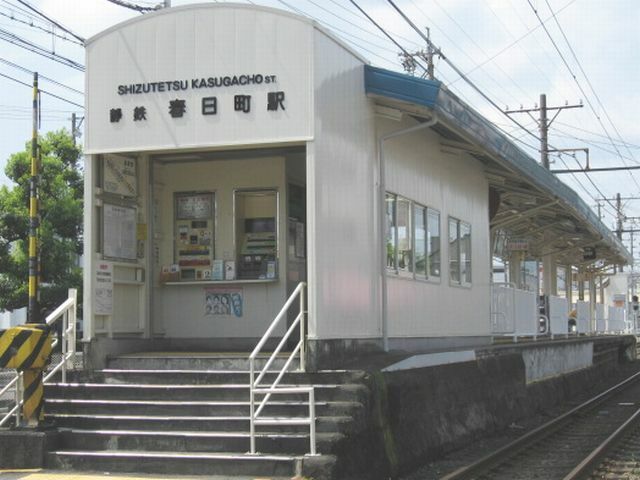 Kusanagi Station was opened on April 3, 1926. From 1930, the station had both passenger and freight operations; however, freight operations were discontinued from 1967. The current station building dates from 1973. 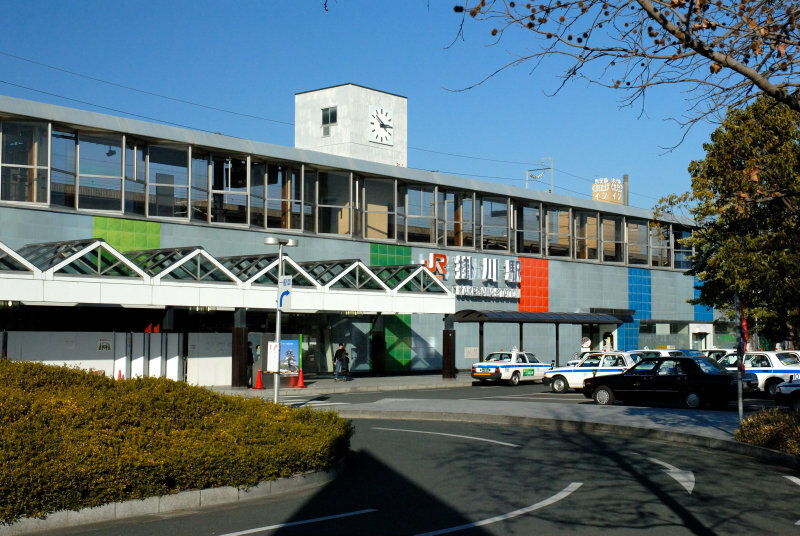 Kusanagi Station serves the University of Shizuoka, Shizuoka Prefectural Museum of Art and Shizuoka Prefectural Central Library. 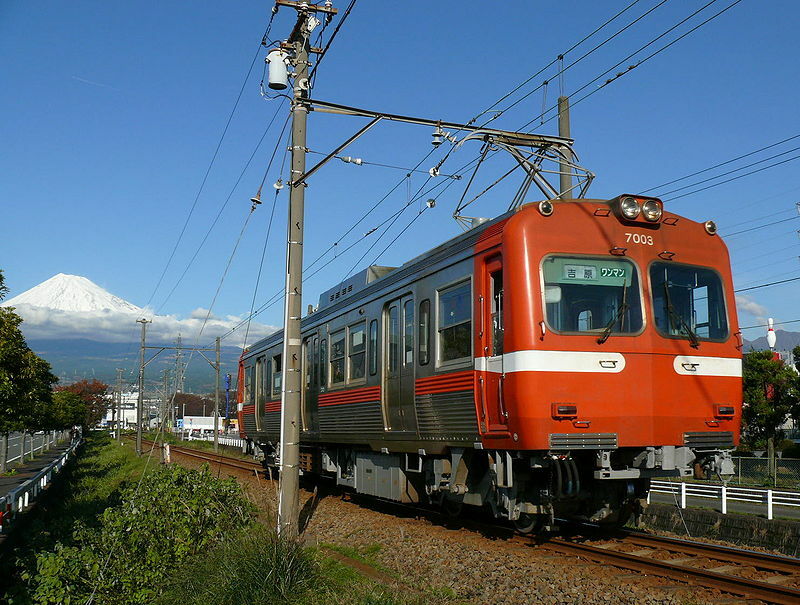 The Shizuoka-Shimizu local railway line’s via Kusanagi Station is a three-minute walk away. Kusanagi Station has two opposing side platforms serving Track 1 and Track 2, with headshunts, allowing for tracks for express trains to pass in between, and an overpass connecting the platforms. The station building has automated ticket machines, TOICA automated turnstiles and a manned “Green Window” service counter. 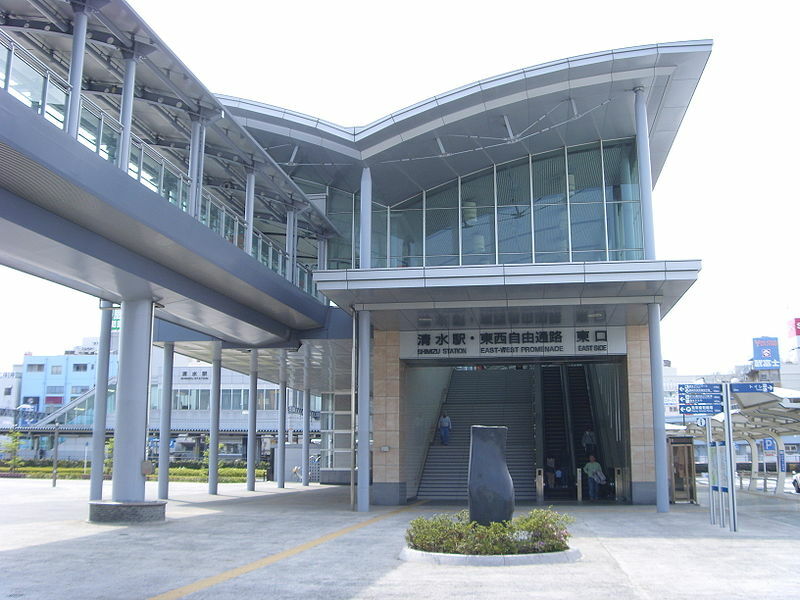 Higashi-Shizuoka Station opened on October 30, 1998 as part of an urban renewal redevelopment of a portion of the former Higashi-Shizuoka Freight Terminal. A large-scale convention center next to the train station opened in 1999. 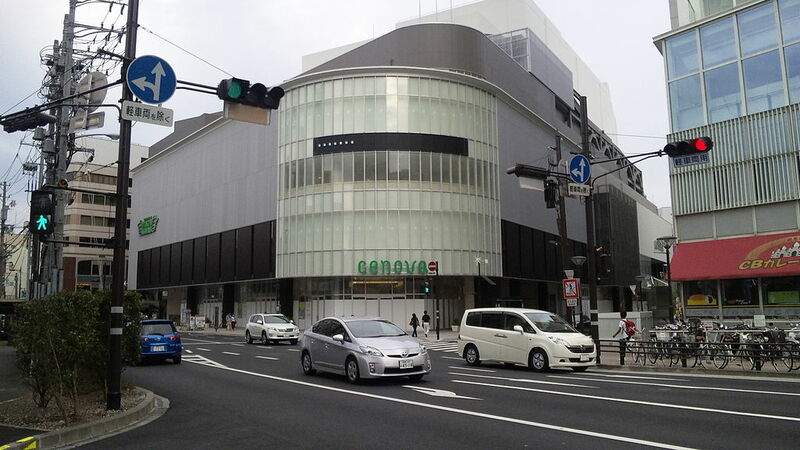 These developments were intended to encourage further investment towards the east of Shizuoka City centre. Higashi-Shizuoka Station has a single island platform serving two tracks, connected to the station building by an overpass with a moving walkway. 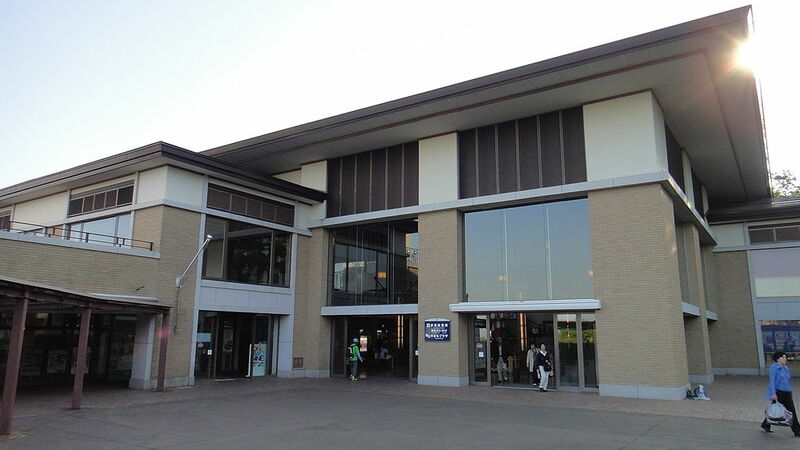 The station building has automated ticket machines, TOICA automated turnstiles, and a staffed Midori no Madoguchi ticket office. Shizuoka station first opened on February 1, 1889, when the section of the Tookaidoo Main Line connecting Shizuoka with Kōzu was completed. A grand opening ceremony had been planned, but on this day a huge fire destroyed over 1,000 buildings in downtown Shizuoka. Railroad Minister Inoue Masaru cancelled his planned visit, and later the same day, the town around Gotemba Station, also in Shizuoka Prefecture, burned down. The initial Shizuoka Station building was rebuilt in 1907 and again in 1935. The Tookaidoo Shinkansen platforms were opened in 1964. In 1967, freight operations were relocated from Shizuoka Station to Higashi-Shizuoka Station (the present-day Shizuoka Freight Terminal). 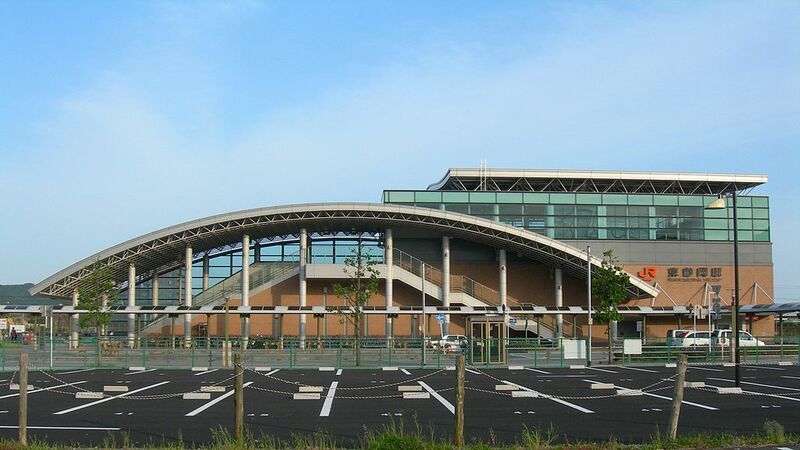 The station underwent a massive rebuilding program from the late 1970s, with the Tōkaidō Main Line tracks elevated in 1979 to the same level as the Tookaidoo Shinkansen tracks, and the Parche shopping centre/new station building completed in 1981. From 2006 to 2008, major renovations took place inside and around the station, including the underground walkways to and from the station, and the Asty shopping and dining complexes adjoined to the station. Shizuoka Station has four platforms serving six tracks. Two island platforms with Tracks 1–4 serve the Tōkaidō Main Line trains, and long distance night trains. These platforms are connected with the station concourse via an underpass and are also connected at the same level to the Tōkaidō Shinkansen platforms. The Shinkansen station consists of two opposing side platforms serving two tracks, with two central tracks for non-stop trains. The station building has automated ticket machines, TOICA automated turnstiles, and a manned “Green Window” service counter. 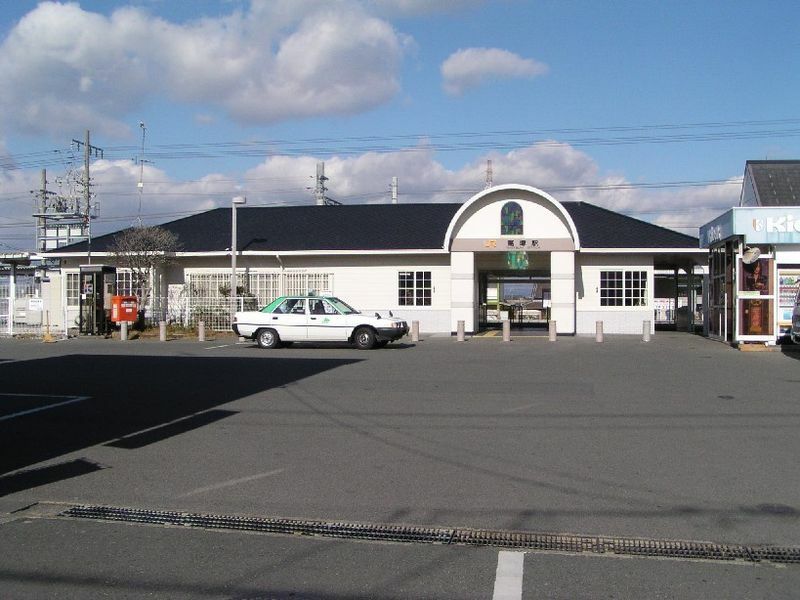 Abekawa Station was opened on March 14, 1985 primarily as a commuter station serving Shizuoka city. Abekawa Station has two side platforms serving Track 1 and Track 2, with the station building built on the overpass connecting the platforms. The station building has automated ticket machines, TOICA automated turnstiles and a manned “Green Window” service counter. 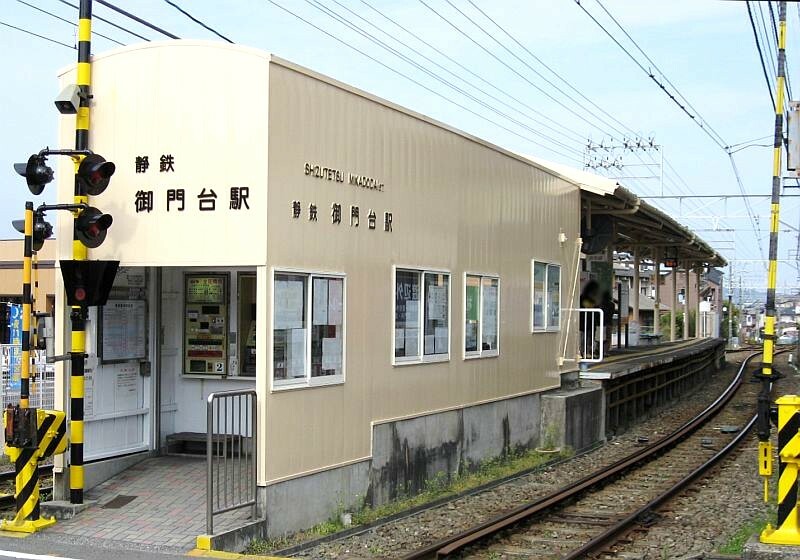 A signal box was established at the site of present-day Mochimune Station on December 21, 1902. It was rebuilt as a station for both passenger and freight services on November 1, 1909. Regularly scheduled freight service was discontinued in 1974. Mochimune Station has an island platform serving Track 2 and Track 3, and a side platform serving the seldom-used Track 1. The platforms are connected to the station building by an overpass. The station building has automated ticket machines, TOICA automated turnstiles and a manned “Green Window” service counter. Yaizu Station was opened on April 16, 1889 when the section of the Tookaidoo Main Line connecting Shizuoka with Hamamatsu was completed. Regularly scheduled freight service was discontinued in 1986. Yaizu Station has a single island platform serving Track 1 and Track 2, connected to the station building by an overpass. The station building has automated ticket machines, TOICA automated turnstiles and a manned “Green Window” service counter. 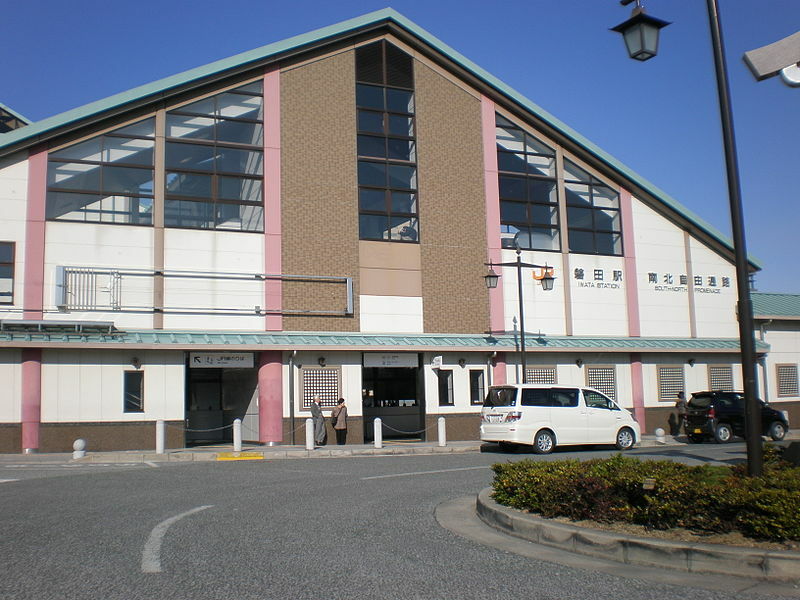 Nishiyaizu Station was opened on March 21, 1987 in response to requests from the local Yaizu city government. 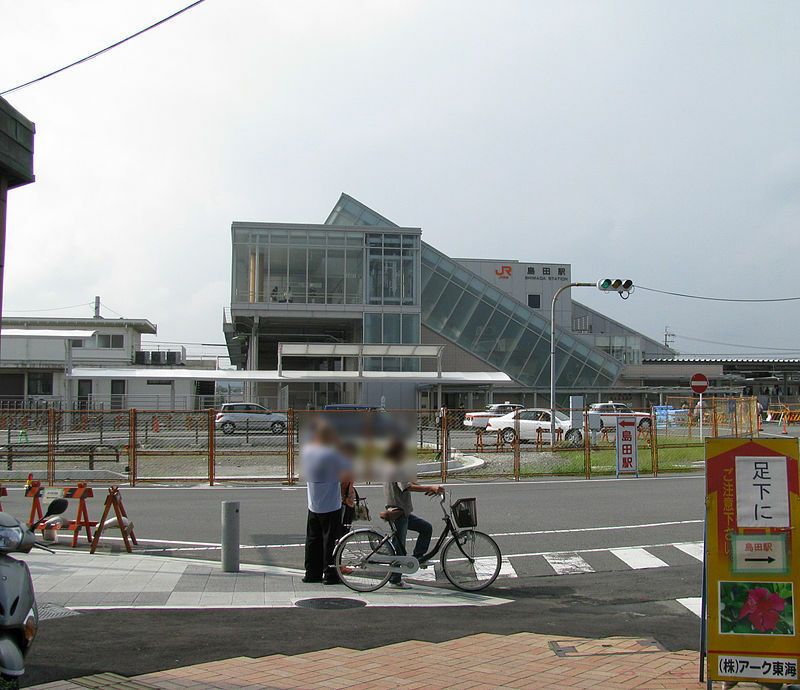 It is primary a commuter station, serving an industrial zone in Yaizu. 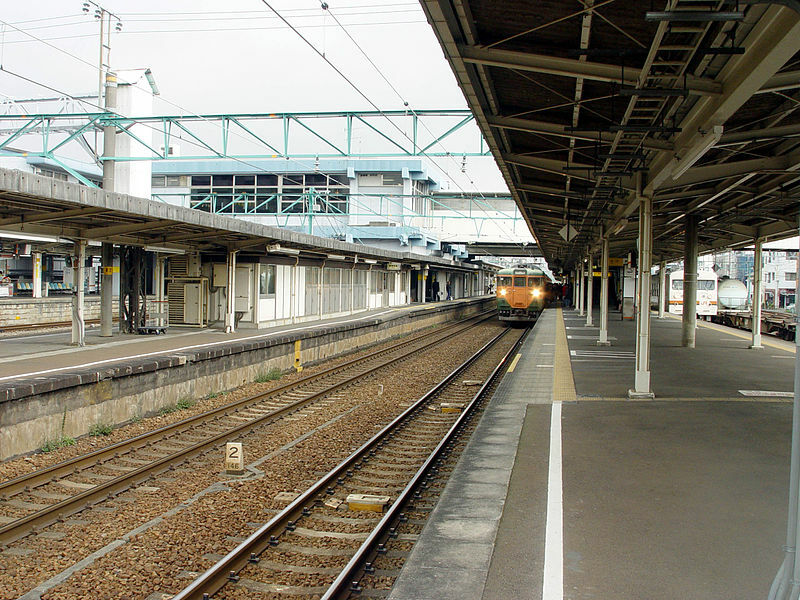 Nishiyaizu Station has two opposing side platforms serving Track 1 and Track 2. The platforms are connected to the station building by an overpass. The station building has automated ticket machines, TOICA automated turnstiles and a manned “Green Window” service counter. Fujieda Station was opened on April 16, 1889 when the section of the Tookaidoo Main Line connecting Shizuoka with Hamamatsu was completed. The city of Fujieda did not exist at that time, and the station was located in Aoshima Village. On April 27, 1889, a senior official of the Imperial Household Ministry, Hida Hamagoro was killed while attempting to jump onto a departing express train from the platform of Fujieda Station. At the time, trains on the Tookaidoo Main Line had no toilets, and the accident led to their introduction on May 10 of the same year. Fujieda became an interchange station with the establishment of services by the Sunen Line (駿遠線 Sunen-sen) (the future Shizuoka Railway Company on November 16, 1913, and which opened a spur line to Ōigawa Town in 1914. Operations of the Shizuoka Railway were discontinued at Fujieda on October 1, 1970. Regularly scheduled freight service was discontinued in 1971. Fujieda Station has an island platform serving Track 2 and Track 3, and a side platform serving the seldom-used Track 1. The platforms are connected to the station building by an overpass. The station building has automated ticket machines, TOICA automated turnstiles and a manned “Green Window” service counter. 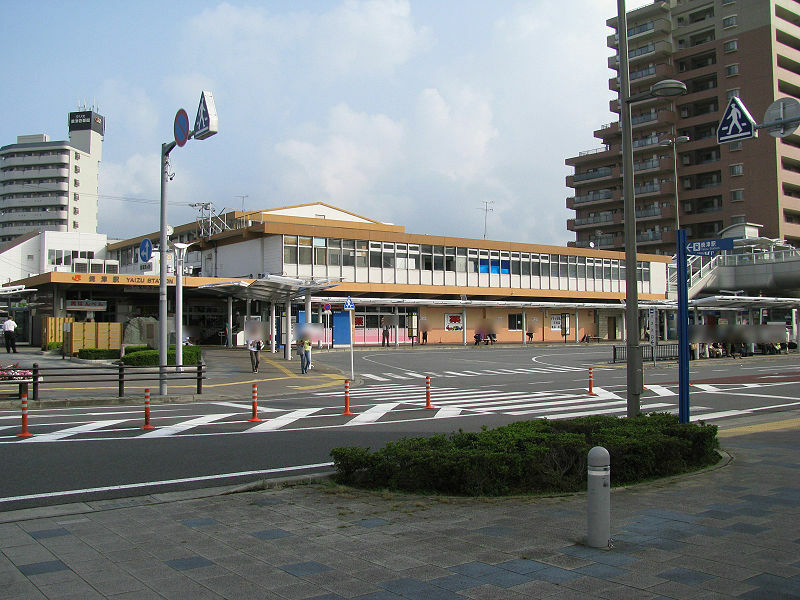 Rokugō Station was opened on April 26, 1986 in response to requests from the local Shimada city government. Rokugō Station has two opposing side platforms serving Track 1 and Track 2 which are on headshunts, allowing for tracks for express trains to pass in between. The platforms are connected to the station building by an overpass. The station building has automated ticket machines, TOICA automated turnstiles and a manned “Green Window” service counter. Shimada Station was opened on April 16, 1889 when the section of the Tōkaidō Main Line connecting Shizuoka with Hamamatsu was completed. Regularly scheduled freight service was discontinued in 1984, but continued on a charter service until 1993. Shimada Station has an island platform serving Track 1 and Track 2, and a side platform serving the seldom-used Track 3. The platforms are connected to the station building by an overpass. The station building has automated ticket machines, TOICA automated turnstiles and a manned “Green Window” service counter. Kanaya Station was opened on May 16, 1890, a year after when the section of the Tōkaidō Main Line connecting Shizuoka with Hamamatsu was completed. The Ōigawa Railway service began on June 10, 1927. Regularly scheduled freight service was discontinued in 1971. JR Kanaya Station has a two opposing side platforms serving Track 1 and Track 2 which are on headshunts, allowing for tracks for express trains to pass in between. The platforms are connected to the station building by an underpass. The station building has automated ticket machines, TOICA automated turnstiles and a manned “Green Window” service counter. 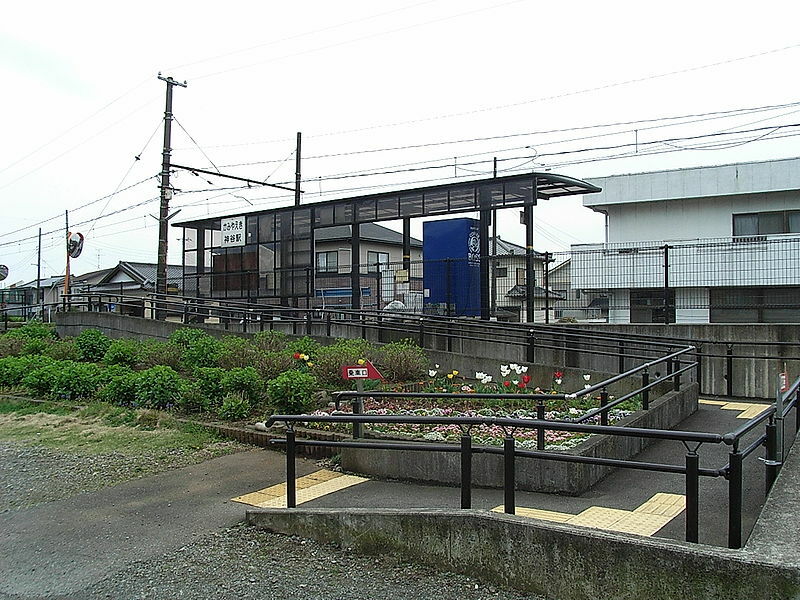 The adjacent Ōigawa Kanaya Station has a single side platform. The platform is equipped with Selective Door Operation, as trains longer than four cars in length are too long for the platform. The station originally was built with a terminal headshunt, which is no longer in existence. Kikugawa Station was opened on April 16, 1889 when the section of the Tookaidoo Main Line connecting Shizuoka with Hamamatsu was completed. It was originally named Horinouchi Station (堀ノ内駅 Horinouchi-eki). It was renamed Kikugawa on April 10, 1956. Regularly scheduled freight service was discontinued in 1971. Kikugawa Station has a single side platform serving Track 1 and an island platform serving Track 2 and Track 3, connected to the station building by an overpass. Track 1 is used only during peak hours. The station building has automated ticket machines, TOICA automated turnstiles and a manned “Green Window” service counter. Kakegawa Station was first opened on April 16, 1889 when the section of the Tookaidoo Main Line connecting Shizuoka with Hamamatsu was completed. In 1935 the first section of the Tenryū Hamanako Line opened, with Kakegawa Station as its terminus. Regular freight service was discontinued in 1984. On March 13, 1988 the Tōkaidō Shinkansen platforms opened on the south side of the station. 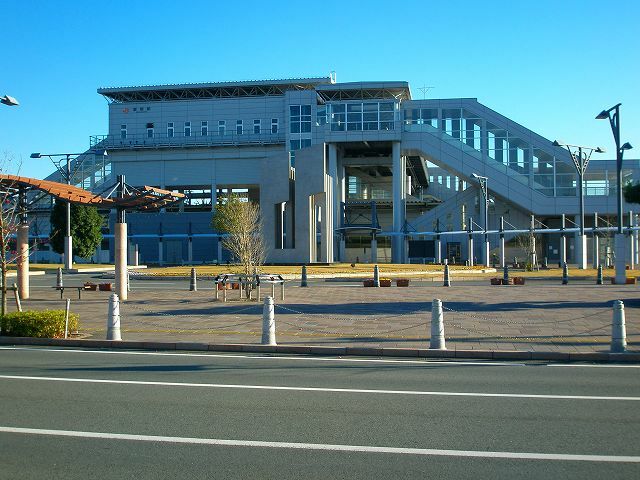 Aino Station was opened on April 22, 2001 in conjunction with the 2002 FIFA World Cup as the location closest to the Shizuoka “Ecopa” Stadium. Aino Station has a single island platform, connected by an overpass on which the two-story station building by is constructed. The station building has automated ticket machines, TOICA automated turnstiles and a manned “Midori no Madoguchi” service counter. Fukuroi Station was opened on April 16, 1889 when the section of the Tōkaidō Main Line connecting Shizuoka with Hamamatsu was completed. From 1902-1962, it was an interchange station which also served the Akiha Line of the Shizuoka Railway. Regularly scheduled freight service was discontinued on January 21, 1984. Fukuroi Station has two island platforms, connected by an overpass. The outside tracks, Track 1 and Track 4, are not in regular use, except during peak times in the summer festival season. The station building has automated ticket machines, TOICA automated turnstiles and a manned “Midori no Madoguchi” service counter. Iwata Station was built as Nakaizumi Station (中泉駅 Nakaizumi-eki) on April 16, 1889 when the section of the Tookaidoo Main Line connecting Shizuoka with Hamamatsu was completed. 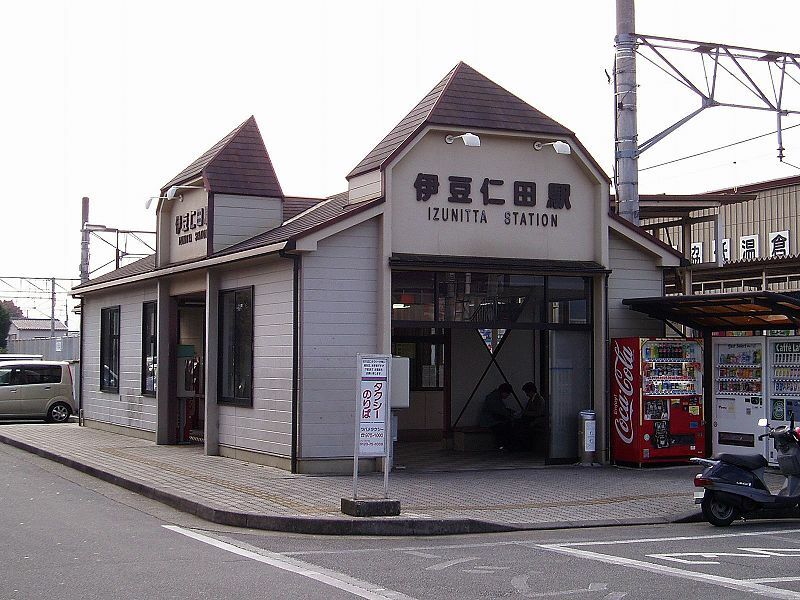 It was renamed “Iwata Station” on October 10, 1942. The station building was rebuilt in 1915, 1957, and 2000. Regularly scheduled freight service was discontinued on February 26, 1996; however, occasional freight trains operated by the Japan Freight Railway Company stopped at a rail siding at Iwata to service the industrial zone to the east of the station. A large bus terminal was established at the south exit of the station in 2006. A statue of the local football club Júbilo Iwata’s mascot, Júbilo-kun, modeled on the black-tailed flycatcher, stands prominently in front of the station’s north exit. Buses at the stop nearby provide service to the club’s stadium, Yamaha Stadium, on game days. Iwata Station has a side platform serving Track 1, which is an infrequently used auxiliary platform, and an island platform serving Track 2 and Track 3. The two platforms are connected by an overpass. The station building has automated ticket machines, TOICA automated turnstiles and a manned “Green Window” service counter. 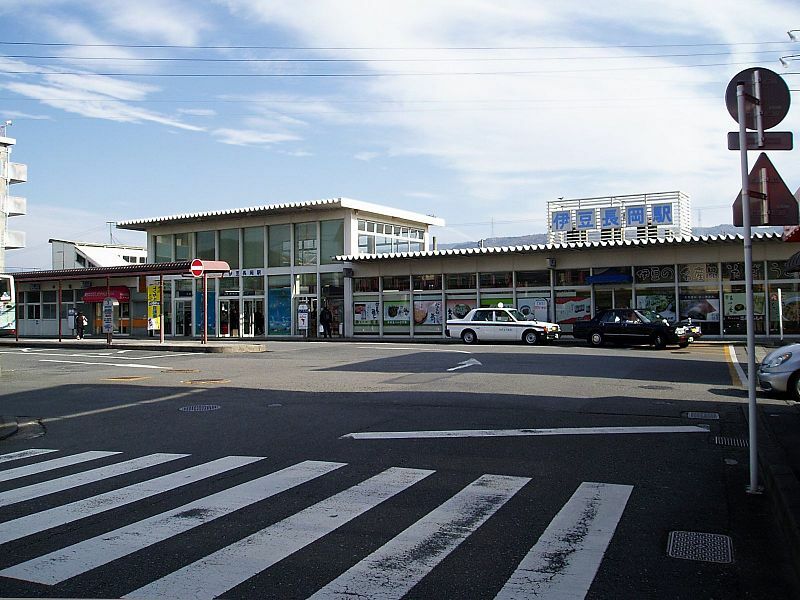 Toyodachō Station is a relatively new station on the Tookaidoo Main Line, having been opened on December 14, 1991 in Toyoda town, Shizuoka, prior to its merger with nearby Iwata City in 2005. Toyodachō Station has two opposing side platforms connected by an overpass. The station building has automated ticket machines, TOICA automated turnstiles and a manned “Green Window” service counter. 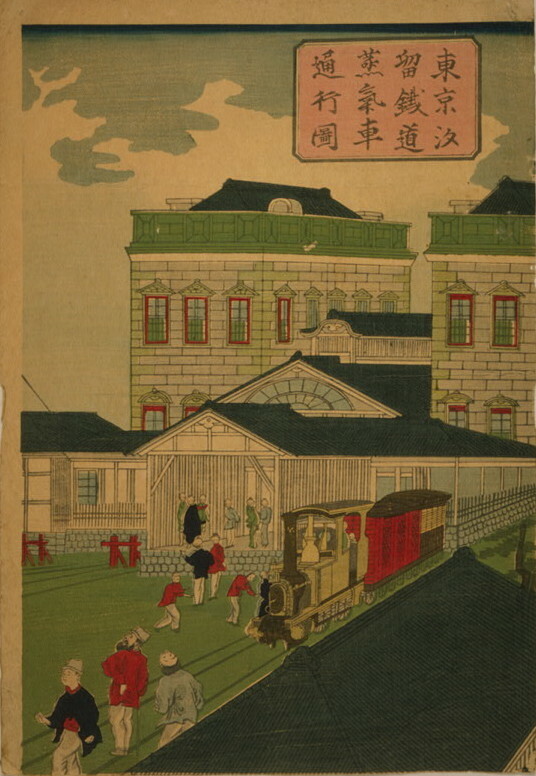 Tenryūgawa Station was opened on July 10, 1898 for both passenger and freight services. Regularly scheduled freight service was discontinued on March 15, 1972; however, occasional freight trains operated by the Japan Freight Railway Company continued to use the station until April 1, 2006. Tenryūgawa Station has two island platforms, one serving Track 1, which is an infrequently used auxiliary platform, and Track 2. The other island platform serves Track 3, and Track 4, which is also an infrequently used auxiliary platform. The two platforms are connected by an overpass. The station building has automated ticket machines, TOICA automated turnstiles and a manned “Green Window” service counter. 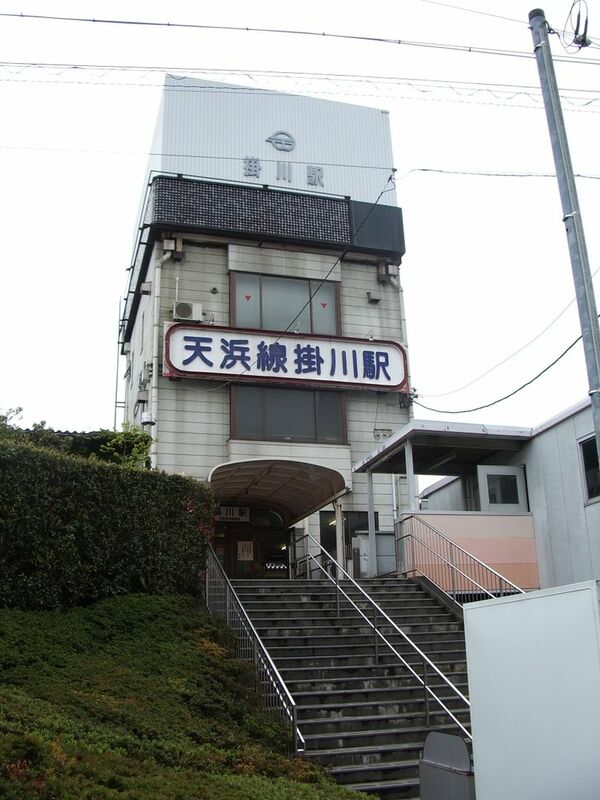 A signal box was established at the location of modern Takatsuka Station on March 31, 1911. This became a full train station on July 1, 1929. Regularly scheduled freight service was discontinued on April 24, 1971; however, occasional freight trains continued to use a shunt from the station to a nearby Suzuki Motors engine plant until October 1, 1983. Takatsuka Station has one side platform serving Track 1, and one island platforms, serving Track 2 and Track 3 (which was formerly dedicated to freight trains and is no longer in use. The two platforms are connected by an overpass. The station building has automated ticket machines, TOICA automated turnstiles and a manned “Green Window” service counter. Maisaka Station was opened on September 1, 1888 when the section of the Tōkaidō Main Line connecting Hamamatsu Station with Ōbu Station was completed. It was originally named Magoori Station (馬郡駅 Magoori-eki?). It was renamed Maisaka on December 1, 1888, but the kanji spelling of its name assumed its present form only in 1940. Regularly scheduled freight service was discontinued in 1971. Maisaka Station has a side platform serving Track 1 and an island platform serving Track 2 and Track 3, connected to the station building by an overpass. Track 1 is used only during peak hours. The station building has automated ticket machines, TOICA automated turnstiles and a manned “Green Window” service counter. 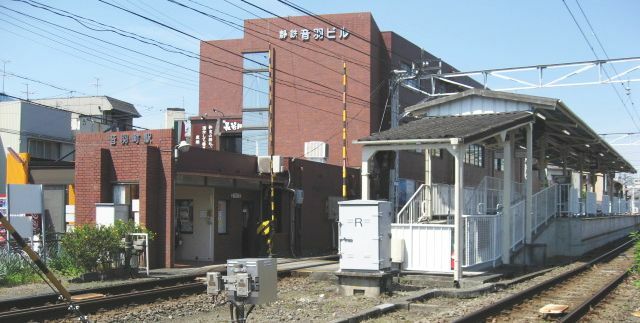 Bentenjima Station was opened on July 11, 1906 when the section of the Tookaidoo Main Line connecting Hamamatsu Station with Ōbu Station was completed. It was originally a seasonal station, open only during the summer months for visitors to the nearby beach resorts. It became a permanent station on September 1, 1916. Regularly scheduled freight service was discontinued in 1971. Bentenjima Station has a single island platform serving Track 1 and Track 2. The platforms are unusually wide, and the station building is located underneath the platforms. 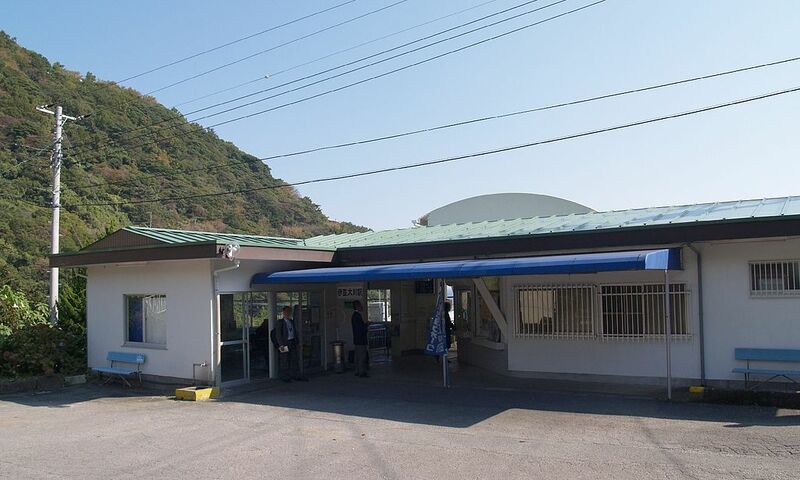 The station building is manned only during peak hours and has automated ticket machines, TOICA automated turnstiles and a manned “Green Window” service counter. 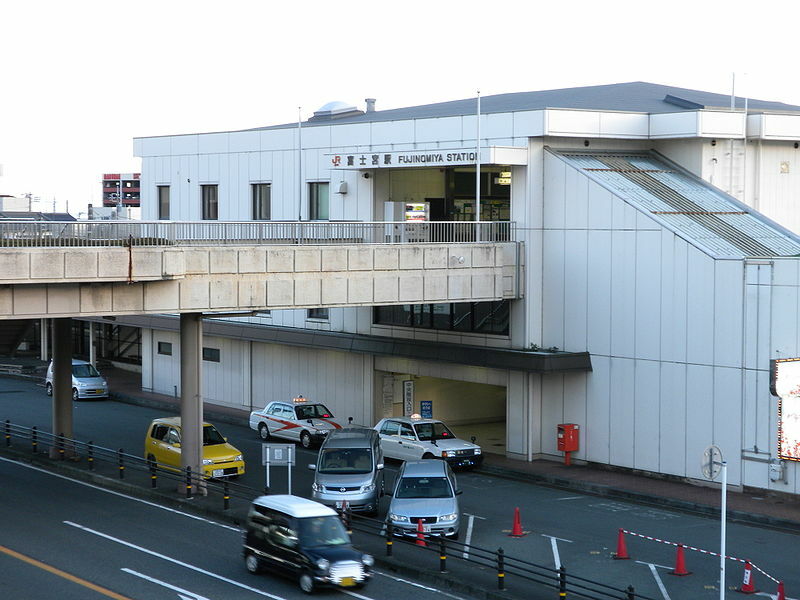 The station building also fronts Japan National Route 1 highway. On September 1, 1888 the section of the Tōkaidō Main Line connecting Hamamatsu Station with Ōbu Station was completed. 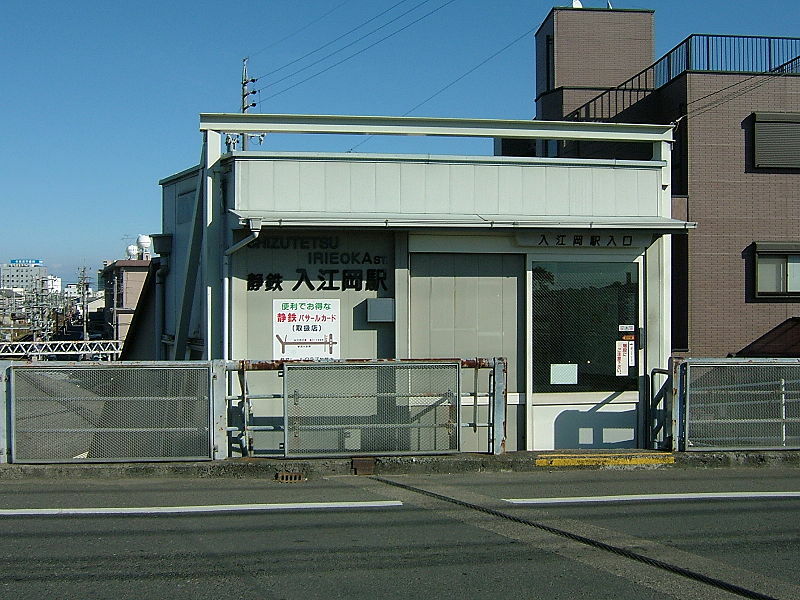 Araimachi Station was established on January 10, 1915 for both passenger service and freight. Freight service was discontinued on April 26, 1971. Araimachi Station has a side platform serving Track 1, and an island platform serving Track 2 and Track 3. The platforms are connected by an overpass. The station building has automated ticket machines, TOICA automated turnstiles and a manned “Green Window” service counter. However, the station is not manned during early morning and late night hours. On September 1, 1888 the section of the Tookaidoo Main Line connecting Hamamatsu Station with Ōbu Station was completed, and a rail siding was established at the site of present-day Washizu Station. As the area was completely rural at the time, stops were discontinued from August 1892; however, due to the strong petition by the surrounding villages, a station was established on January 10, 1915 for both passenger service and freight. Freight service was discontinued on April 26, 1971. Washizu Station has a side platform serving Track 1, and an island platform serving Track 2 and Track 3. The platforms are connected by an overpass. The station building has automated ticket machines, TOICA automated turnstiles and a manned “Green Window” service counter. 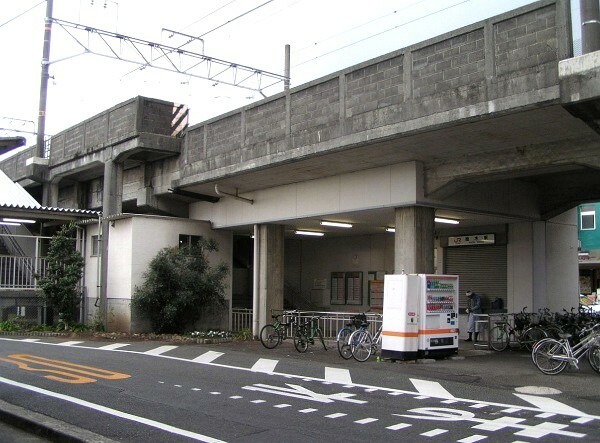 On September 1, 1888 the section of the Tōkaidō Main Line connecting Hamamatsu Station with Ōbu Station was completed, and a signal box was established at the site of present-day Shinjohara Station on February 13, 1936. With the establishment of the Futamata Line (the future Tenryū Hamanako Line), a station was established on December 1, 1936 for both passenger and freight services. Freight service was discontinued on April 26, 1971. The JR Central station has a side platform serving track 1, and an island platform serving tracks 2 and 3, but track 3 is seldom used. The platforms are connected by an overpass. The station building has automated ticket machines, TOICA automated turnstiles and a manned “Midori no Madoguchi” service counter. 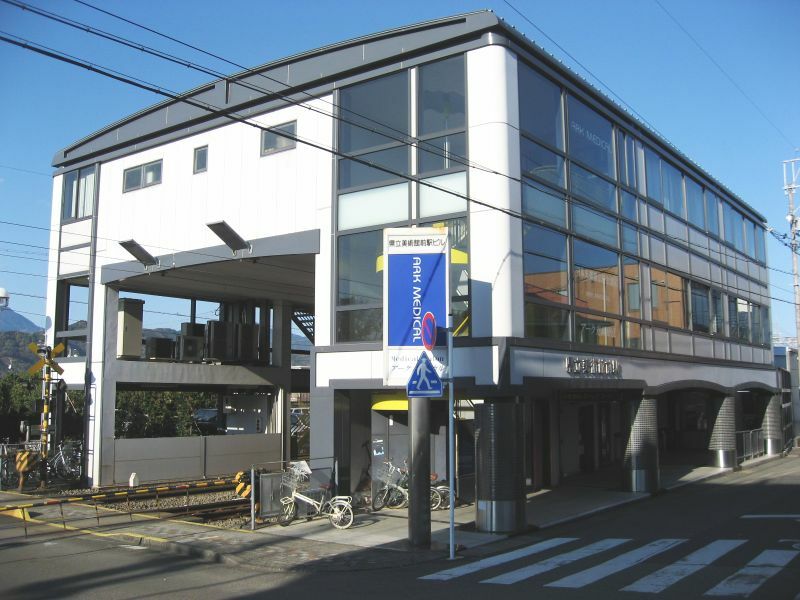 The Tenryū Hamanako Line Station is a terminal station and has a single side platform serving Track 1. 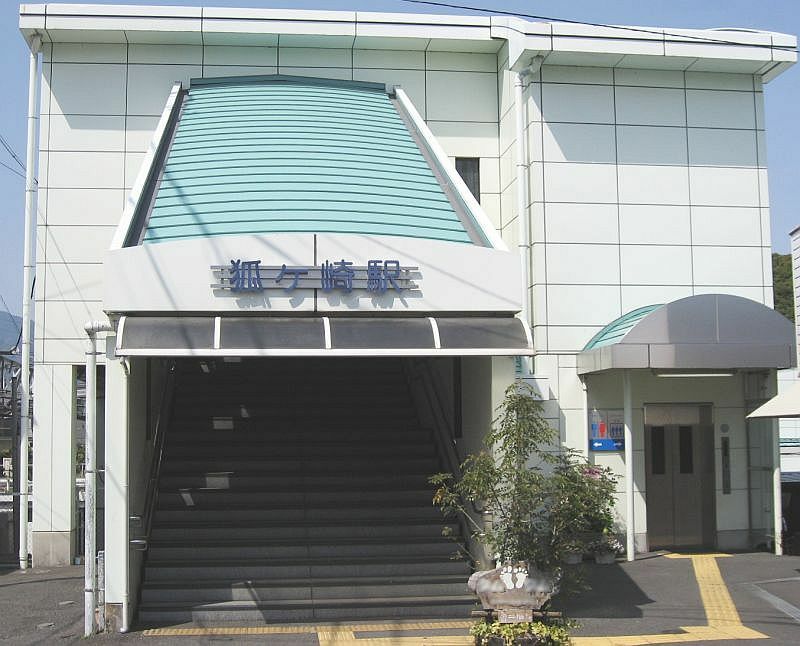 The station building is a two-story structure located to the east of the single-story JR building. The Gakunan Railway Line (岳南電車岳南線 Gakunan Densha Gakunan-sen?) is Japanese railway line between Yoshiwara and Gakunan-Enoo, all within the industrial area of Fuji in Shizuoka Prefecture. The line does not have any official name. This is the only railway line Gakunan Electric Train Co., Ltd. (岳南電車株式会社 Gakunan Densha Kabushiki-gaisha?) operates. The operator company was established on April 1, 2013 as a subsidiary of the former operator Gakunan Railway (岳南鉄道 Gakunan Tetsudō? ), a subsidiary of Fuji Kyuko. The Gakunan Railway began operations as an industrial railway named the Nissan Heavy Industrial Railroad (日産重工業専用鉄道 Nissan Jūkōgyō Senyō Tetsudō?) on August 5, 1936 as part of a project to create an industrial center in Fuji city. 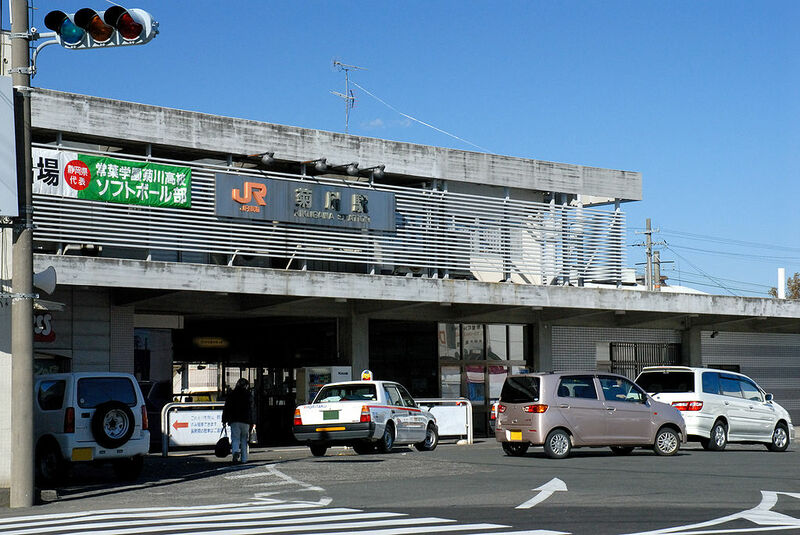 The terminal station of the line was established at Yoshiwara Station on the Tokaido Main Line, and initial plans called for the line to be extended as far as Numazu Station. These plans were delayed by World War II and were eventually cancelled with the end of the war and breakup of the Nissan zaibatsu. The line gained its present name on December 15, 1948, after which regularly scheduled passenger service began. The electric supply for the line was upgraded from 600 Volts to the present 1,500 volts in 1969. In 1984, scheduled freight services past Sudo were discontinued. All freight services were discontinued on March 16, 2012. 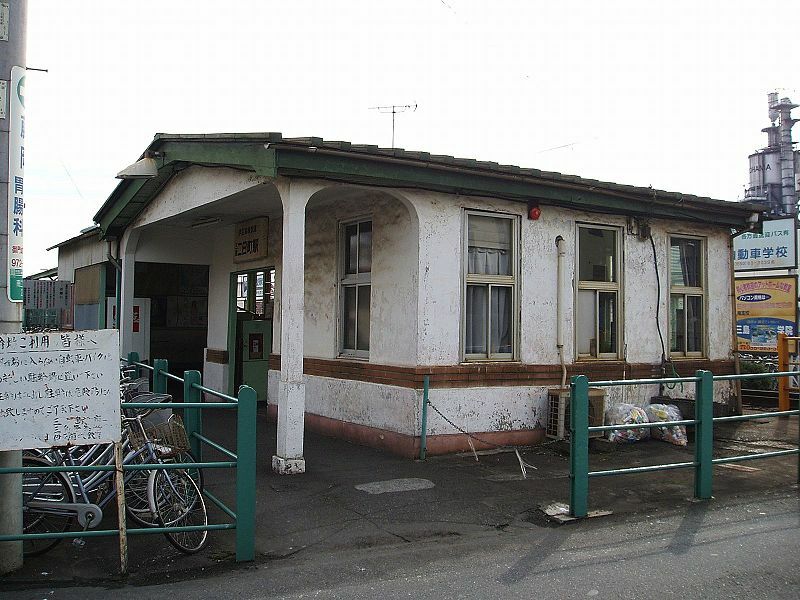 It first opened as Suzukawa Station (鈴川駅 Suzukawa-eki) on February 1 1889, when the section of the Tōkaidō Main Line connecting Shizuoka with Kōzu was completed. It became a terminus for the Gakunan Railway on November 18, 1949 and was renamed Yoshiwara Station (after Yoshiwara-juku on the old Tōkaidō on April 10, 1956. The present station building dates from 1970. Container freight services began operations from 1994. The Tōkaidō Yoshiwara Station has a single Island platform serving Track 1 and Track 2, which are on passing loops On the outside of either track are tracks to permit the through transit of express trains. The platform is connected to the station building by an overpass. The station building has automated ticket machines, TOICA automated turnstiles and a manned “Green Window” service counter. The Gakunan Yoshiwara Station has a bay platform with two tracks, only one of which is in normal daily use. 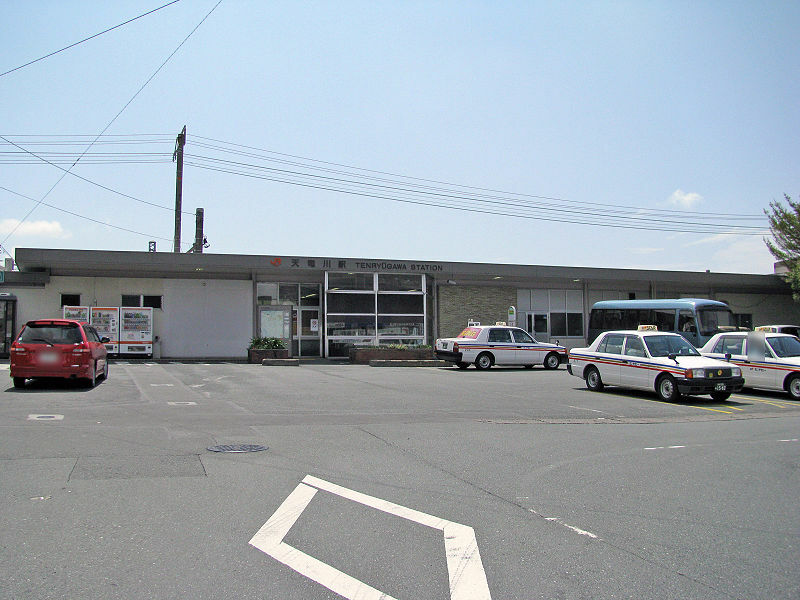 Jatco-mae Station was opened on November 18, 1949 as Nissan-mae Station (日産前駅 Nissanmae-eki?) after the large Nissan Motors Fuji assembly plant located nearby. 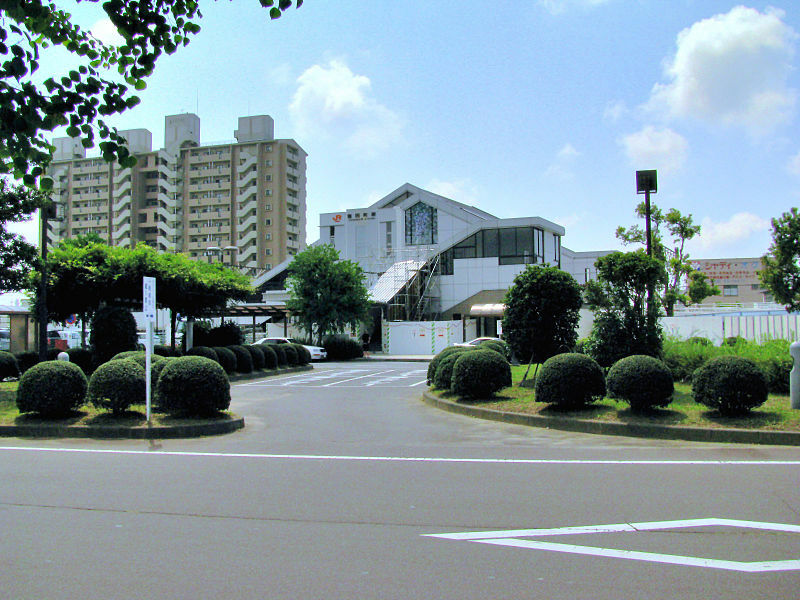 The plant was sold in June 1999 to the Nissan subsidiary Jatco, and the station was accordingly renamed on April 1, 2005. 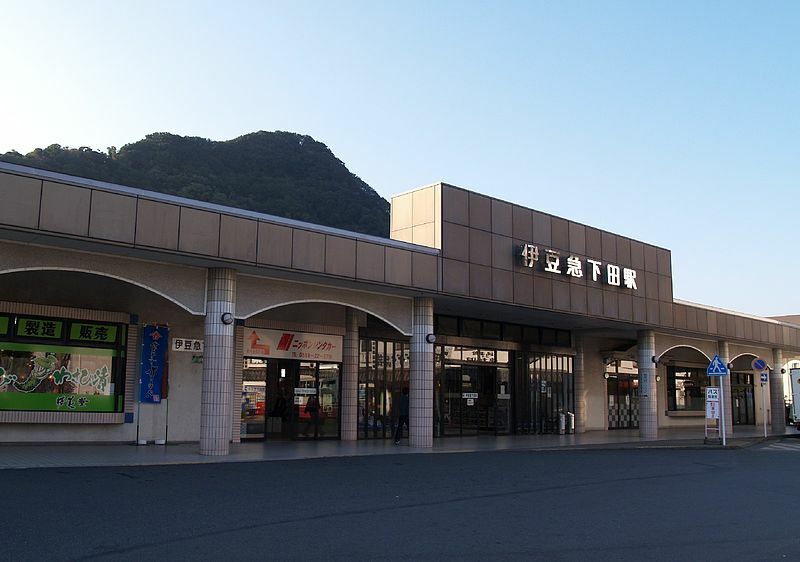 Jatco-mae Station is an unmanned station with a single side platform. 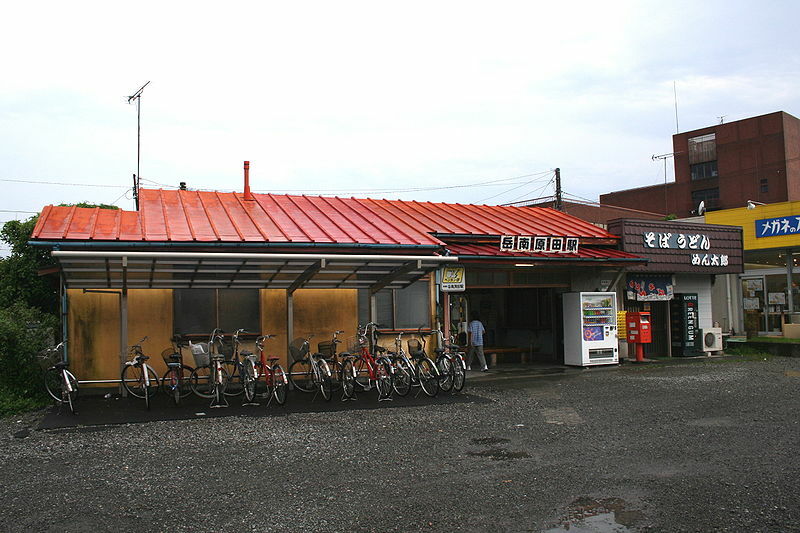 Yoshiwara-honchō Station was opened on November 18, 1949. Yoshiwara-honchō Station has two opposed side platforms, with a level crossing at one end of the station It is manned during daylight hours. 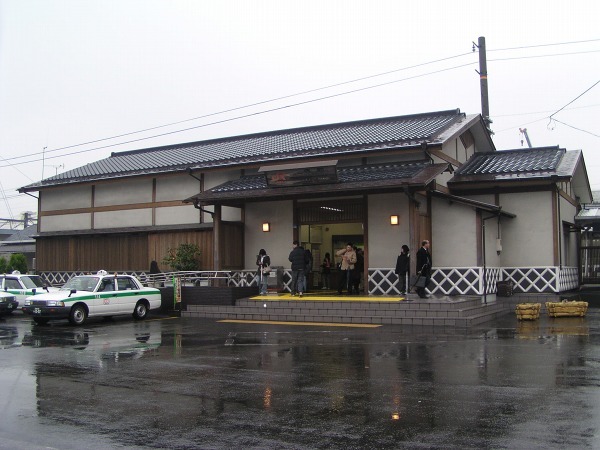 Hon-Yoshiwara Station was opened on April 18, 1950. It has been unmanned since 1993. Hon-Yoshiwara Station has a single island platform serving two tracks for passenger service. The station is located in a mixed residential-industrial area. Gakunan-Harada Station was opened on December 20, 1951. 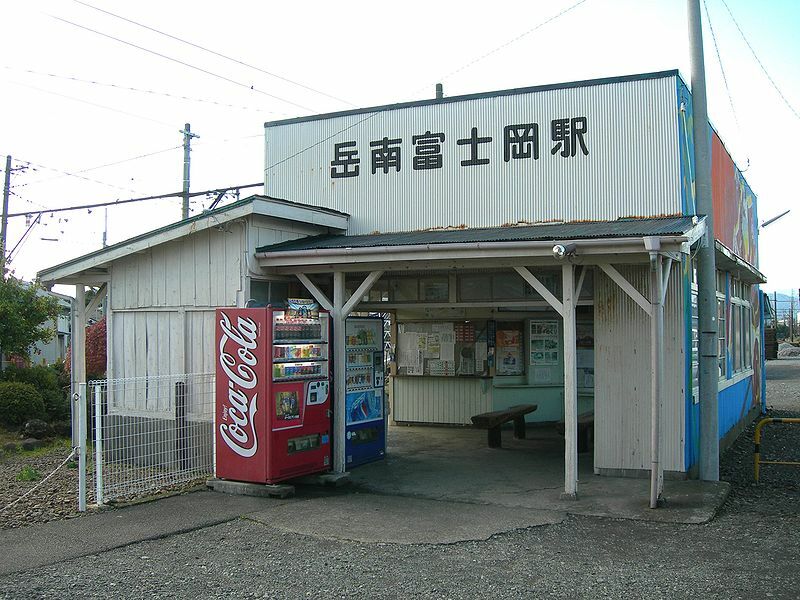 Hina Station was opened on December 20, 1951. Hina Station has a single island platform serving two tracks for passenger service. In addition, multiple tracks are used for container freight services. Gakunan-Fujioka Station was opened on December 20, 1951. 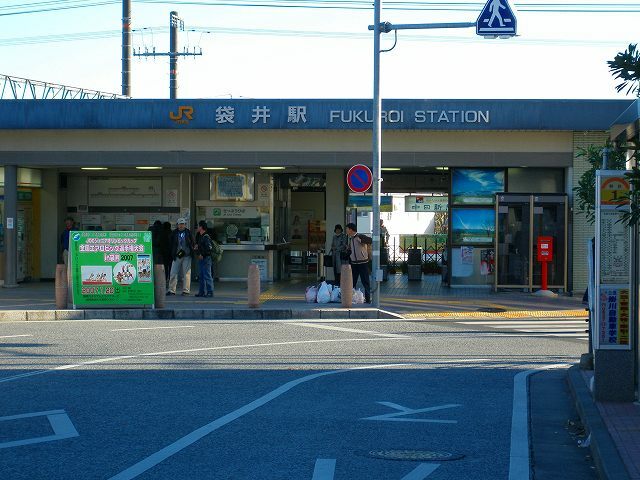 Gakunan-Fujioka Station is an unmanned station with a single island platform. 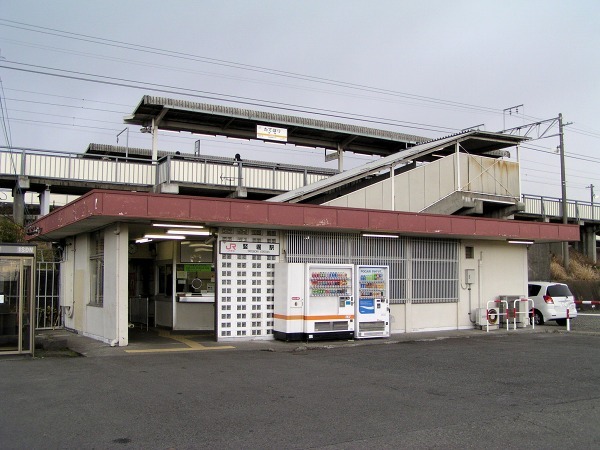 Sudo Station was opened on January 20, 1953. Sudo Station is an unmanned station with a single island platform. 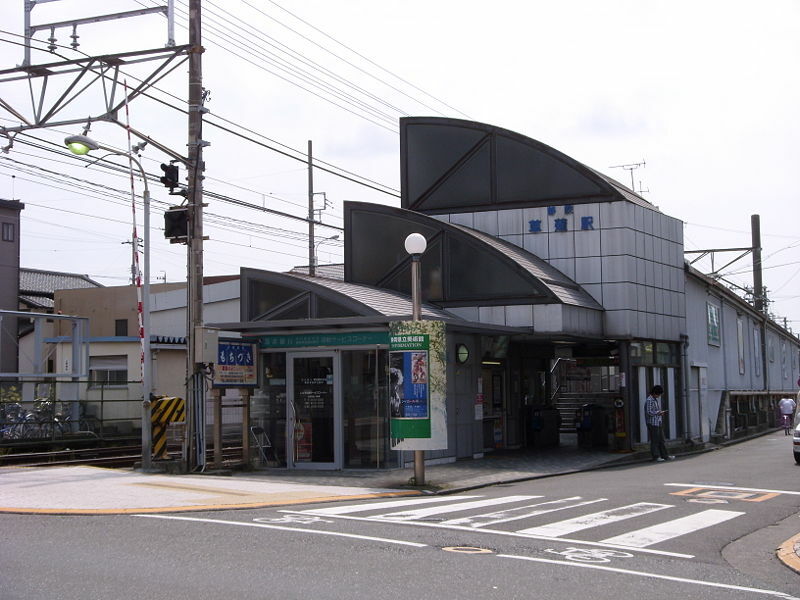 Kamiya Station was opened on January 20, 1953. 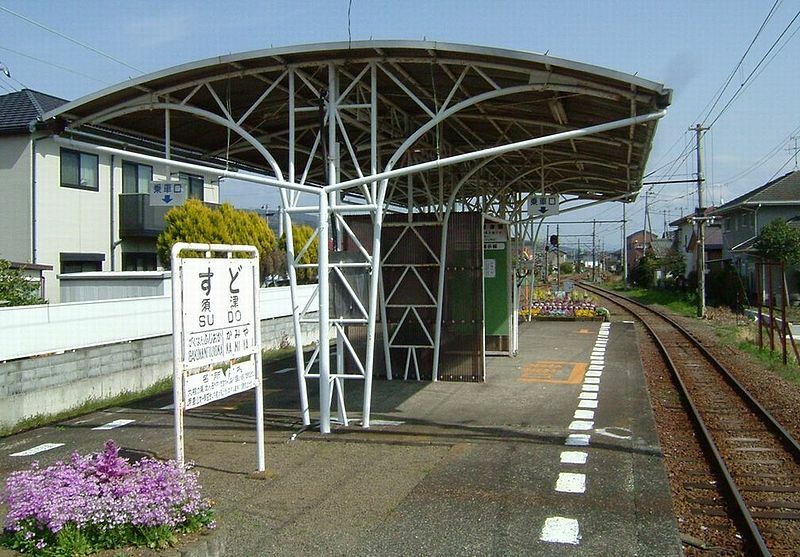 Kamiya Station is an unmanned station with a single side platform. It was rebuilt in 2002 with a sloping platform to permit barrier free access. Gakunan-Enoo Station was opened on January 20, 1953. 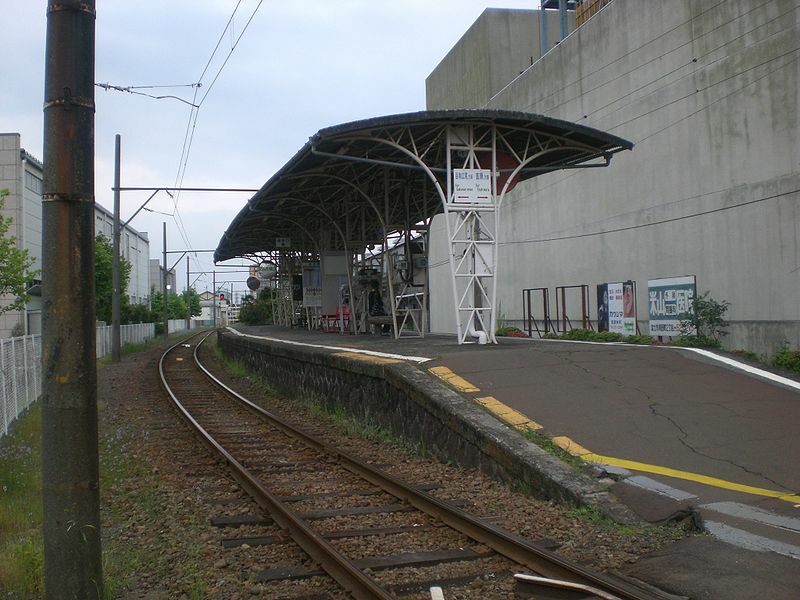 Initial plans to extend the Gakunan Line to Numazu were never realized, and the station remains the final terminus of the Gakunan line. 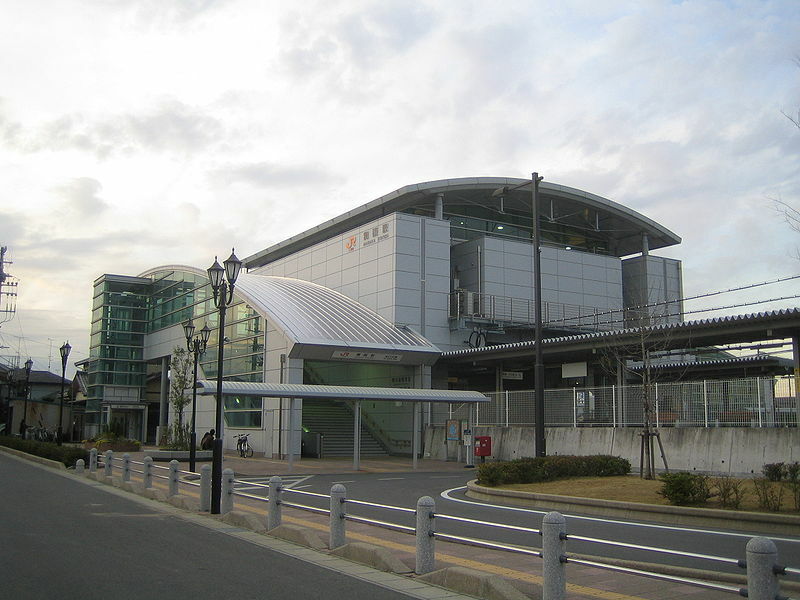 Gakunan-Enoo Station is an unmanned station with a bay platform serving two tracks. 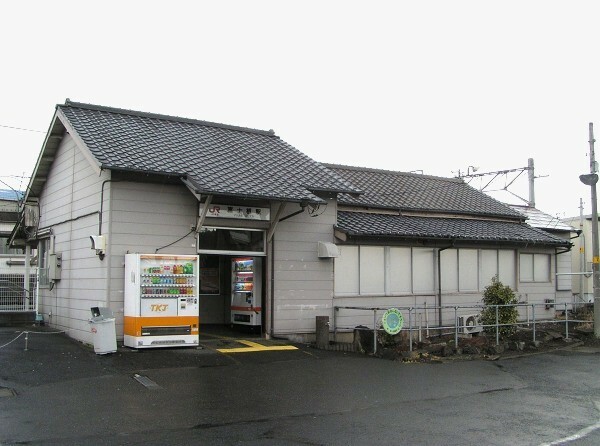 The wooden station building has no ticket machine, and is located in an isolated industrial area with no stores, houses or even vending machines within close walking distance. The nearest factory is operated by UCC Ueshima Coffee Co. The Minobu Line (身延線 Minobu-sen) is a railway line in the Tōkai region of Japan operated by the Central Japan Railway Company (JR Central). It connects Fuji Station in Fuji, Shizuoka to Kōfu Station in Kōfu, Yamanashi, and the Tōkaidō Main Line with the Chūō Main Line trunk railroads. The Fuji Horse Tramway (富士馬車鉄道 Fuji Basha Tetsudō) opened a line from Suzukawa (present Yoshiwara) on the Tōkaidō Main Line to Ōmiya (present Fujinomiya) (the southern end of the current route) in 1890. The Fuji Minobu Railway (富士身延鉄道 Fuji Minobu Tetsudō) purchased the tramway in 1912, and converted it to a steam railway the following year, gradually extending the line to Minobu, a distance of 26.9 miles (43.3 km) by 1920. In 1927, the line was electrified, and in 1928 extended to Kōfu on the Chūō Main Line completing the line with a distance of 54.7 miles (88.0 km). In 1938 the Minobu line was leased by the government, and nationalized in 1941. The alignment at Fuji was changed in 1968 to allow through trains to operate from Tokyo without requiring a reversal of direction, and the Fuji – Fujinomiya section was duplicated between 1969 and 1974. CTC signalling was commissioned in 1982, and freight services ceased in 1987, the year that Central Japan Railway Company (JR Central) took over operations of the Minobu Line following privatization of the Japanese National Railways. The Fujikawa limited express service operates between Kōfu and Shizuoka via Fuji using JR Central 373 series EMU trains. Other trains are all-stations “Local” services, with higher frequencies on the Fuji – Nishi-Fujinomiya and Kajikazawaguchi – Kōfu sections compared to the section in between. 313 series and 211 series EMUs are used on local services. 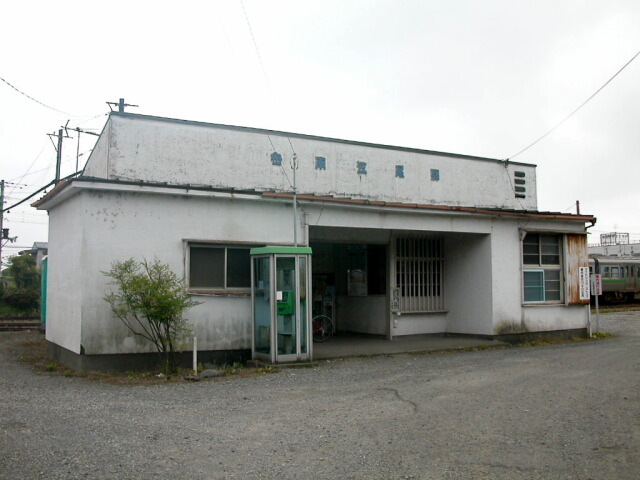 Yunoki Station was opened on July 1, 1931, as the Motoichiba Signal Depot (本市場停留場 Motoichiba Singoba). It was elevated to full station status as the Motoichiba Station (本市場駅 Motoichiba-eki) on October 1, 1938, when the Minobu Line was leased to the national government. It came under control of the Japanese Government Railways (JGR) on May 1, 1941. The JGR became the Japan National Railway (JNR) after World War II. In September 1961, the tracks from Fuji to Tatebori were double tracked, and the Motoichi Station building was demolished and relocated 1.5 kilometers to the east of its former site, at which time it was given its present name. Along with its division and privatization of JNR on April 1, 1987, the station came under the control and operation of the Central Japan Railway Company. 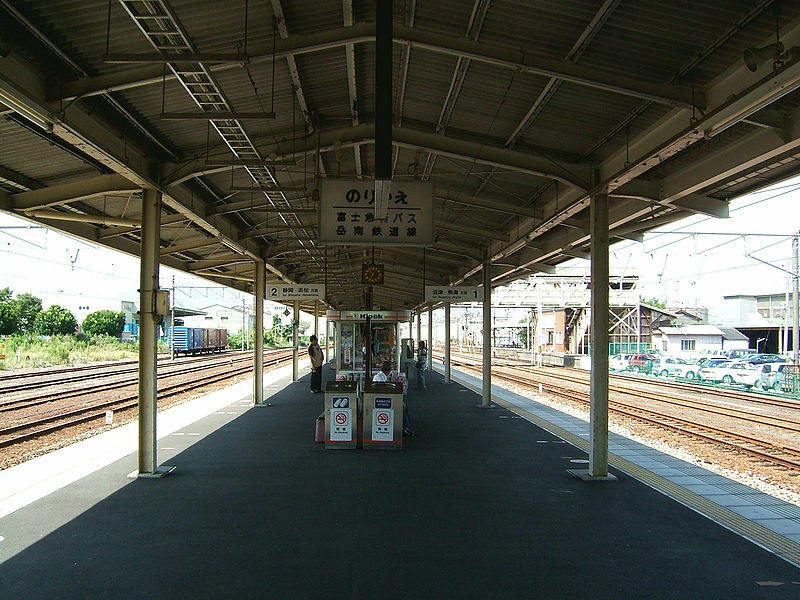 Yunoki Station consists of dual opposing side platforms. The unmanned station building is located underneath the platforms, and has automated ticket machines and automated turnstiles, with installtion of TOICA to be completed by 2010. Tatebori Station was opened on March 8, 1926 as the Tatehori Signal Depot (竪堀停留場 Tatebori Singoba). It was elevated to full station status on November 5, 1927 for both passenger and freight services. When the Minobu Line was leased to the national government from October 1, 1938, the station was renamed “Tatebori”. It came under control of the Japanese Government Railways (JGR) on May 1, 1941. The JGR become the JNR (Japan National Railways) after World War II. Freight services were discontinued in 1969. The same year, the tracks from Fuji to Tatebori were double tracked, and the Tatebori Station building was demolished and relocated 400 meters to the east of its former site. Along with its division and privatization of JNR on April 1, 1987, the station came under the control and operation of the Central Japan Railway Company. Tatebori Station consists of elevated dual opposing side platforms. The ground-level station building has automated ticket machines, automated turnstiles and a manned service counter. Installation of TOICA was completed in 2010. Iriyamase Station was opened on July 20, 1913, as one of the original Minobu Line stations for both passenger and freight services. It came under control of the Japanese Government Railways (JGR) on May 1, 1941. The JGR became the JNR (Japan National Railway) after World War II. Freight services were discontinued in 1972, the same year that the tracks from Fuji to Fujinomiya were expanded to a double track system. Along with the division and privatization of JNR on April 1, 1987, the station came under the control and operation of the Central Japan Railway Company. Iriyamase Station consists of a single island platform. The station building has automated ticket machines, automated turnstiles and a manned service counter. TOICA installation will be completed by the end of 2010. A small park outside the station has a preserved D51 steam locomotive. A spur freight line leads to the nearby Oji Paper Company factory. Fujine Station was opened on July 20, 1913, as one of the original Minobu Line stations for both passenger and freight services. It came under control of the Japanese Government Railway (JGR) on May 1, 1941. The JGR became the Japan National Railway (JNR) after World War II. Freight services were discontinued in 1972, the same year that the tracks from Fuji to Fujinomiya were expanded to a double track system. Along with the division and privatization of JNR on April 1, 1987, the station came under the control and operation of the Central Japan Railway Company. 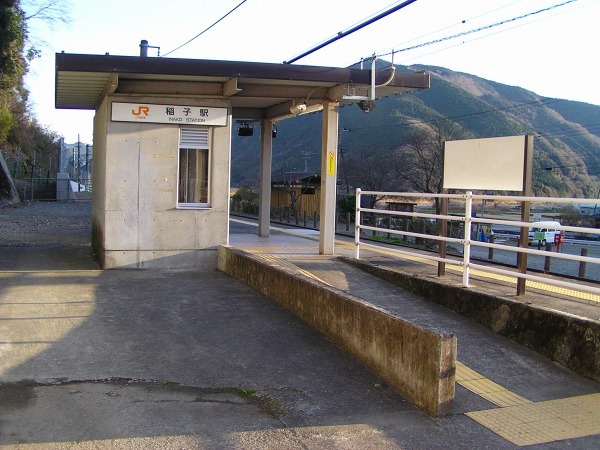 Fujine Station consists of a single island platform. The station building has automated ticket machines, automated turnstiles and has been unmanned since 1998. TOICA installation is scheduled for completion in 2010. A short shunt track from Track 1 allows for parking and storage of various maintenance of way equipment for the Minobu Line. Gendōji Station began as Gendōji Signaling Depot (源道寺停留場 Gendōji singoba) on December 25, 1930, as part of the original Minobu Line. When the line was leased to the national government from October 1, 1938, it was elevated to Gendōji Station for both passenger and freight services. It came under control of the Japanese Government Railways (JGR) on May 1, 1941. The JGR became the JNR (Japan National Railway) after the end of World War II. Freight services were discontinued in 1971, the same year that the tracks from Fuji to Fujinomiya were expanded to a double track system. Along with the division and privatization of JNR on April 1, 1987, the station came under the control and operation of the Central Japan Railway Company. Gendōji Station consists of a dual opposed side platforms. The station building has automated ticket machines, automated turnstiles and has been unmanned since 1983. TOICA installation is scheduled for completion in 2010. Fujinomiya Station was opened on July 20, 1913 as part of the original Minobu Line under the name of Omiya Station (大宮駅 Omiya-eki). It came under control of the Japan National Railway on May 1, 1941 and on October 1, 1942 its name was changed to the present name. The station building was rebuilt in 1983. Regularly scheduled freight service was discontinued from 1984. Along with the division and privatization of JNR on April 1, 1987, the station came under the control and operation of the Central Japan Railway Company. The station was remodeled in 2007 to allow for barrier free access. Fujinomiya Station consists of a single side platform serving Track 1, which is an auxiliary platform used primarily for chartered trains by the Soka Gakkai organization, and a single island platform for Track 2 and Track 3, which handle regularly scheduled services. The station building is built on the overpasses connecting the platforms, and has automated ticket machines, automated turnstiles and a manned service counter. 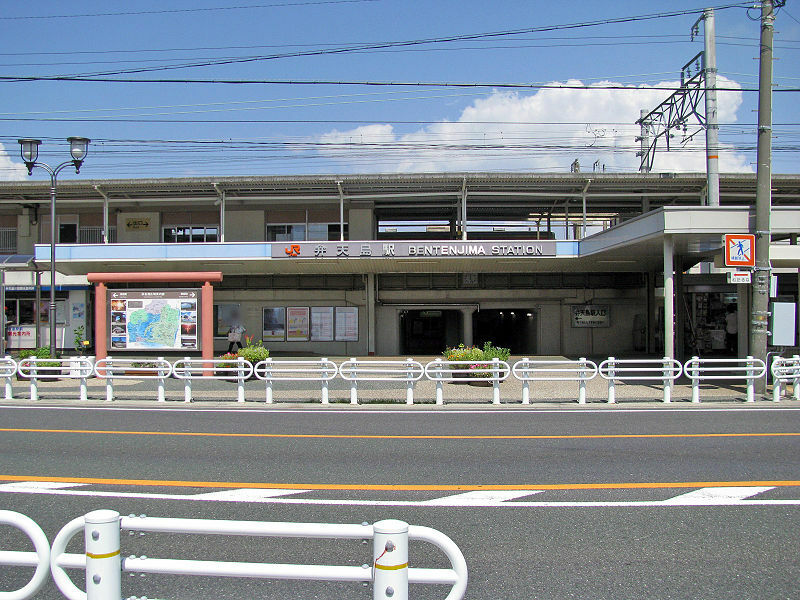 Nishi-Fujinomiya Station was opened on July 15, 1927 as part of the original Minobu Line under the name of Ōmiya-Nishimachi Station (大宮西町駅 Ōmiya-Nishimachi-eki). It came under control of the Japanese Government Railways (JGR) on May 1, 1941 and on October 1, 1942 its name was changed to the present name. The JGR became the JNR (Japan National Railway) after World War II. Regularly scheduled freight service was discontinued from 1960. Along with the division and privatization of JNR on April 1, 1987, the station came under the control and operation of the Central Japan Railway Company. Services by the limited express Fujikawa ceased from October 1, 1995. Nishi-Fujinomiya Station consists of a single island platform serving two tracks, with a third track on a headshunt to permit passage of express trains. The station building has automated ticket machines, automated turnstiles and has a manned service counter. TOICA installation is scheduled for completion by 2010. Numakubo Station was opened on August 15, 1929 as part of the original Minobu Line. It came under control of the Japanese Government Railways (JGR) on May 1, 1941. The JGR became the Japan National Railway (JNR) after the end of World War II. Along with the division and privatization of JNR on April 1, 1987, the station came under the control and operation of the Central Japan Railway Company. 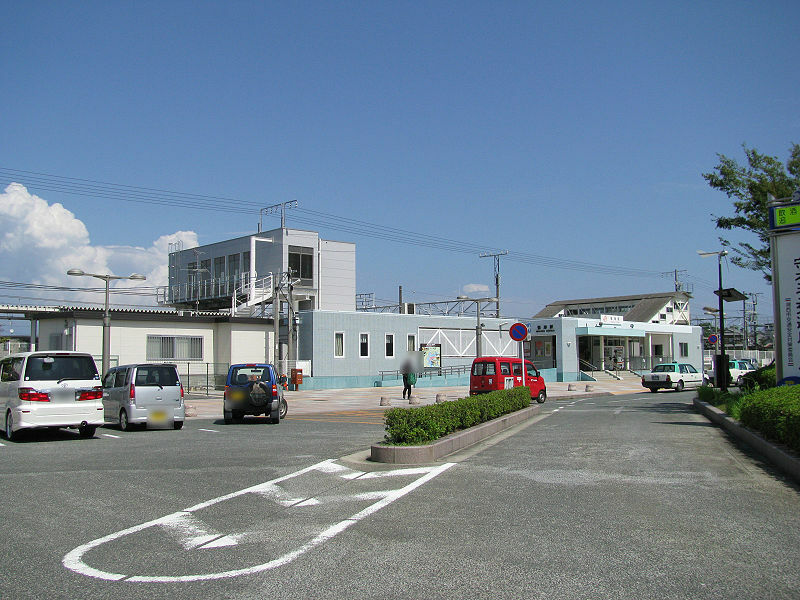 Numakubo Station consists of a single side platform for bi-directional traffic. The platform has a small wooden shelter, but there is no station building. The station is unmanned. The station is noted for its view of Mount Fuji, which has inspired a number of poets. Opposite the station is a stone monument with a poem by Kyoshi Takahama, composed on this location. Shibakawa Station was opened on March 1, 1915 as a terminal station of the original Fuji-Minobu Line for both passenger and freight services. The line was extended past Shibukawa by 1918. It came under control of the Japanese Government Railways on May 1, 1941. The JGR became the JNR (Japan National Railway) after World War II. Freight services were discontinued in 1972. Along with the division and privatization of JNR on April 1, 1987, the station came under the control and operation of the Central Japan Railway Company. Operations by the limited express Fujikawa were discontinued in 1995. From 1998, the station building has been unattended. 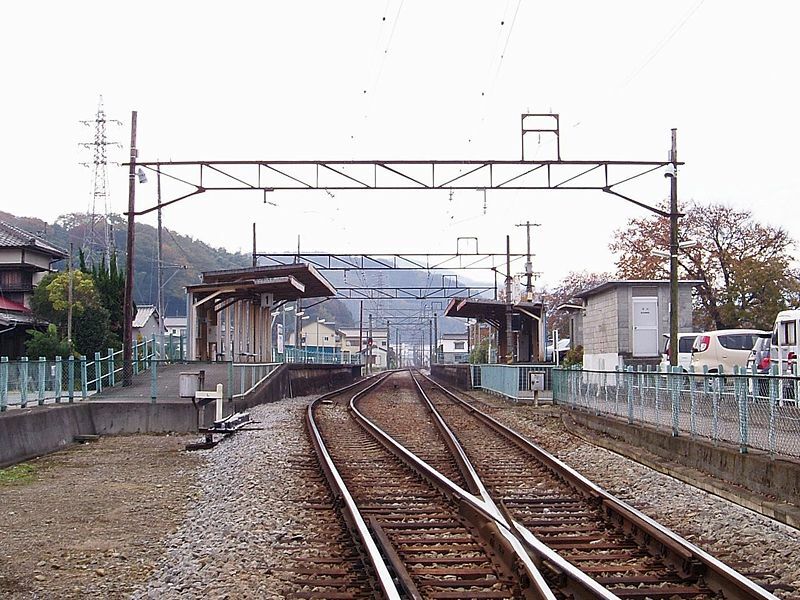 Shibukawa Station consists of a single island platform serving two tracks, with a third track on a headshunt to permit passage of express trains. The station building has automated ticket machines, automated turnstiles and is unmanned. 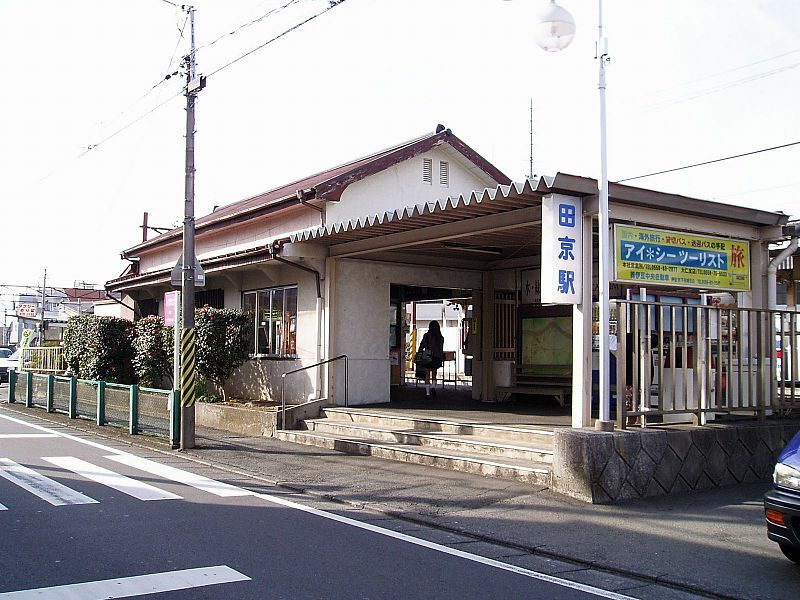 Inako Station was opened on August 15, 1929 as part of the original Minobu Line for both passenger and freight services. It came under control of the Japanese Government Railways (JGR) on May 1, 1941. The JGR became the Japan National Railways (JNR) after World War II. Freight services were discontinued in 1961. Along with the division and privatization of JNR on April 1, 1987, the station came under the control and operation of the Central Japan Railway Company. Inako Station consists of a single side platform for bi-directional traffic, located on a headshunt to permit passage of express trains. The station building has automated ticket machines, automated turnstiles and is unmanned. 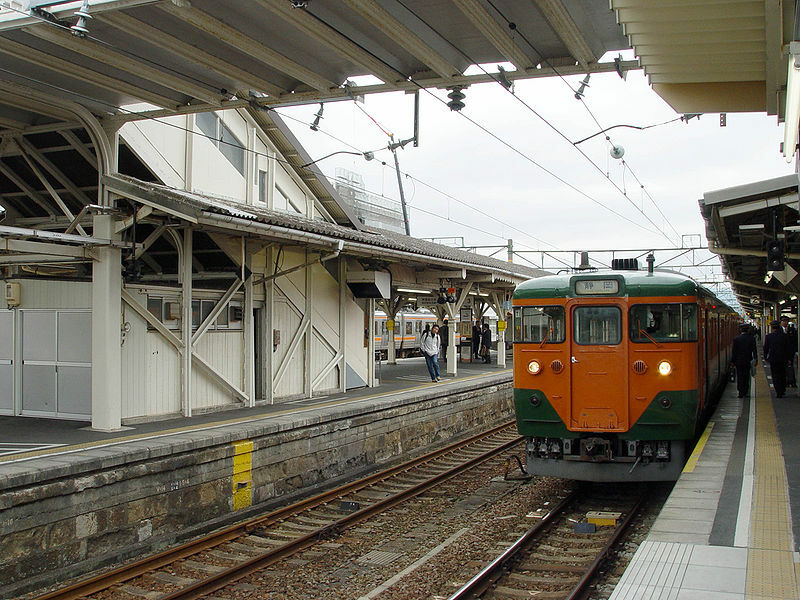 The Sunzu Line opened for operations on May 20, 1898, connecting Zuso-Mishima Station (present-day Mishima-Tamachi Station) with Nanjō Station (present-day Izu-Nagaoka Station). The terminus of the line was moved to Mishima Station (present day Shimo-Togari Station) on June 15, 1898, and the southern end of the line was extended to Ōhito Station on July 17, 1899. The line became part of the Izu Railway (伊豆鉄道 Izu Tetsudō) on July 19, 1907, which in turn became the Sunzu Electric Railway (駿豆電気鉄道 Sunzu Denki Tetsudō) on April 1, 1912. This company merged with Fuji Hydroelectric (富士水電) in 1914, and was spun back out as the Sunzu Railway (駿豆鉄道 Sunzu Tetsudō?) on November 5, 1917. The line was electrified by June 1919, and the southern terminus extended to Shuzenji Station on August 1, 1924. In May 1933, regularly scheduled weekend services to Tokyo Station began operation, but were later suspended during World War II. With the opening of the Tanna Tunnel in 1934 and the re-routing of the Tōkaidō Main Line, the Sunzu ceased operations at Shimotogari Station and its northern terminus became the new Mishima Station. A rail yard and train factory was completed at Daiba Station on June 10, 1937. In 1949, the Japan National Railways began semi-express and limited-express train operations from Tokyo. The Sunzu Railway Company was acquired by the Izuhakone Railway on June 1, 1957. The line was upgraded from 600 V to 1,500 V on September 7, 1959. All freight operations were discontinued as of June 16, 1972. An ATS system was installed in December 1972 and a CTC system in 1985 (upgraded in 2007). As of March 2007, all stations were equipped with automatic wickets compatible with the PASMO Smart card system. Mishima Station (三島駅 Mishima-eki) is an interchange railway station in Mishima, Shizuoka, Japan on the Tōkaidō Main Line and the Tōkaidō Shinkansen of Central Japan Railway Company (JR Central), and was a freight terminal of the Japan Freight Railway Company (JR Freight). It is also a union station with the Izuhakone Railway. The station is 120.7 rail kilometers from Tokyo Station. 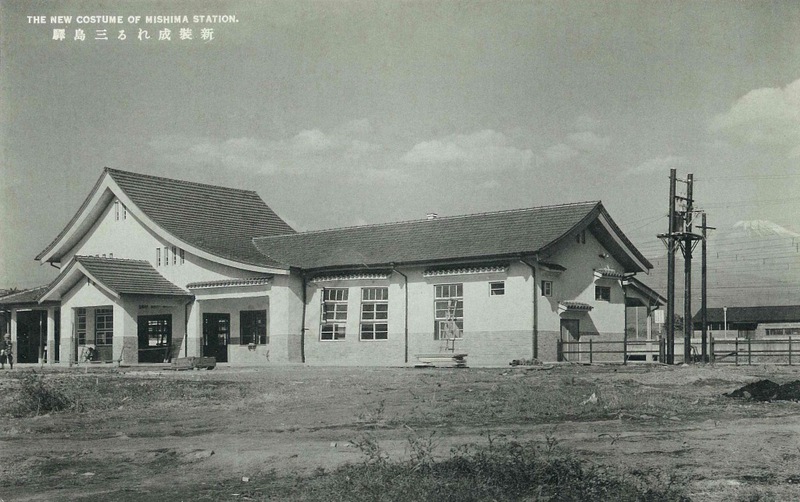 Mishima Station shortly after completion in 1934. Mishima-Hirokōji Station was opened on May 20, 1898. Located in downtown Mishima, it is primarily used by commuter traffic, except during the annual Mishima Matsuri. 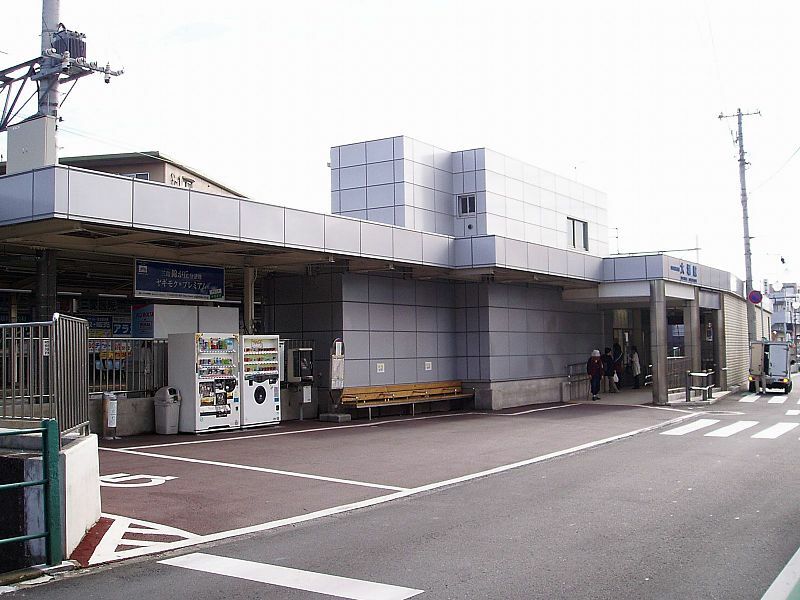 Mishima-Hirokōji Station has a single side platform with a small station building containing automatic ticket machines. Mishima-Tamachi Station was opened on May 20, 1898 as Mishima-machi Station (三島町駅 Mishima-machi eki), the terminal station of the initial phase of line construction extending from Nanjō Station (present-day Izu-Nagaoka Station). The line was connected to the former Mishima Station (present day Shimo-Togari Station) on June 15 of the same year. On May 25, 1919 the line was electrified. The northern terminus of the line was moved to present-day Mishima Station in 1934. The station was renamed to its present name on February 1, 1956. Mishima-Tamachi Station has a side platform and an island platform serving three tracks. The manned station building has automatic ticket machines. Mishima-Futsukamachi Station has a single side platform. The small manned station building has automatic ticket machines. Daiba Station has an island platform and a bay platform serving three tracks. Platforms 1 and 2 are used for both normal and express traffic. Platform 3 is used primarily during commuting hours, and the track at Platform 3 terminates at Daiba Station. The manned station building has automatic ticket machines. Izu-Nitta Station has two opposed side platforms. Platform 1 is the primary platform, and used for bidirectional traffic. Platform 3 is used only during commuting hours for traffic to Mishima. The manned station building has automatic ticket machines. 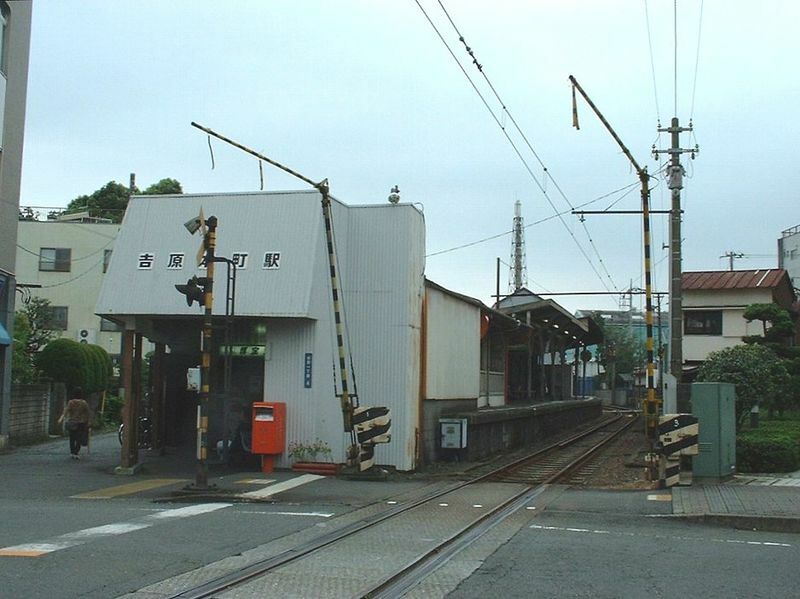 Baraki Station has two opposed side platforms connected to the station building by a level crossing. Platform 2 is the primary platform, and is used for bidirectional traffic. Platform 1 is in occasional use only. The station building is unmanned and has automatic ticket machine. Nirayama Station was opened on August 5, 1900 as Hōjō Station (北条駅 Hōjō-eki). It was given its present name on May 25, 1919. Nirayama Station has two opposed side platforms connected to the station building by a level crossing. Platform 2 is the primary platform, and is used for bidirectional traffic. Platform 1 is in occasional use only. The station building is unmanned and has automatic ticket machines. Izu-Nagaoka Station was opened on May 20, 1898 as Nanjō Station (南条駅 Nanjō -eki) as the terminal station for the first phase of construction of the Sunzu Line. The line was extended onwards to Ōhito on July 17, 1899. The station was given its present name on May 25, 1919. The station building was rebuilt in 1986. Izu-Nagaoka Station has one side platform and one island platform connected to the station building by an overpass. However, only the island platform serving tracks 2 and 3 is in normal use for passenger traffic and is used for bidirectional traffic for both normal and express services. The station building is manned and has automatic ticket machines, a manned service counter and shops. Takyō Station was opened on July 17, 1899 as part of the extension of the Sunzu line from Nanjō Station (present-day Izu-Nagaoka to Ōhito). Takyō Station has an island platform and a side platforms connected to the station building by a level crossing. The station building has both a manned service counter and automatic ticket machines. Ōhito Station was opened on July 17, 1899 as part of the extension of the Sunzu line from Nanjō Station (present-day Izu-Nagaoka. The line was further extended to its preset terminus at Shuzenji in 1924. Ōhito Station has an island platform and a side platform connected to the station building by a level crossing. The station building has both a manned service counter and automatic ticket machines. Makinokō Station was opened on August 1, 1924, as part of the final extension of the Sunzu line from Ōhito to its present terminus at Shuzenji. Makinokō Station has two opposed side platforms connected to the station building by a level crossing. The station building is unmanned and automatic ticket machines. Shuzenji Station was opened on August 1, 1924 as part of the final extension of the Sunzu line from Ōhito. Shuzenji Station has two island platforms serving four tracks. Tracks 1 and 2 are used for local service only; Tracks 3 and 4 are used for both local and limited express Odoriko services. The station building has both a manned service counter and automatic ticket machines. 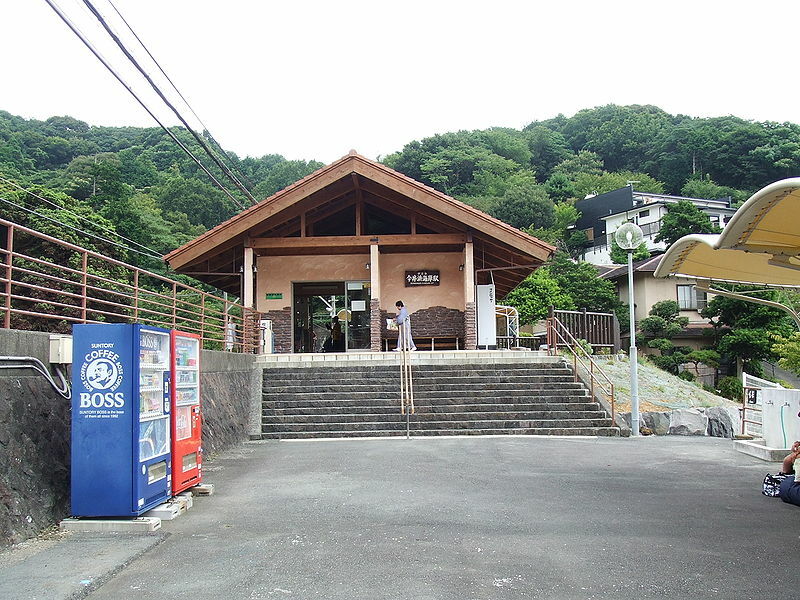 Related Article on Shuzenji Station HERE! The line approximately parallels the eastern coast of the Izu Peninsula, a tourist district noted for its numerous hot spring resorts and golf courses, between Itō Station in Itō and Izukyū-Shimoda Station in Shimoda. The line opened in 1961. Since March 13, 2010, PASMO and Suica cards are accepted on the line. Initial plans called for the Japanese National Railways (JNR) to build a spur line linking Atami on the Tōkaidō Main Line with Shimoda. However, funding was limited in the 1930s due to a combination of a tight fiscal policy under Prime Minister Osachi Hamaguchi during the Great Depression, and a number of technical issues. On March 30, 1935, the initial 8.7km section of the Itō Line linking Atami with Ajiro was opened. The second (8.3km) section from Ajiro to Itō was opened on December 15, 1938. Both sections were electrified at 1500 VDC when opened. Further work was delayed, and then canceled due to the outbreak of World War II. Construction south of Itō resumed when the private-sector Tokyu Corporation acquired the rights to complete the line to Shimoda and established the Izukyū Corporation to manage construction and operations of this section. The line to Shimoda opened in 1961. The northern terminal station for the Izu Kyūkō Line is at Ito Station, from which local trains depart for the southern terminal station of Izukyū-Shimoda. However, several varieties of limited express trains operated by JR East originate at Tokyo Station travel via the Itō Line tracks to Ito, and then terminate at Izukyū-Shimoda. These include the Odoriko and Super View Odoriko named trains. Similarly, the Resort Odoriko operated by the Izu Kyūkō Line also makes the same run, but using different rolling stock. Itō Station opened on December 15, 1938 when the section of the Itō Line linking Ajiro with Itō was completed. On December 10, 1961, Izu Kyūkō began operations on a line linking Itō with Shimoda. Freight services were discontinued from October 1, 1980, but were resumed on March 31, 1987. On April 1, 1987 along with division and privatization of the Japan National Railway, East Japan Railway Company started operating this station. Itō Station has a single island platform serving Track 1 and Track 2 and a single side platform serving Track 3. The platforms are connected by an underpass. The Izu Kyūkō trains use the outer Tracks 1 and 3, whereas the Itō Line pulls into Track 2, and reverses out in the opposite direction. The station building has automated ticket machines and Suica and PASMO automated turnstiles; its “Green Window” service counter is open between 9:00 and 18:00. Minami-Itō Station was opened on December 10, 1961. Minami-Itō Station has a single elevated island platform, with the station building underneath. Kawana Station was opened on December 10, 1961. The station building was rebuilt in 1980. This station has two ground-level side platforms. 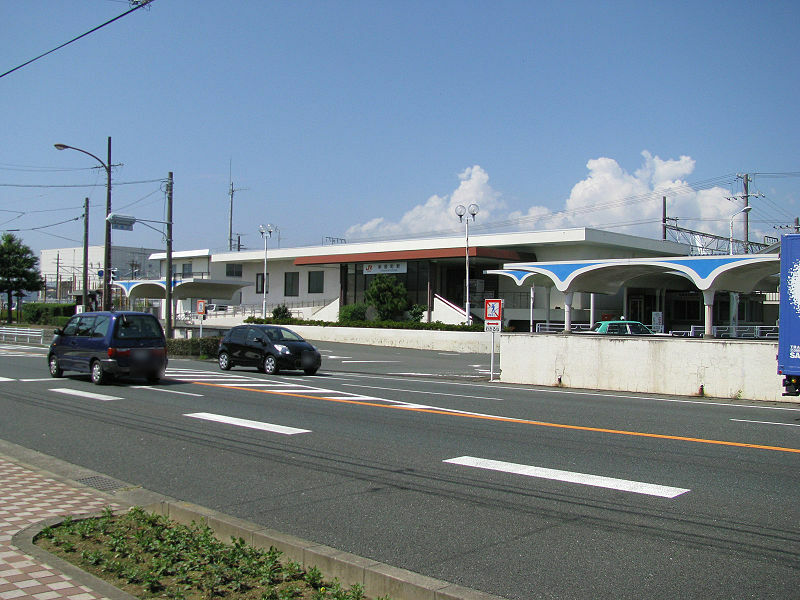 Futo Station was opened on December 10, 1961. Futo Station has two ground-level side platforms. 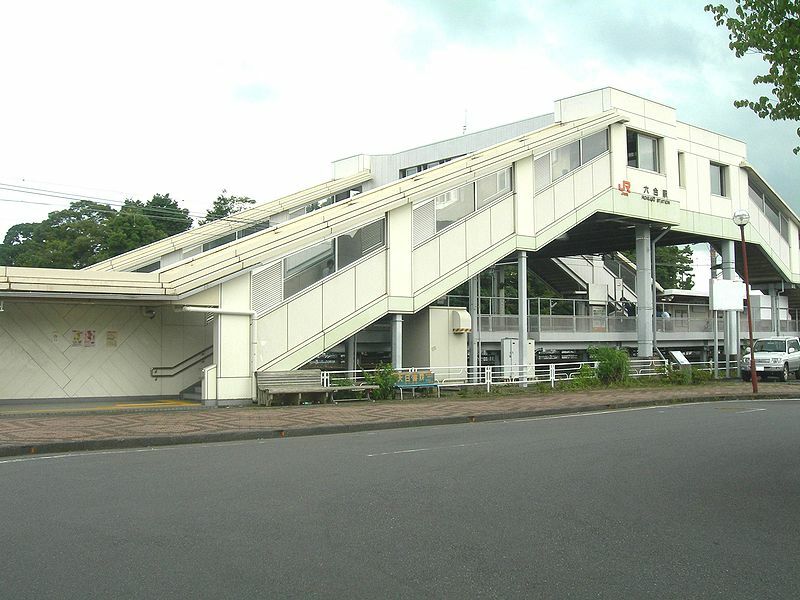 Jōgasaki-Kaigan Station was opened on March 15, 1972. 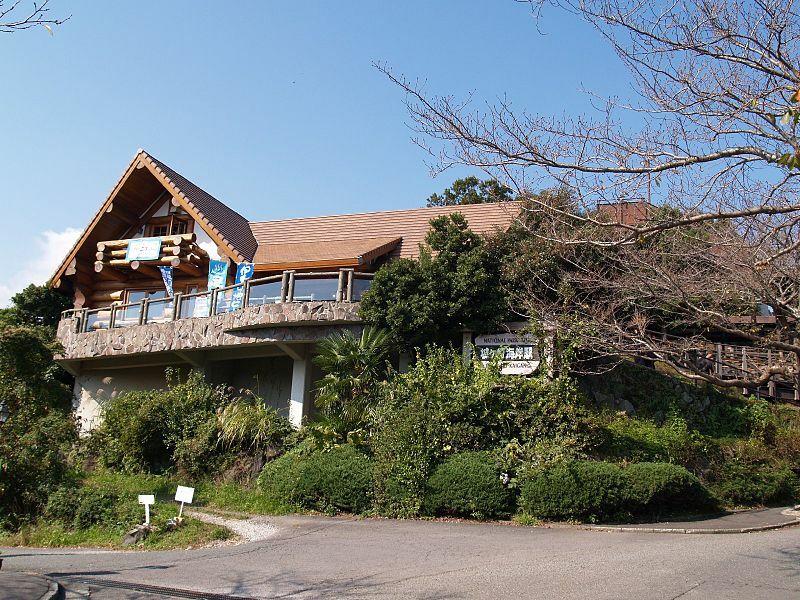 The station building was rebuilt as a log house in commemoration of 30th anniversary of the opening of the Izu Kyūkō Line in 1991. Jōgasaki-Kaigan Station has one ground-level side platform. 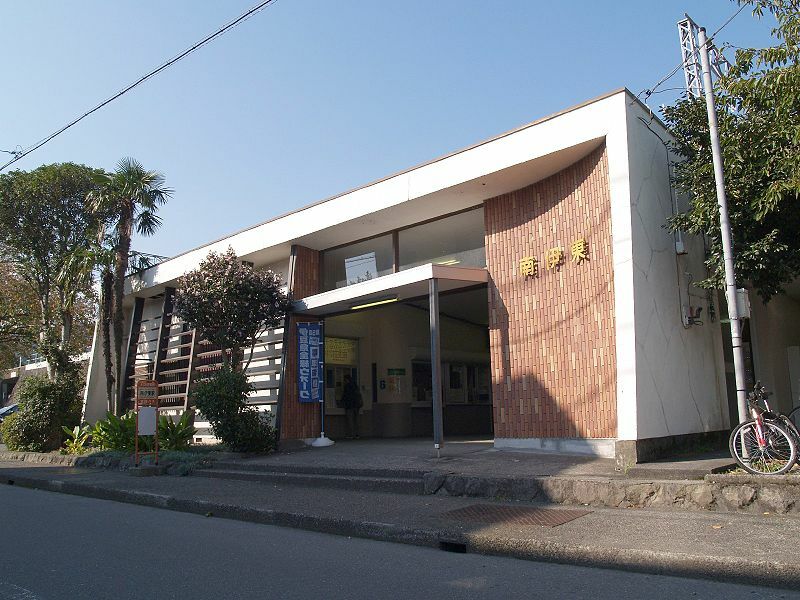 Izu-Kōgen Station opened on December 10, 1961. 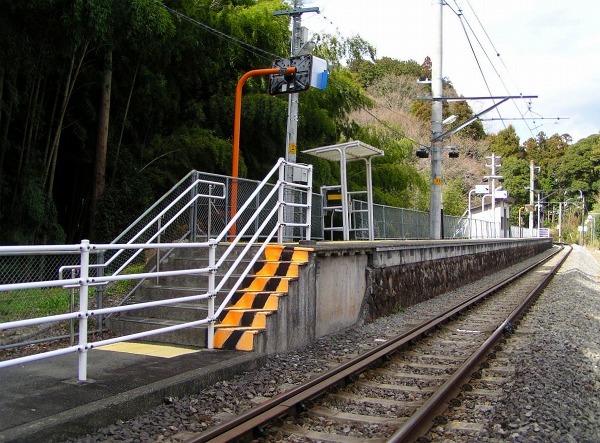 Izu-Kōgen Station consists of a side platform and an island platform serving three tracks. 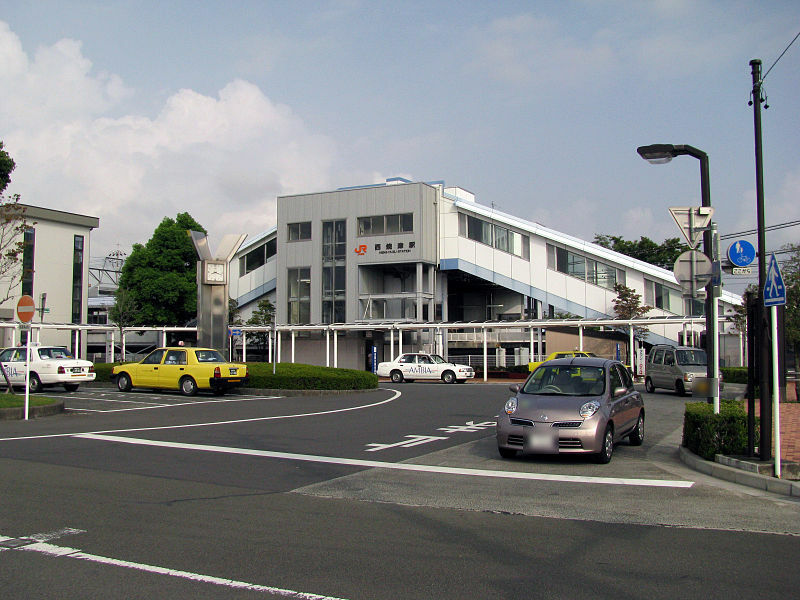 Izu-Ōkawa Station was opened on December 10, 1961. 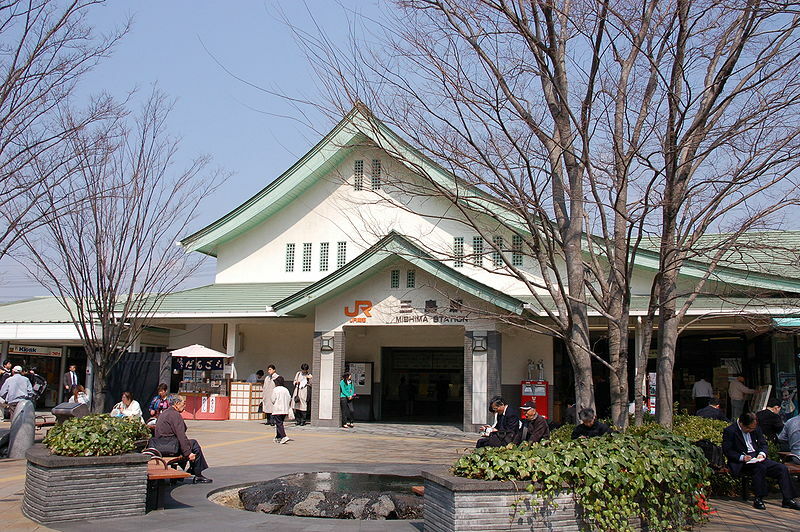 The station is located next to Ōkawa hot springs, and there is a foot bath on the grounds of the station. Izu-Ōkawa Station has two opposing side platforms serving two tracks. Track 2 is used for trains in both directions, and is the track in normal use. Track 1 is used at times to permit the passage of an express train, as the station does not have a headshunt. 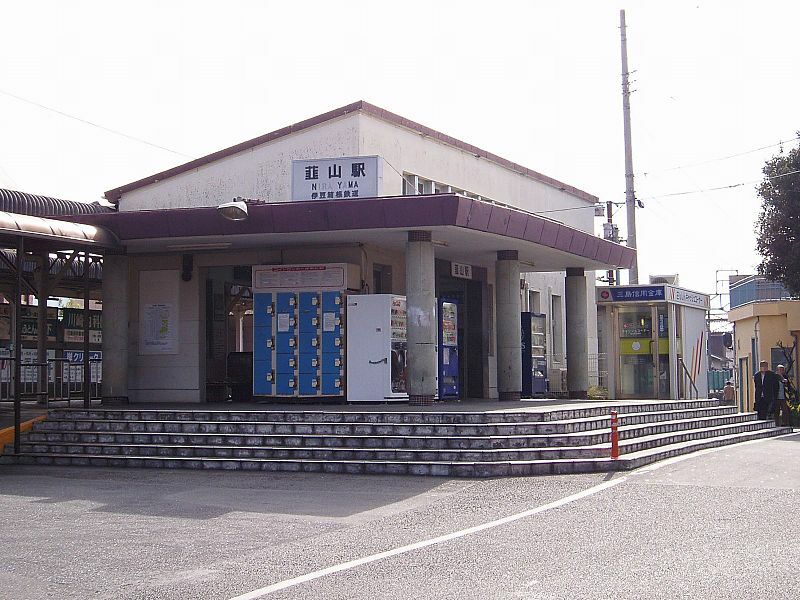 Izu-Hokkawa Station was opened on December 10, 1961. 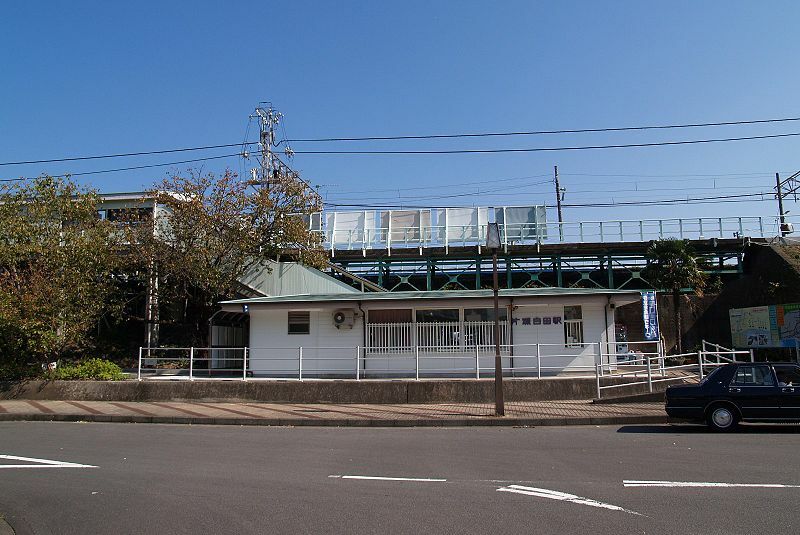 Izu-Hokkawa Station has a single elevated side platform. The station building is located underneath. Izu-Atagawa Station was opened on December 10, 1961.
zu-Atagawa Station has a single elevated island platform serving two tracks. The station building is underneath. Katase-Shirata Station was opened on December 10, 1961. Katase-Shirata Station has two elevated opposing side platforms serving two tracks. The platforms are connected by an overpass, and the station building is underneath the platforms and tracks. 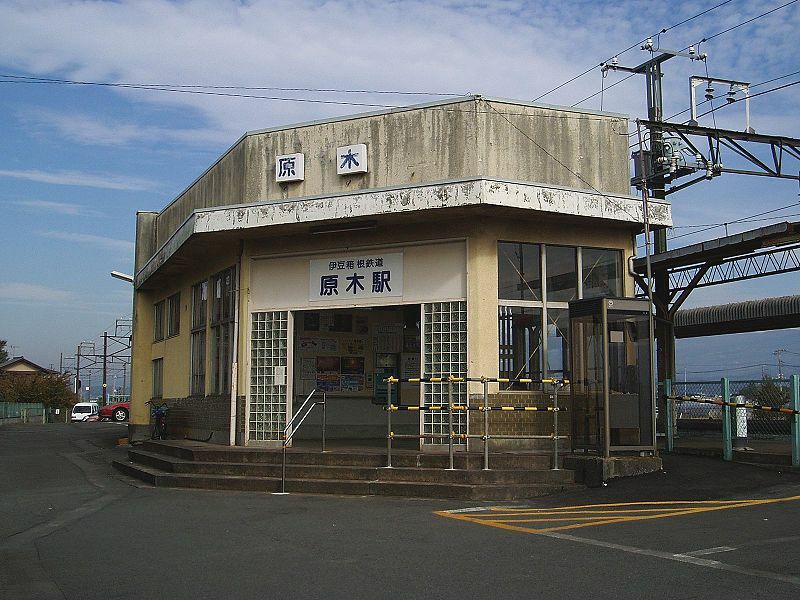 Izu-Inatori Station was opened on December 10, 1961. 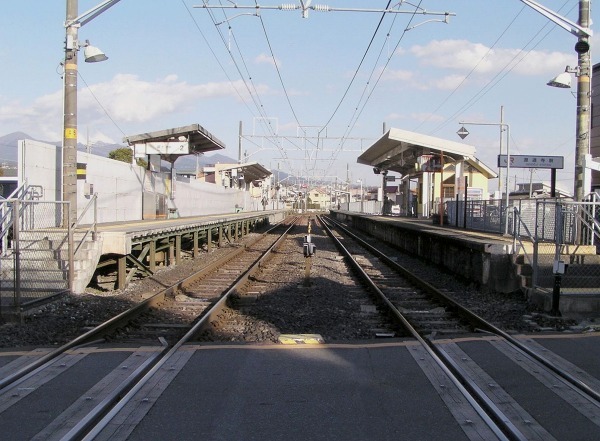 Izu-Inatori Station has two elevated opposing side platforms serving two tracks. The platforms are connected by an overpass, and the station building is underneath the platforms and tracks. 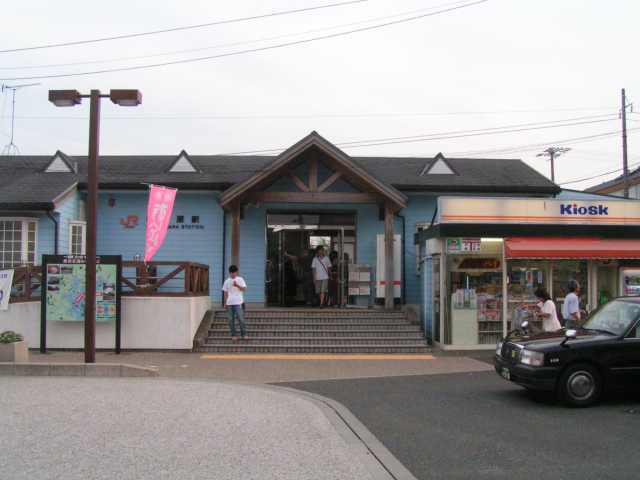 Imaihama-Kaigan Station was opened on December 10, 1961, initially as a temporary stop only open during the summer months due to its proximity to nearby swimming beaches. It became a permanent station on March 1, 1969. Imaihama-Kaigan Station has one island platform sandwiched between two tunnels. The platform length is equivalent in length to eight train cars access to trains is limited only to the middle seven cars. 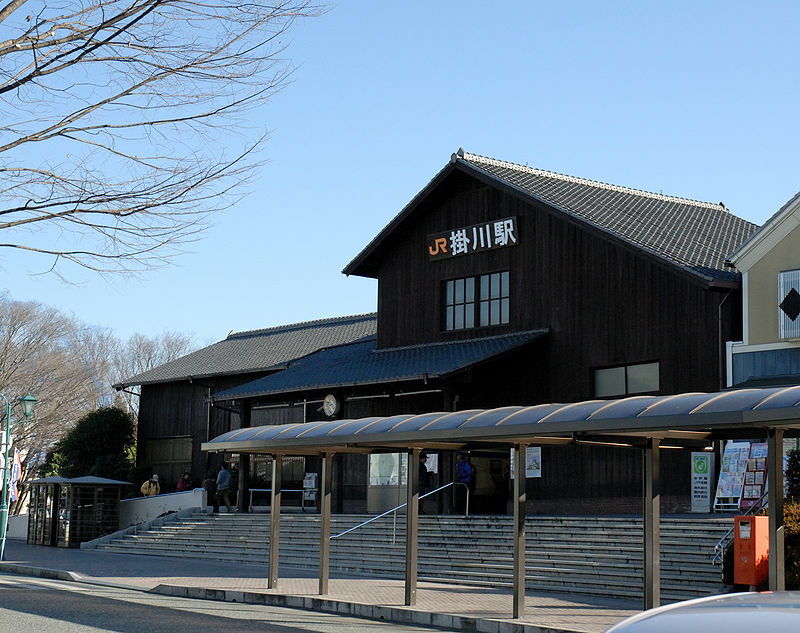 The station building, which is located alongside Japan National Route 135, was rebuilt in a log cabin style, using wood from the surrounding forests. 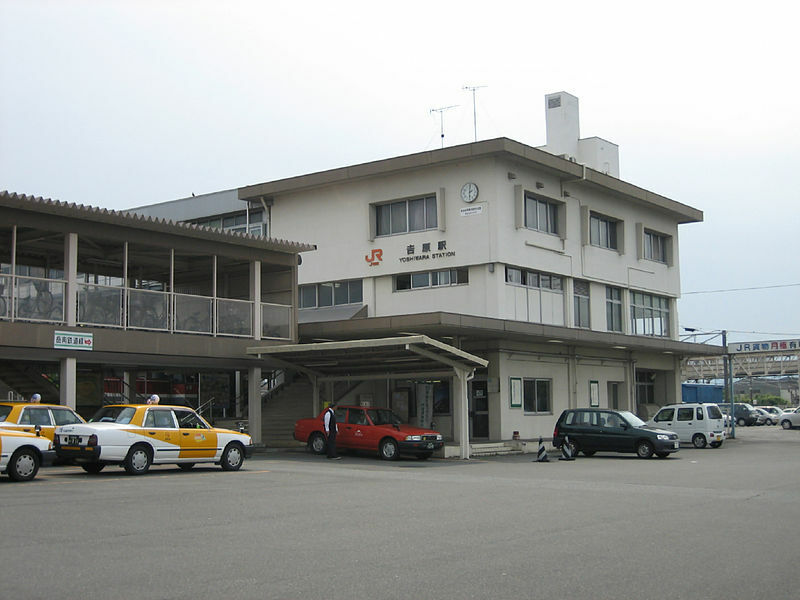 Kawazu Station was opened on December 10, 1961. Kawazu Station has two elevated opposing side platforms serving two tracks. The platforms are connected by an underpass, and the station building is underneath the platforms and tracks. Inazusa Station was opened on December 10, 1961. Inazusa Station has a single island platforms serving two tracks. Rendaiji Station was opened on December 10, 1961. 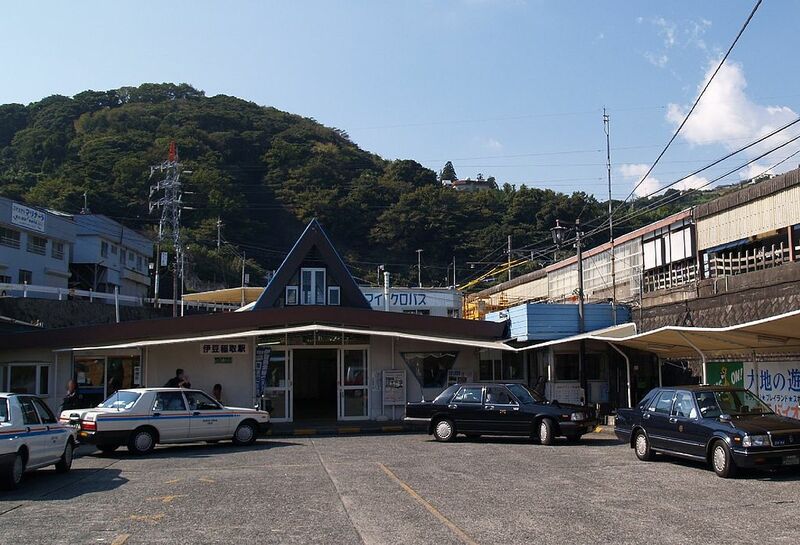 Izukyū-Shimoda Station forms the southern terminus of the Izu Kyūkō Line. Izukyū-Shimoda Station opened on December 10, 1961.Izukyū-Shimoda Station has a double bay platform serving three tracks. Tracks 1 and 3 are used for normal train service, and Track 2 is used by the limited express Odoriko. This is the only line operated by the private railway operator Shizuoka Railway (Shizutetsudo). The line has a fairly frequent service, with trains operating every 5 minutes during the peaks, and every 6 minutes during the daytime and at weekends, linking Shin-Shizuoka and Shin-Shimizu in 20 minutes. All the trainsets are formed of two cars, and are driver-only operated. All the stations accept LuLuCa, a smart card ticketing system. They accept PiTaPa and ICOCA as well. The line opened in 1908 as a 762 mm (2 ft 6 in) gauge line to the Shin-Shimizu wharf, and was regauged to 1,067 mm (3 ft 6 in) and electrified at 600 V DC in 1920. The line was double-tracked in sections between 1925 and 1930 except the section to the wharf, which closed in 1945. 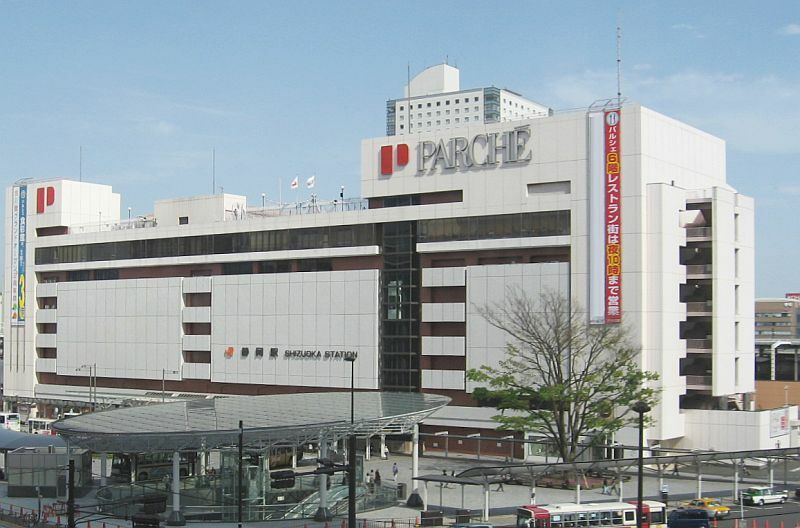 Shin Shizuoka (Cenova Department Store)-Hiyoshicho-Otowacho-Kasugacho-Yunoki-Naganuma-Furusho-Ken Sogo Undojo-kenritsu Bijutsukan Mae-Kusanagai-Mikadodai-Kitsunegasaki-Sakurabashi-Ireoka-Shin Shimizu (the last one not to be confused with Shimizu JR Station!). Shin-Shizuoka Station was opened on December 9, 1908 as Takajōmachi Station (鷹匠町駅 Takajōmachi-eki). It was renamed “Shin-Shizuoka” on October 1, 1954. 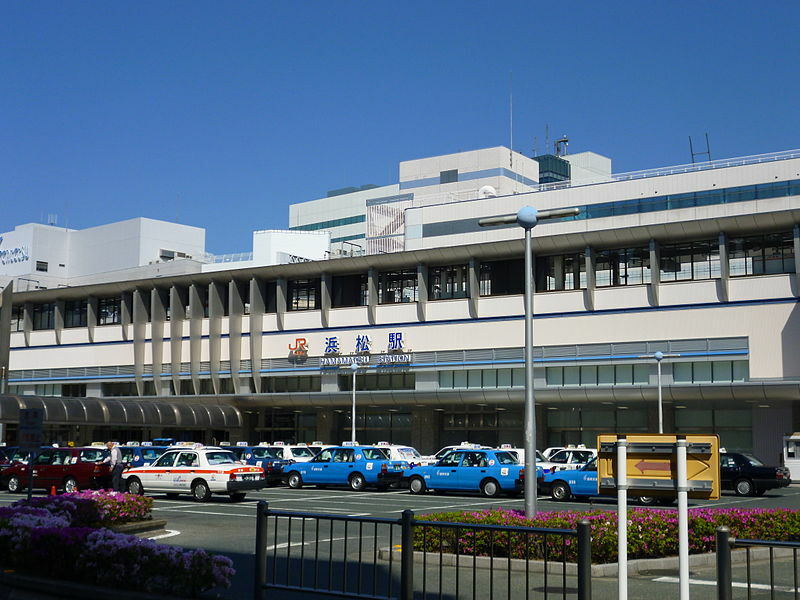 Shizuoka’s city tram system was discontinued in September 1962, and a large bus terminal was established at Shin-Shizuoka Station on May 10, 1966. 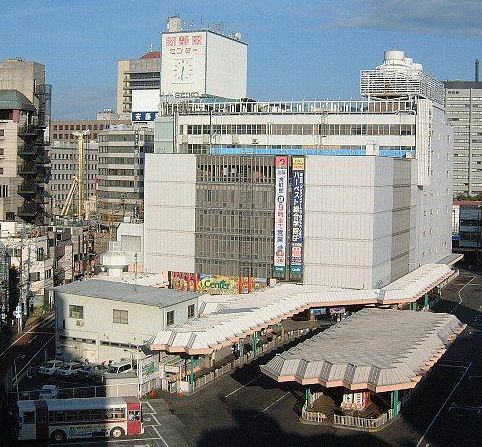 The Shin-Shizuoka Center department store above the station was opened on May 15, 1966. This was closed and demolished at the end of January 2009, and a new, larger shopping complex called Cenova opened October 5, 2011. Shin-Shizuoka Station has two island platforms serving three tracks. The station building has automated ticket machines, and automated turnstiles, which accept the LuLuCa smart card ticketing system as well as the PiTaPa and ICOCA IC cards. Hiyoshichō Station was established as Daisho Station (台所町駅 Daisho-eki) on December 9, 1908. It was renamed to its present name after World War II. Hiyoshichō Station has two opposed side platforms with a level crossing at one end. The station has automated ticket machines, and automated turnstiles, which accept the LuLuCa smart card ticketing system as well as the PiTaPa and ICOCA IC cards. Otowachō Station was established as Kiyomizukōen Station (きよみず公園前駅 Kiyomizukōen-eki) on December 9, 1908. It was renamed to its present name after World War II. towachō Station has a single island platform with a level crossing at one end. The station has automated ticket machines, and automated turnstiles, which accept the LuLuCa smart card ticketing system as well as the PiTaPa and ICOCA IC cards. Kasugachō Station was established as Kasuga-nichōme Station (春日二丁目駅 Kasuga-nichōme-eki) on December 9, 1908. It was renamed to its present name after World War II. Kasugachō Station has a single island platform with a level crossing at one end. The station building is built on one end of the platform, and has automated ticket machines, and automated turnstiles, which accept the LuLuCa smart card ticketing system as well as the PiTaPa and ICOCA IC cards. 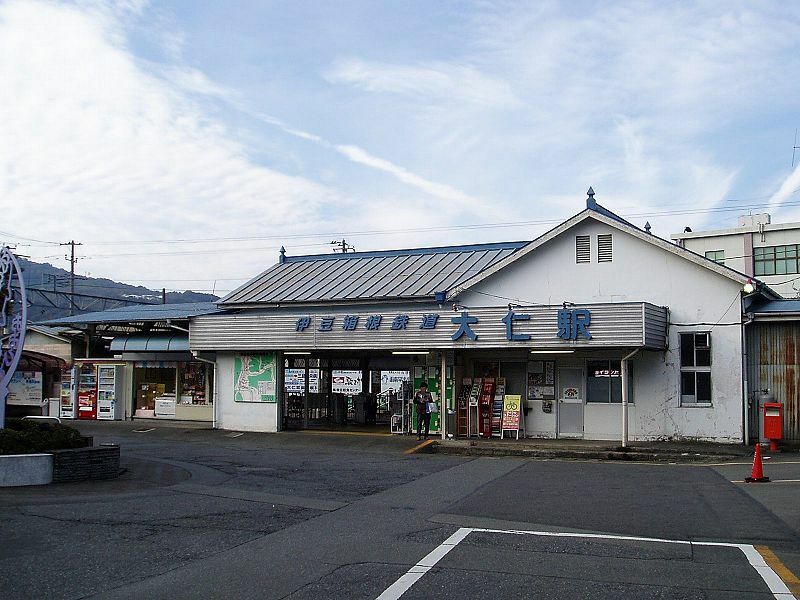 Yunoki Station was established as Magarikane Station (曲金駅 Magarikane-eki) on December 9, 1908. 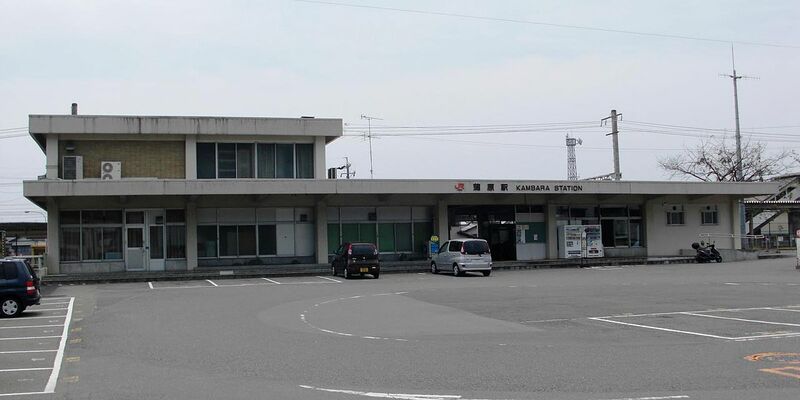 It was renamed to Gokoku Jinjamae Station (護国神社前駅 Gokoku Jinjamae-eki) in 1942, due to its proximity to the Shizuoka Prefectural Gokoku Jinja, a Shinto shrine to the war dead, and branch of Yasukuni Shrine. The station received its present name after World War II. Yunoki Station has two parallel side platforms. The station building is built onto one end of one of the platforms, and has automated ticket machines, and automated turnstiles, which accept the LuLuCa smart card ticketing system as well as the PiTaPa and ICOCA IC cards. 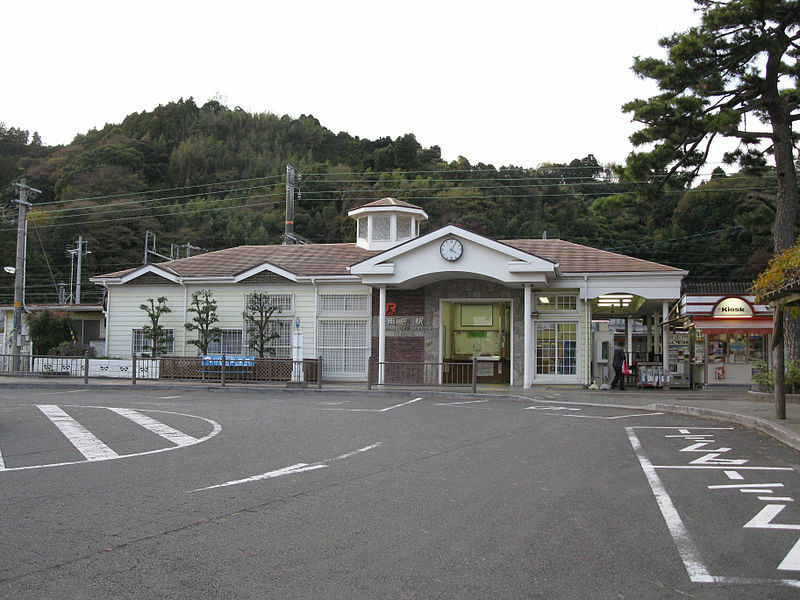 Naganuma Station was established on December 9, 1908. North of the station is the main Rail yard of the Shizuoka-Shimizu Line. Naganuma Station has a single side platform and an island platform on a head shunt servicing three tracks, with a level crossing at one end. The station building, located at the end of one of the platforms, has automated ticket machines, and automated turnstiles, which accept the LuLuCa smart card ticketing system as well as the PiTaPa and ICOCA IC cards. 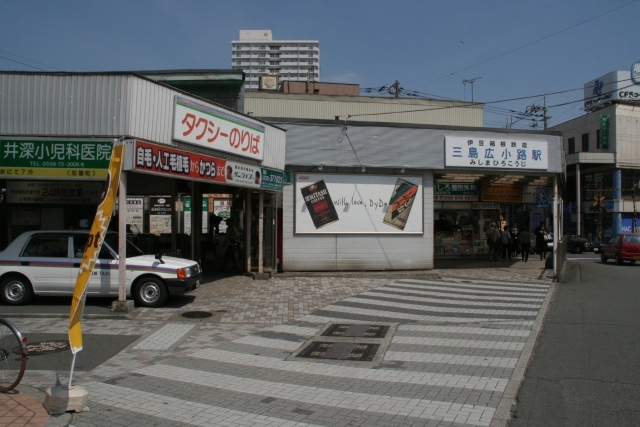 Furushō Station was established on December 9, 1908. Furushō Station has two opposed side platforms, with a level crossing at one end. The station building, located at the end of one of the platforms, has automated ticket machines, and automated turnstiles, which accept the LuLuCa smart card ticketing system as well as the PiTaPa and ICOCA IC cards. Ken-Sōgō Undōjō Station was established on December 9, 1908 as Undōjō Mae Station. The station was reconstructed and renamed in 1991. Ken-Sōgō Undōjō Station has two island platforms, with head shunts on each platform, to allow for the passage of express trains in either direction. The station building, located at the end of one of the platforms, has automated ticket machines, and automated turnstiles, which accept the LuLuCa smart card ticketing system as well as the PiTaPa and ICOCA IC cards. 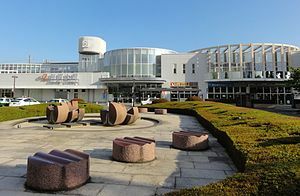 Kenritsu Bijutsukanmae Station was established on March 25, 1986 with the relocation of the Shizuoka Prefectural Art Museum nearby. It is the newest station on the Shizuoka-Shimizu Line. Kenritsu Bijutsukanmae Station has two side platforms, with the elevated station building built on a cantilever above the tracks in between the two platforms. The station building has automated ticket machines, and automated turnstiles, which accept the LuLuCa smart card ticketing system as well as the PiTaPa and ICOCA IC cards, as well as a copy of Rodin’s The Thinker. 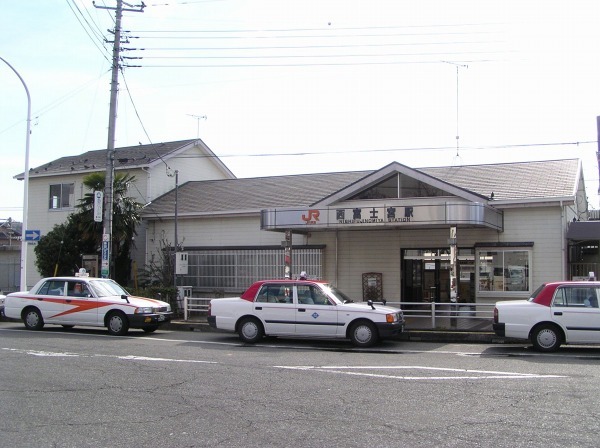 Kusanagi Station was established on December 9, 1908. Located in the busy suburb of Kusanagi, Kusanagi Station services several local schools and companies, including the University of Shizuoka. In 3 minutes one can walk from the station to transfer to the Tōkaidō Main Line via the line’s own Kusanagi Station. Kusanagi Station has two side platforms. The station building has automated ticket machines, and automated turnstiles, which accept the LuLuCa smart card ticketing system as well as the PiTaPa and ICOCA IC cards. Mikadodai Station was established as Udo-gakkōmae Station (有度学校前駅 Udō-gakkōmae-eki) on December 9, 1908. It was renamed to its present name on March 1, 1961. Mikadodai Station has a single island platform with a level crossing at one end. The station building is built on one end of the platform, and has automated ticket machines, and automated turnstiles, which accept the LuLuCa smart card ticketing system as well as the PiTaPa and ICOCA IC cards. 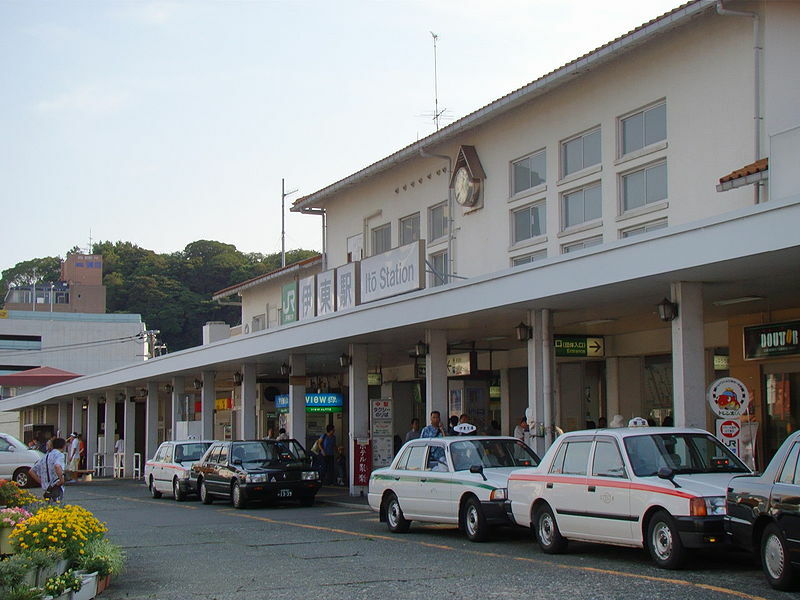 Kitsunegasaki Station was established as Uehara Station (上原駅 Uehara-eki) on December 9, 1908. In 1926, the predecessor of the Kitsunegasaki Young Land Amusement Center opened, and in 1927 the Uehara Station was renamed Yuenmae Station (遊園前駅 Yuenmae-eki?. The amusement part closed during World War II, and in 1944, Yuenmae Station was renamed as Kitsunegasaki Station. However, after the end of the war, the amusement park reopened, and as part of the promotional campaign created by Shizuoka Railway to boost the popularity of the park, the station name was changed from 1968 to Kitsunegasaki Yangu-randomae Station ( 狐ヶ崎ヤングランド前駅 Kitsunegasaki Yangu-randomae-eki). 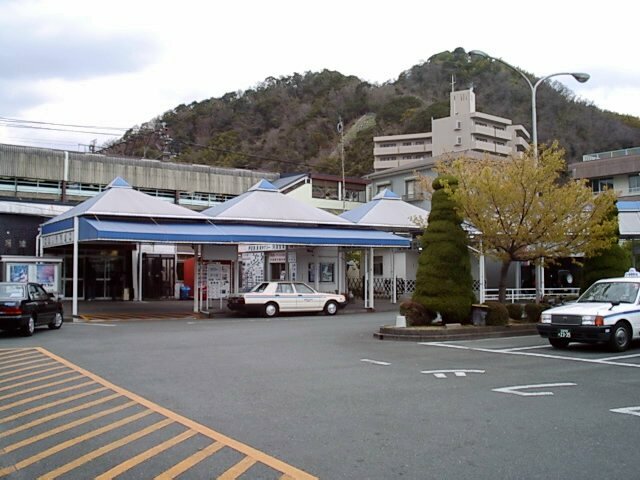 It reverted to the simpler name of Kitsunegasaki Station in 1985. Kitsunegasaki Station has a single island platform with a level crossing at one end. The station building is built on one end of the platform, and has automated ticket machines, and automated turnstiles, which accept the LuLuCa smart card ticketing system as well as the PiTaPa and ICOCA IC cards. Sakurabashi Station was established on December 9, 1908. Sakurabashi Station has two parallel side platforms, which are offset so that the end of one platform is close to the head of the other, with a level crossing connecting the two platforms. The station building is built on one end of the platform, and has automated ticket machines, and automated turnstiles, which accept the LuLuCa smart card ticketing system as well as the PiTaPa and ICOCA IC cards. Irieoka Station was established on December 9, 1908. Irieoka Station has a single island platform with a level crossing at one end. The station building is built on one end of the platform, and has automated ticket machines, and automated turnstiles, which accept the LuLuCa smart card ticketing system as well as the PiTaPa and ICOCA IC cards. 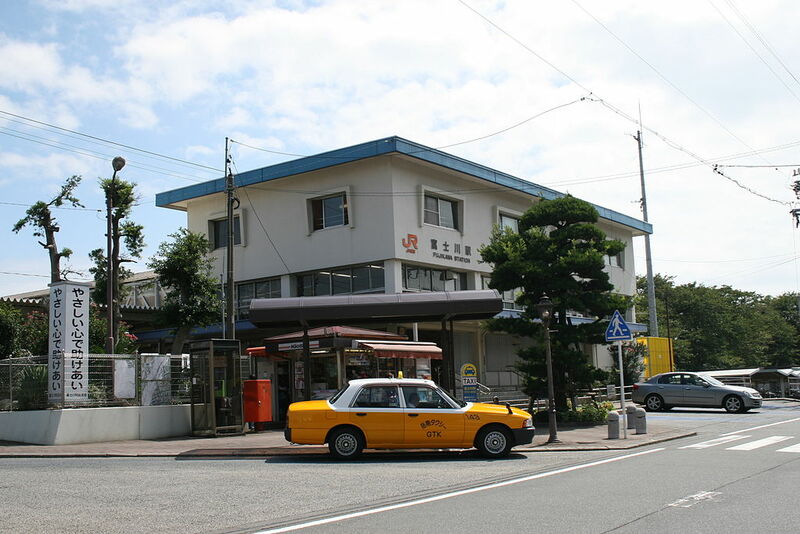 Shin-Shimizu Station was established on May 8, 1908. Shin-Shimizu Station has a double bay platform. The station building has automated ticket machines, and automated turnstiles, which accept the LuLuCa smart card ticketing system as well as the PiTaPa and ICOCA IC cards.